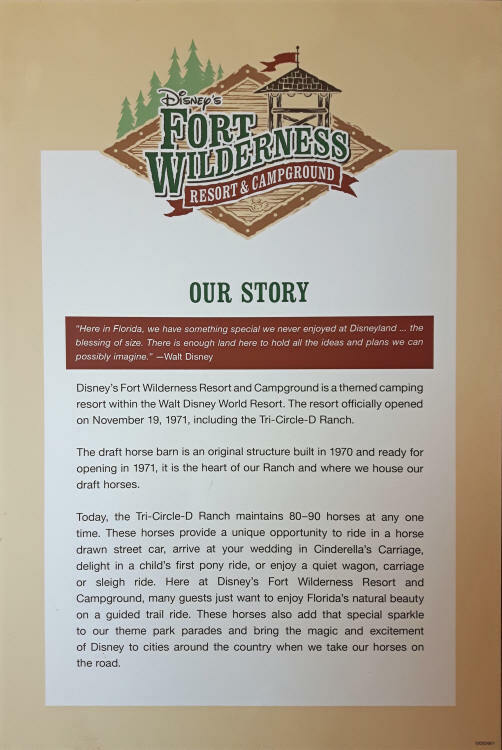 When we sold our motor home last spring we knew in the back of our minds that sooner or later we would miss Fort Wilderness. 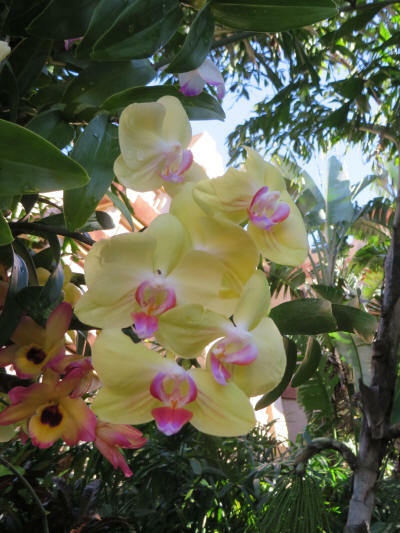 Carol and I had agreed that when we started pining for our 'happy place' we could head back and see how we enjoyed staying in a rented travel trailer. We'll that time has come! 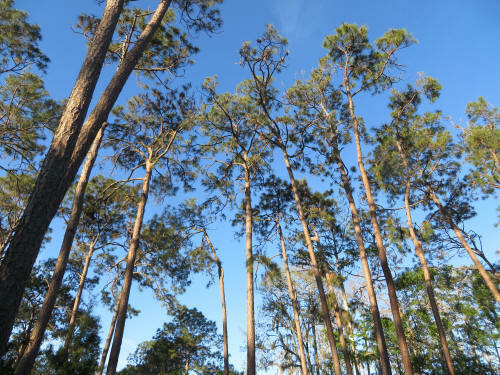 We've been missing Fort Wilderness like crazy and it's time to remedy that! But this will be a different trip . . . we're going to load the dogs into the car rather than the motor home and we'll be able to drive a little further each day to make the trip a bit quicker. 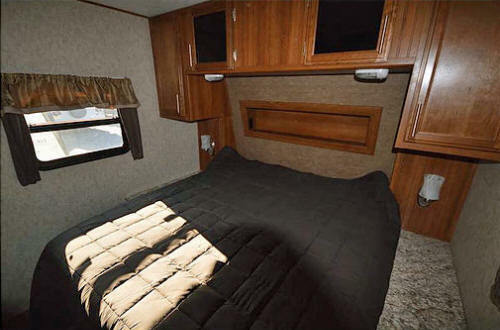 Our 'home away from home' will be all set up and waiting for us when we get there. We were up at 5:30 a.m. and scrambled to get on the road as soon as we could. The car was all packed and waiting in the garage so as soon as the dogs were fed and loaded in the car we were off. We pulled away at 6:35 and made a quick coffee stop at Timmie's before hitting the freeway. We crossed the Thousand Island Bridge in complete darkness. One of the prettiest vistas in our entire country was right there around us and we couldn't see it . . . maybe on the way home we will! There was one gate open at US Customs, and about 20 vehicles in front of us. After we waited about 20 minutes in line a second gate opened, at about 7:15, and most of the cars ahead of us darted to the new line. We instantly moved to second in line and we were through customs before any of those who had been in front of us. Traffic was light and the weather was good. It was overcast most of the day, with a few periods of light drizzle, but never enough to slow traffic. That was good because we had a very long day planned. 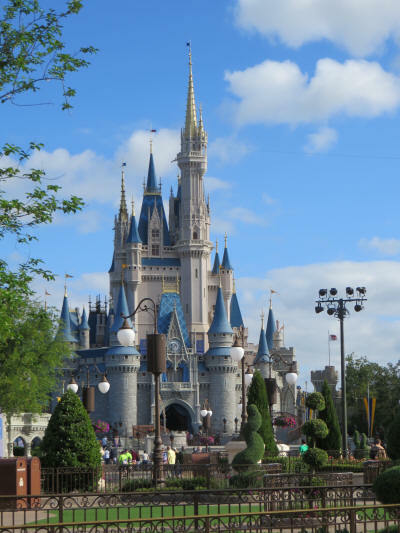 In the motor home we tried to average about 350 miles a day, so the 1,405 mile trip to Walt Disney World took us four days. 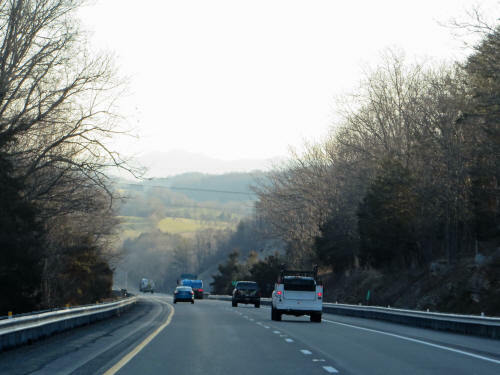 On this trip we planned to travel 733 miles on our first day and spend the night in Wytheville Virginia. Along the way we made several fuel stops and several rest area stops but we didn't spend too long at any place, we knew the day would be a long one! Carol had packed some sandwiches in a cooler before we left home, to save time we ate them on the fly as we sailed down the highway. Fortunately we can travel a bit faster in the car than we could in the RV . . . unfortunately, the three dogs weren't as relaxed in the car as they had become in the motor home. At home I drive the dogs to the park almost every day, when weather permits and they've become quite comfortable riding in the back of the SUV. I open the rear lift-gate and they jump right in. Unfortunately, the back of the SUV is full of three weeks worth of camping gear, our clothing, a bunch of dog food and a couple of Mickey Mouse lamp posts. Our babies have to ride on the back seat. That is something new for them and so far they're not enthused! We put them in harnesses and looped them through the seat belts to keep them safe, just like we always did in the RV, but that back seat is not quite as roomy as the couch they shared in the motor home. All three of then shivered and shook for the first three or four hours. Jake was the first to lay down . . . and he actually closed his eyes for a few minutes just before noon. Mid-afternoon Jak laid down too, but kept his eyes open the entire way. Blue was rigidly erect the entire way! 1) Hotels do not save their very best rooms for people looking for a 'pet-friendly' option! 2) Our puppies like camping a whole lot more than they like moteling! The moment the dogs walked into the room they were on edge. Carol and I could smell the distinct odor of mangy dog, with a delicate hint of ammonia from fermented kitty litter. Of course, the dogs have much more sensitive sniffers! 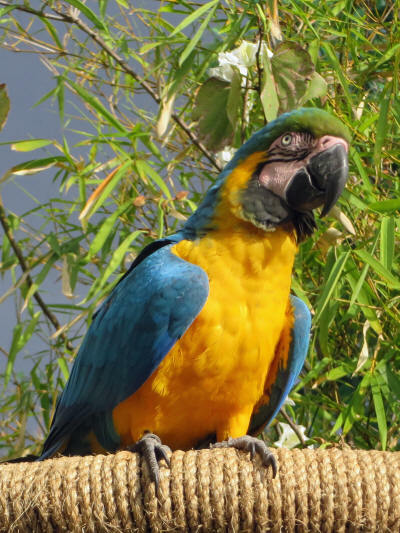 Blue swore to us that he could detect the scent of Hedgehogs and Vietnamese Pot Bellied Pigs. Jake walked around every corner of the room, sniffing madly with his ears pulled back. He occasionally growled softly . . . he never does that! It took a great deal of coaxing from Carol before Jak and Blue ate their dinner. The dogs have always been very comfortable in the motor home, but not so in the motel. They were spooked! Rather than go out to dinner and leave them alone, I went out to pick up dinner while Carol stayed back with them. I went to a Chinese restaurant that we always eat at when we stay in Wytheville. When I got back with the food Carol was sitting on the bed with three dogs almost glued to her! After a tasty dinner we watched some TV before crashing early. Thankfully we had two beds, I slept with Jake magnetically attached to me while Carol slept with a clingy Blue and Jak in her bed. When I opened my eyes at 5:30 a.m. 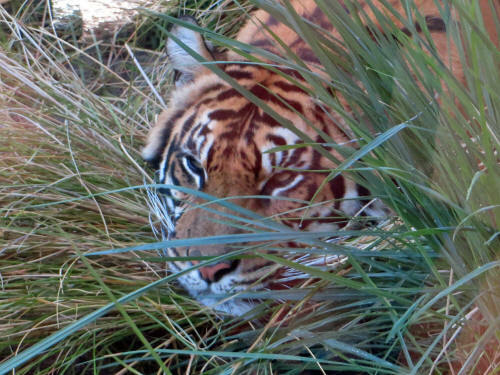 I spotted Carol in the bed next door. Her leg was extended straight up in the air and she was slowly flexing her knee. "Doing your exercises?" I asked. "My knees are killing me!" she replied. We were both suffering from those clingy dogs who like to drape themselves over us while we sleep. It's an instant recipe for achy knees! I got dressed and wobbled down to the lobby for coffee while Carol fed the dogs. Jake totally refused his breakfast so it went into the cooler for later. After our eye-opening coffees Carol worked on packing things away so we could head out on the road again while I went back to the lobby area for a quick bite from the complimentary breakfast. The Belgian waffle I had was the best aspect of our stay at the Red Roof Inn! Carol was all set to go when I got back so we loaded all the bags in the car, lashed down the dogs and pulled out at 6:45. A half-hour later we approached that hill that Carol loves to hate. The sun was shining brightly, skies were clear, it was a beautiful morning . . . except for the winds! It was very gusty and the overhead signs were warning, "Extreme winds - High Profile Vehicles Face Rollover Risk"
Guess what? Carol doesn't mind the hill when she's in a car. In spite of the winds, I was able to hurtle down that seven-mile precipice at 70 MPH without so much as a whimper from the navigator's chair! What a treat! The day was much like our first, but it was warmer and the sun shone brightly! 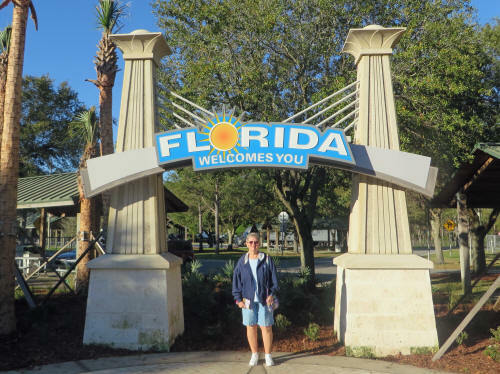 Carol spotted daffodils blooming all along the highway, trees in bud, trees in bloom, glorious forsythia bushes, and at 10:35 she saw the first palm tree at Columbia South Carolina. The dogs were a bit more relaxed today; Jake actually slept a bit in the car and from time to time Jak and Blue stopped shivering, huffing and puffing. Lunch was a few more of Carol's sandwiches at a rest area on I-26 then we made our final dash to Brunswick Georgia where we checked in at Motel 6. Wow, this place makes the Red Roof Inn look like The Ritz! The odor is much stronger, there isn't a speck of art on the walls, the carpet is worn and shabby, the toilet seat is broken and held on by only one of the two hinges! The dogs are definitely more relaxed here, but it's a spot we'll never be returning to! After the dogs had a few minutes to get oriented we all hopped back in the car and Carol popped into a few shops while I stayed in the car with the pups. I dropped them off at the hotel and went off to gas up the car and pick up a couple of banana boxes at a nearby Winn-Dixie grocery store. Once I was back with the boxes Carol headed out to arrange them in the back seat and added some cushions. We wanted to put one of the dogs in each of the boxes so that they wouldn't be touching each other in the close confines of that seat. That can be very troublesome for a dog! We relaxed in the room for a while before Carol fed the dogs. Jake was quite happy to eat his breakfast when she presented it as dinner. It wasn't long until Carol announced that she was hungry. We were still reluctant to leave the dogs alone in the motel room so we loaded them in the car and took them with us. This was a first test for those banana boxes. The final score was Dogs 2 - Boxes 1. Jake refused to hop into his cushioned box. When I picked him up to place him in the box he extended all four legs and made himself as large and rigid as possible. There was no way I could get him in! Finally I turned him upside-down and rolled him in. That made him scowl at me! It was obvious that he was too big to ever be comfortable in the box. Since Blue is even bigger, it won't work for him either. So we tossed two of the boxes, put Jake on the seat behind the driver, Jak in a box in the middle of the seat, and Blue on the seat behind the passenger. Jak was a better fit, but he sure didn't look happy or comfortable in that box. We drove to a nearby Burger King and had a thoroughly unsatisfactory dinner. I found a table at the window where we could watch the dogs in the car while we ate. Carol went and ordered our burgers. The highlight of the dining experience was when Carol came back to the table with a big grin. She said, "I forgot where I was and I asked the girl behind the counter if they had poutine." She couldn't help but laugh when she saw the complete deer-in-the-headlights look that young southern belle gave her! Every fast-food joint back home serves poutine but here it's unheard of! When we got back to the car Jak had curled up in his box and looked quite content. The Jak-in-the-box experiment will continue tomorrow! We stopped on the way home to celebrate our crumby dinner with some Baskin Robbins ice cream. How could that possibly go wrong? They were out of cones. OUT OF CONES! How does that happen? We were back to the motel by 7:00 and settled in for an evening of TV. We slept in until 6:00 a.m. Well, we sort of slept! Carol pulled a dirty trick at bed time last night. When she took the pups out for their last ‘chores’ of the day she brought them in and gave them their cookie on MY bed. Naturally they settled right in for the night! For several hours I had to contend with two clingy dogs. Somehow they always manage to snuggle in tight and make my knees throb and ache. Jake is quick to move when asked but Blue refuses to budge. After waking several time in discomfort I managed to dislodge Blue. I must have hurt his feeling because he jumped out of bed and joined Carol next door. Aaahhhh! That was better! So when morning finally came I hobbled out of bed, nursing my knees, and so did Carol. We stopped for breakfast at a Waffle House just a few hundred yards from our motel. About a dozen years ago we tried Waffle House for the first time in Kissimmee, just steps from the KOA campground. It was terrible! A few years later we tried again, at Point South, South Carolina, just steps from the KOA campground. It was equally bad. For years we have joked when we spotted a Waffle House sign, we’ve always thought that the ‘W’ should be silent. We pronounced it Awful House. Some friends back home frequently stop at Waffle House for breakfast, and they quite like them, so we thought we’d give them another chance! It wasn’t too bad. Carol enjoyed her scrambled eggs, bacon and toast. I sent back my first Western Omelette when I discovered that it was full of jalapeño peppers. They soon brought me a second one with no jalapeños, but it did have tomato, cheese, sausage and mushrooms. It was tasty but I didn’t expect any of those things. Back home a Western contains bell pepper, ham and onion; that’s all! I guess the recipe for a Western is different in the South! We also discovered that Waffle House has a sort of unique twist on poutine! 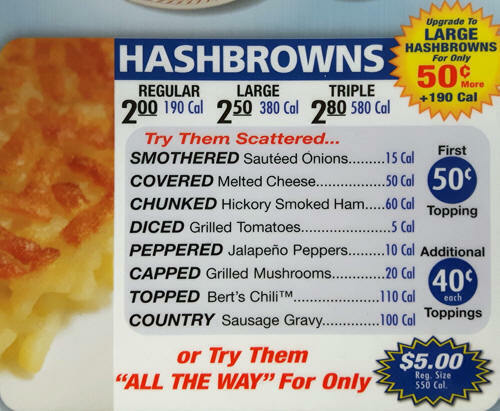 Check out their menu for Smothered, Covered, Chunked, Diced, Peppered, Capped, Topped and Counrty Hash Browns. Wait a minute . . . Sausage Gravy on hash browns? Oh Please . . . say it ain't so! We were finished breakfast and on the road by 7:30 and crossed the Florida State Line at 8:00, just as the Welcome Center opened! We always have to stop for some Minute Maid orange juice and a picture at the sign! It’s a tradition . . . but this time there was a new sign. I like it! We stopped briefly at the St. Augustine FlyingJ Truck Stop to deliver a Mickey Mouse lamp post to a couple from Florida, then carried on. Our friend Hilda had called and spoken to Carol while I was talking with Sean and Andrea about their new lamp. 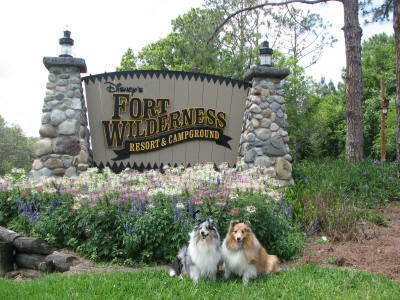 Hilda had been to the Fort Wilderness office and told Carol that we would be in camp site #707. It’s our favourite site and was first on the list of preferred sites we had faxed to the campground office about a week ago! Now Carol was enthused; she told me to put the pedal to the metal. Traffic slowed to a crawl a few times as we passed through the never-ending construction in downtown Orlando . . . but we still pulled into Fort Wilderness at 12:05, just 5 minutes behind schedule. We drove directly back to our campsite and met Mike and Terri, the husband and wife team who own and operate Wilderness Camper Rentals. What a treat to pull in and find everything ready for you! After a short visit with Mike and Terri we emptied the car. 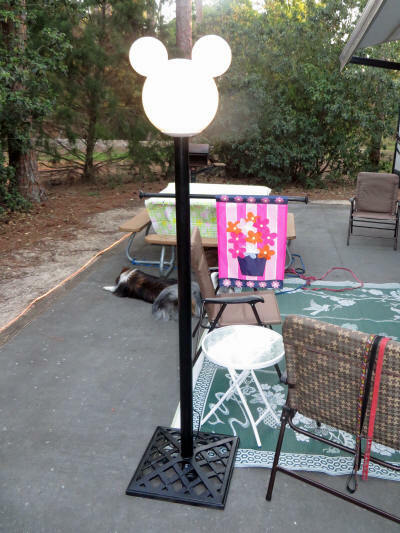 I passed all of our cloths and personal effects to Carol who unpacked and got things set up inside while I set up our Musket Mickey sign, Mickey Mouse lamp post, stretched out some rope lights and then ran a bunch of extension cords and timers to power everything. We both finished up about the same time; by 2:00 p.m. we were fully settled. Our last chore was to pick up our rented golf cart, then I took the dogs and settled down for a well-earned nap while Carol drove off to the grocery store to pick up a few staples. I was sitting outside with the dogs, reading my book (I was reading, not the dogs) when Carol got back around 4:30. After the groceries were stowed away it was time to walk the dogs. We took them for a stroll alongside the canal behind the 800 loop of campsites. They were itching to run and play, but we didn’t have a ball to throw. Hopefully we can get them to the dog park tomorrow; they’re overdue for some exercise! Some campground friends, Ron and Kay, were walking past as we were boarding the golf cart to head off for dinner. We had a short visit and caught up a bit. 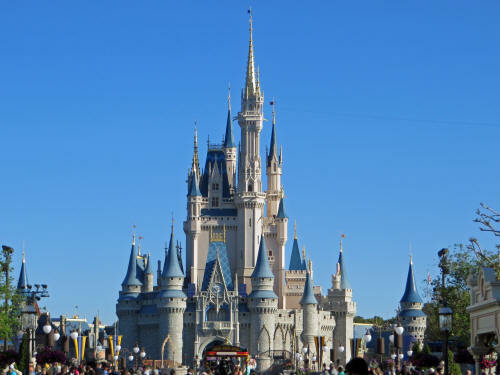 They have sold their home in Wisconsin and are building in a new development behind the Magic Kingdom. We checked in at Trail’s End Restaurant at 5:55 for our 6:05 dinner reservation and the little electronic pager started vibrating about 2 seconds after the hostess handed it to me. We always enjoy the buffet at Trail’s End and tonight was no different. It was all very good - Carol’s only complaint was that she couldn’t find any chicken legs. The lack of chicken legs didn’t mean that either of us left hungry; we were both stuffed! We stopped for a few minutes at the Settlement Trading Post and were heading home to pick up the dogs and spend some time driving around the camping loops checking out the lights and displays at some of the campsites. It’s called ‘looping’. Before we got home to get the dogs we had decided that it was too cold and we were too tired. We settled in for a quiet night of TV with the dogs! We slept wonderfully in our new home away from home! It’s nicely laid out and quite roomy in the living area. That part seems bigger than our motor home was. 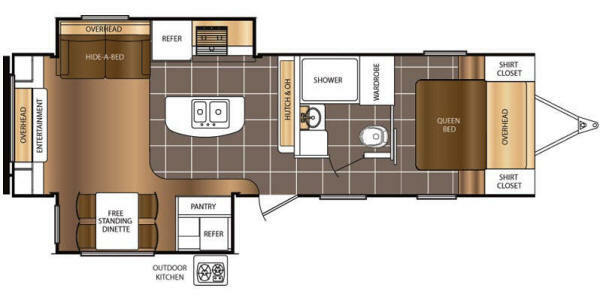 The bathroom and the bedroom, on the other hand, are pretty compact. The bed is a bit higher than the dogs are used to (there is a large ‘pass-through’ storage compartment below it) and all three of them are reluctant to jump up on it. It’s a queen bed, smaller than the king we’re used to at home and we certainly didn’t encourage the boys to jump up. Carol spread a blanket on the couch and put Jak’s fluffy blanket/duvet/bed on the floor beside it. That’s where the three of them spent the night, Blue and Jake shared the couch and Jak was nearby on the floor in his bed. I agreed with her, it sure was nice to have everything set up and ready when we arrived. The water, sewer and electric connections were all hooked up, the bed was made (they supply all the linens) and all we had to do was unpack our clothing and relax. 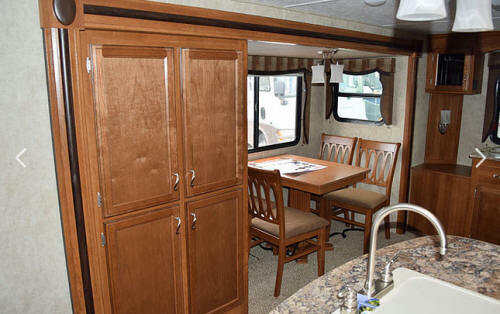 I like the trailer too, the living area has plenty of elbow room, a full sized table and four chairs rather than a tiny dinette, a couch that pulls out to a double bed and a large screen HD TV. 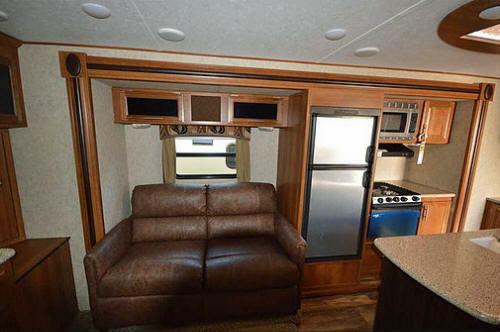 The kitchen has a nice island with a big double sink, the refrigerator is bigger than we’re used to, and it’s well equipped with dishes, cutlery, pots, pans, toaster, coffee maker, scissors, and many other things that you would never think to bring with you. There were even bottles of hand soap and a box band-aids included. Storage space is a bit tighter than we had in our own unit, but it’s more than adequate! By 9:00 a.m. I had enjoyed a nice hot shower . 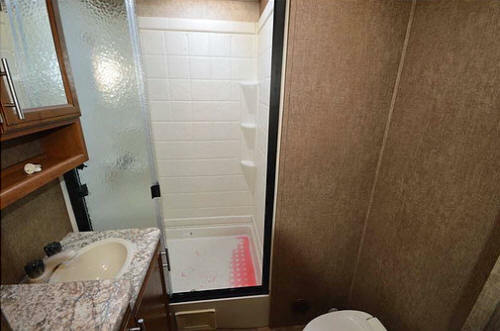 . . the shower is bigger than we had in our own RV and that’s an important feature for an oversized guy like me! The sink in the bathroom is a different story . . . it’s teeny weeny . . . but the shower is great! At about 9:30 we turned on the TV for the dogs and locked them in the trailer. They like to watch Disney cartoons and the background noise seems to keep them calm while we’re away. 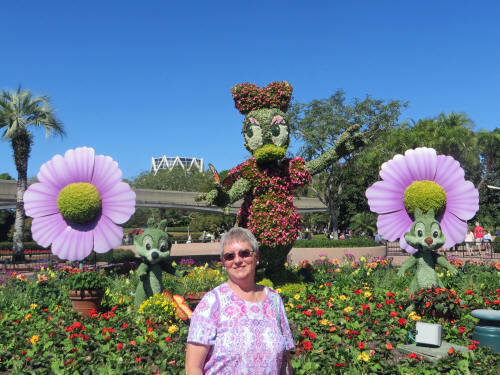 Our first stop was Wal-Mart where Carol picked up a few more things we’ll need during our stay, then we scurried over to Disney Springs to buy my annual pass for Walt Disney World. 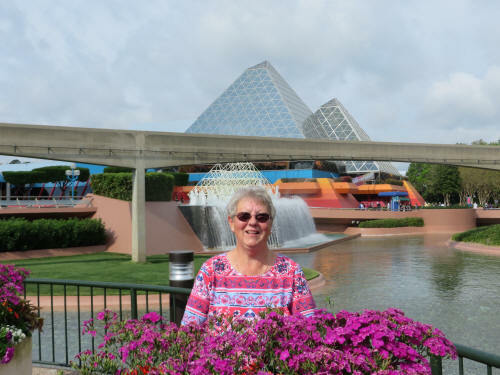 It was quite a process - Carol had used her Air Miles (a loyalty program used by many retailers in Canada) to buy vouchers for a 7-day park ticket and a 5-day park ticket. 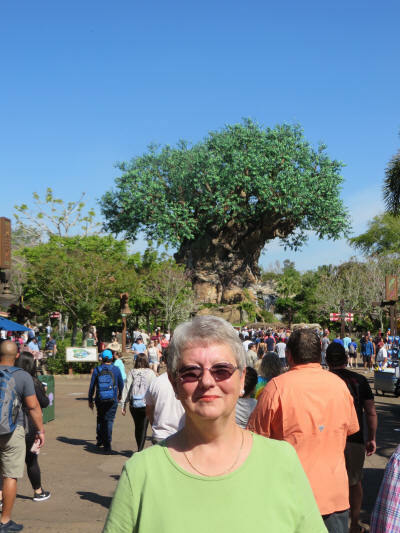 She exchanged those two vouchers, plus about $285 in cash, for a Premium Annual Pass in my name. Then began the tedious process of adding all the FastPass booking Carol had made with her pass to my ticket. It probably took the Guest Services expert a half-hour to work through all the reservations, one at a time, syncing my bookings with Carols. Next stop was Pin Central where Carol began whittling down the shopping list she brought along with her. Some pins were for her collection and some pins were for a few close friends who had asked her to pick them up. I found a nice shady table outside Earl of Sandwich and did some people-watching while I waited. She was all done by 11:30 and came to track me down at Earl’s. She was still about 40 yards away when we started communicating in sign language. It’s not ASL . . . it’s a system we have developed on our own. She gave me the ‘Let’s go.’ sign. I pointed to my watch and then pointed at Earl of Sandwich, saying let’s have lunch. She replied with a scowl and repeated the ‘Let’s go.’ sign. I sprang to my feet and off we went. Of course, she was right, it was the first time we’ve left the dogs on their own for that long since their harrowing car ride. 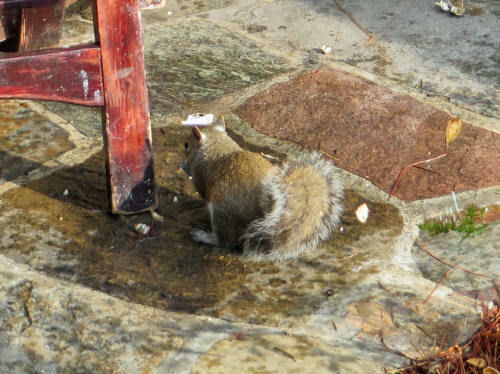 We were home by noon, took the dogs for a walk and enjoyed sandwiches at the picnic table. 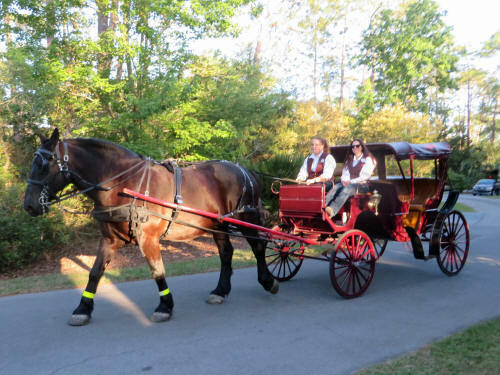 While we ate we heard the clip-clop of horse hooves and soon a horse drawn carriage went by; they were training a new horse. We enjoyed a quiet, relaxing afternoon with the puppies. Snoring could be heard from time to time! The dogs had a walk before dinner and when the pups had eaten I fired up the propane stove in the outdoor kitchen. Carol cooked up some tasty hot dogs with donuts for dessert. Aahhh . . . this is roughing it! Another horse went by during dinner, same carriage, but a different horse. The dogs are starting to get used to the clip-clop . . . there wasn’t even a growl this time! 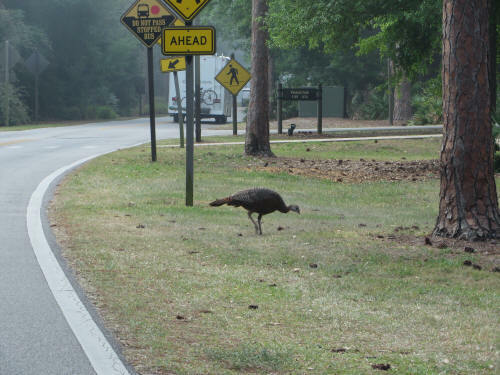 Then Jake spotted a flock of six or eight wild turkeys strolling by. He looked like he had been shot out of a gun! He had reached full speed when he hit the end of his 25’ lead. Luckily we have recently watched a lot of Olympic Freestyle Skiing. I instantly recognized Jakes trick as a reverse 900. Unfortunately he couldn’t hold the landing . . . it’s a wonder he didn’t break his neck - poor little guy! After dinner we took the boys for a nice long walk along the canal behind the 800 loop of campsites. Jake put on his bravest face, ignored his pain and posed for this swell picture with his brothers! Carol and I hopped on the golf cart and looped past quite a few campsites on our way to the Meadow Trading Post and the Settlement Trading Post for the nightly pin trading sessions. The trading boards open at 7:00 and 7:30 respectively. She didn’t find much, but we were able to console ourselves with ice cream before heading home! We were back with the boys at 8:00 and settled in to watch Jimmie Kimmel host the Oscars. Jak let Carol sleep until 6:30 this morning; we’re making progress! 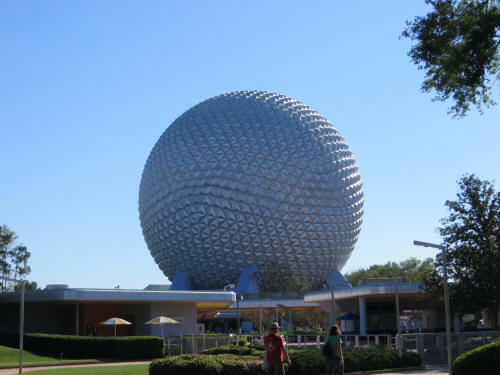 We enjoyed a couple of quiet hours with the dogs, sipped coffee outside at the picnic table, then it was time to head to EPCOT for the morning. We arrived at the park at 9:25 and it was already getting busy! It was too busy at the entrance to stop for a PhotoPass so we carried directly on and used our FastPass at Spaceship Earth. There wasn’t much of a line, the FastPass let us skip ahead of about four people! But I suppose that if we hadn’t had one we would have needed it! 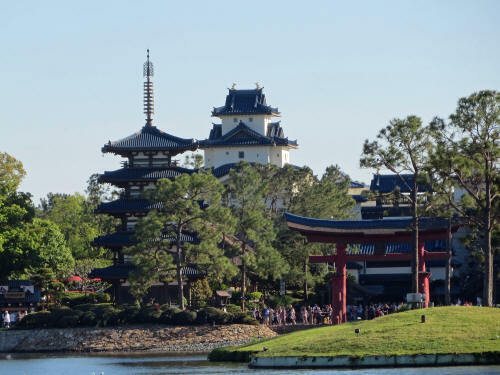 After our trip back in time we wandered up toward the World Showcase Lagoon. 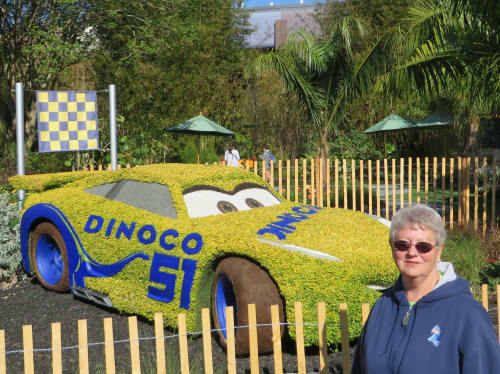 Carol stopped at Pin Central to pick up a few items, then stopped at one of the Festival Shops for some Flower & Garden Festival merchandise. 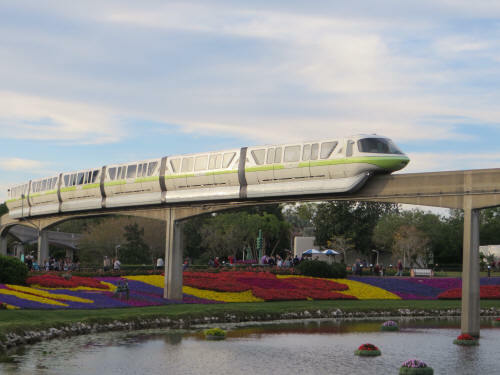 I hung out on the bridge overlooking the magnificent carpet of flowers, waiting for a monorail to pass so I could capture the ‘perfect’ picture. Well, at least I tried! 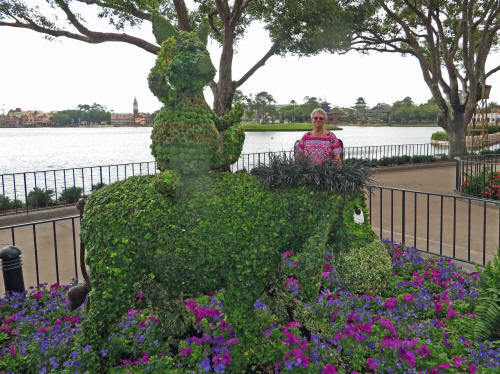 We wandered a bit, enjoying some of the topiary displays and stopped for a few PhotoPass opportunities. 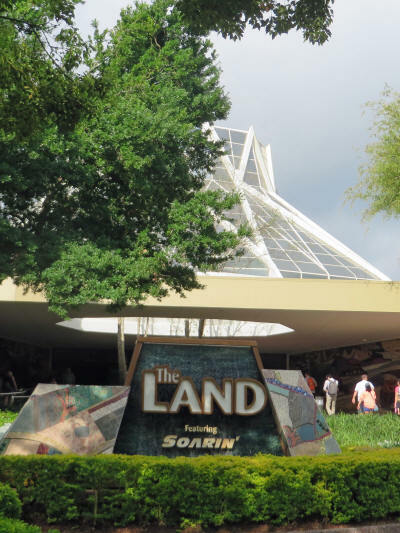 Our next FastPass was at Soarin’ and immediately after our glider ride we joined the queue at Living With The Land. 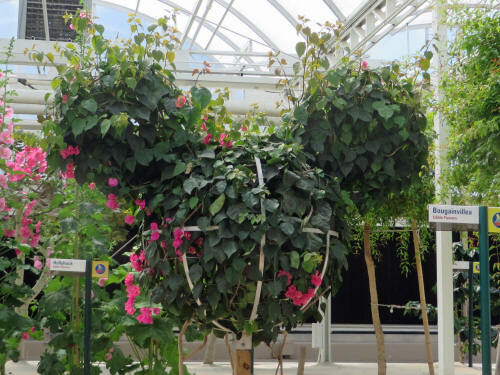 Check out these floral Hidden Mickeys! 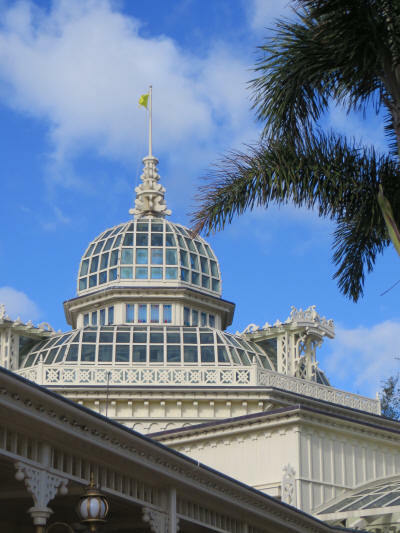 It was almost noon when we finished our ride through the greenhouses; time to get home to the dogs! We spent a quiet afternoon at the campground. After sandwiches at the picnic table I took the car out to a car wash and then picked up a few little things we needed. Carol stayed home with the dogs and sorted out some of the swag she picked up for friends back home. 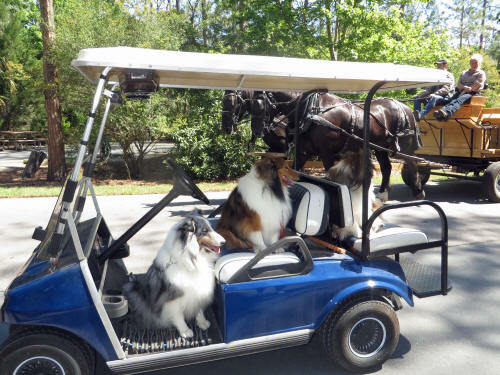 Carol fed the dogs a bit early then I loaded them on the golf cart for a trip to the dog park. They had a good long run before we bailed out on them again. At about 5:45 we caught a boat to the Magic Kingdom, on our way to dinner at Liberty Tree Tavern. 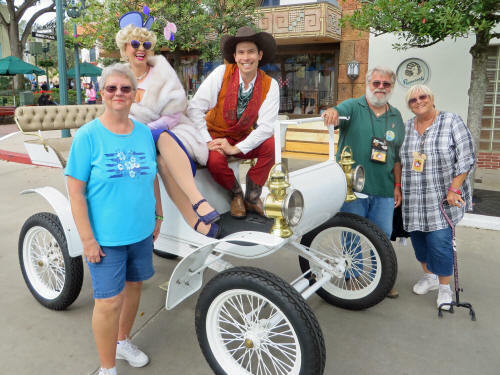 We had a few PhotoPasses taken along Main Street USA on our way to Liberty Square. After a quick stop to pick up my Annual Passholder Magic Band we checked in at the restaurant. In just a few minutes we were seated. It has been a long time since we had dinner there and it was all good! It’s served ‘family style’ and we felt guilty about the food we left uneaten, but when the sticky-toffee pudding arrived we ate every bit of it! 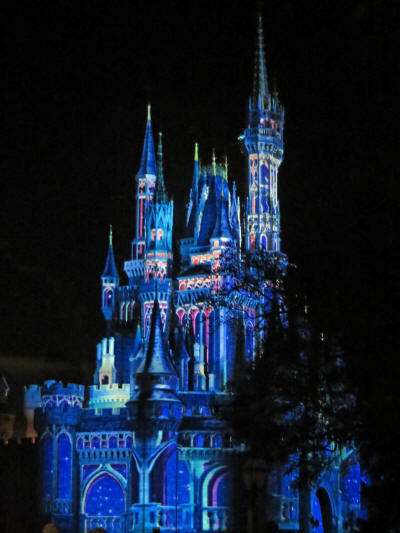 As we left the restaurant the music for the Happily Ever After fireworks show started. 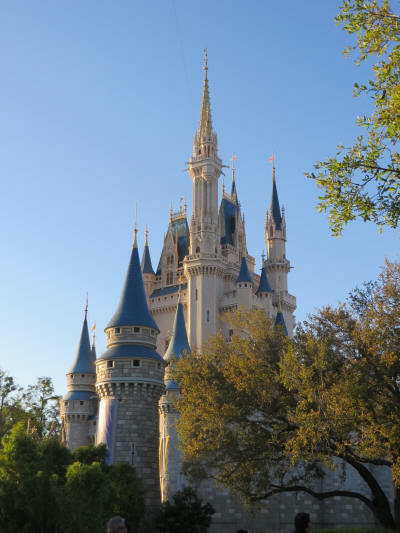 We dashed over to the rear corner of the Christmas Shop where we had a good view of Cinderella Castle and the fireworks which, from our perspective, were firing above Sleepy Hollow Snacks. After the fireworks show we made a dash toward the exit, stopping briefly to pick up some special Annual Passholder pins in The Emporium. In spite of the huge crowd streaming to the exit, we were able to board our boat back to the campground at about 8:45, just 20 minutes after the fireworks ended. We had a late start planned today, our first FastPass at Animal Kingdom didn’t expire until 11:05 so there was no need to get up early. Unfortunately, we forgot to tell the dogs! Jak was itching to go out at 6:45, as usual so there was no sleeping in for us. We were able to enjoy a relaxing morning though. We sat out in the glorious sunshine with the dogs, it was the warmest day so far and we did our utmost to enjoy it. 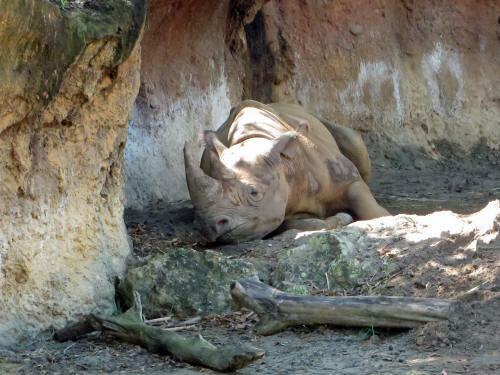 After giving the dogs a walk we hopped in the car at about 10:00 and drove off to Animal Kingdom. 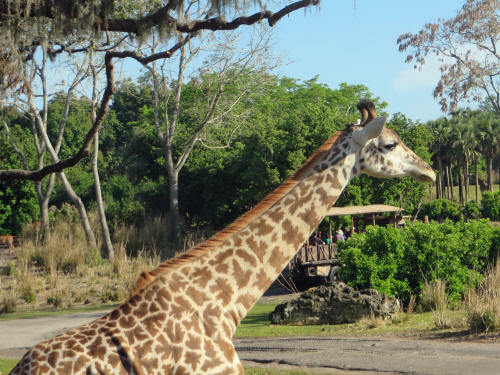 We walked directly back to Africa and joined the FastPass line for Kilimanjaro Safaris. The safari started off slowly, there were very few animals during the first few minutes, but then about half way through the savannah it changed! 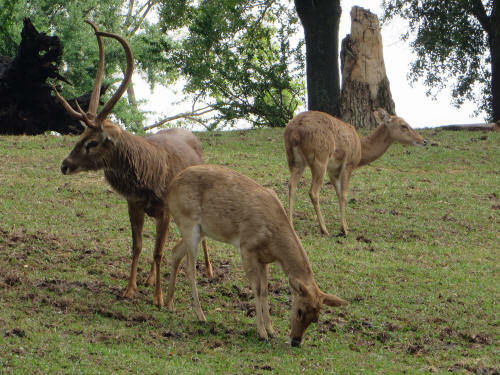 A 'giraffic-jam' on the savannah! There were several giraffe putting on a bit of a show. 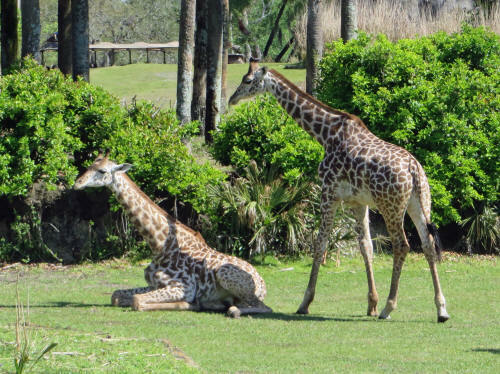 It was the first time we’d seen a giraffe laying down! 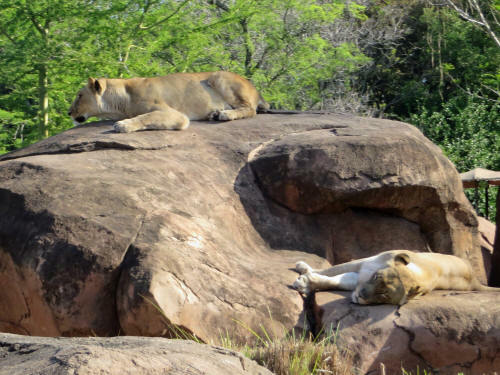 The elephants were out in force and the male lion was gloriously sprawled on the kopje rocks. 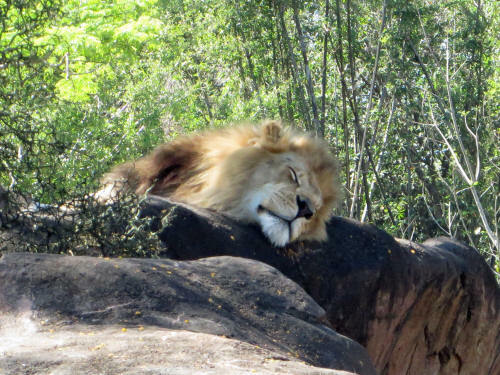 Carol snapped a fantastic picture of sleeping Simba! 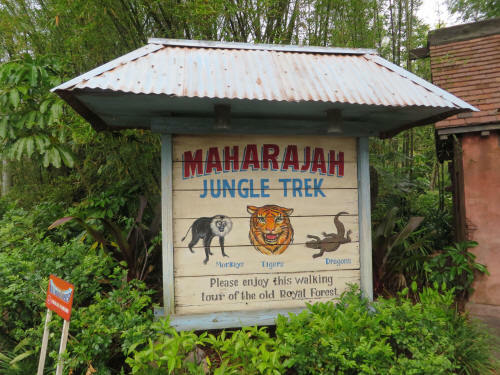 After our safari we scurried across to Asia to redeem our FastPass at Expedition Everest. 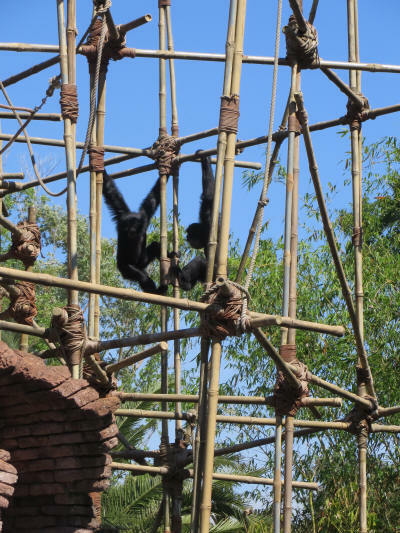 The siamangs were shrieking out their ‘territorial calls’ as we passed the abandoned temple they call home. Wow - those things are loud! 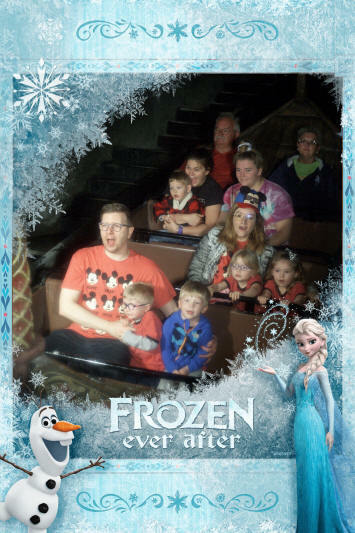 We rode in the very front seat at Everest, we think it’s the most exciting place to ride! 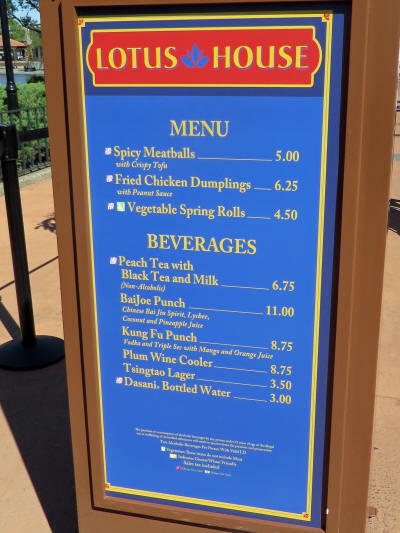 We stopped at Yak & Yeti for a bite of lunch, egg rolls and fried rice from the quick-serve counter. We both thought it wasn’t as good as we remember it being a few years ago. 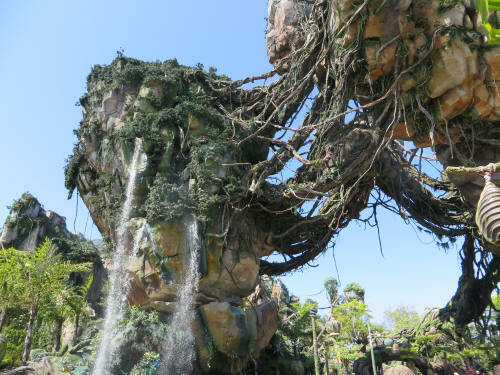 Our final ride of the day was in Pandora. 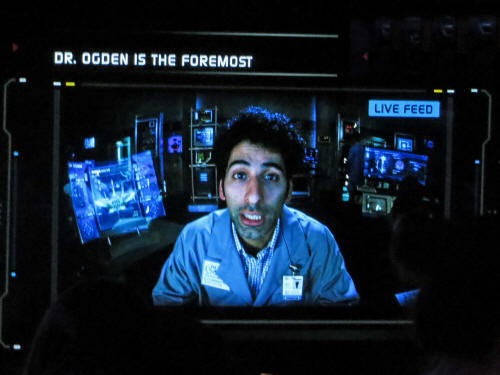 We were thankful that we had FastPasses for Flight of Passage, the standby line was 180 minutes. Ouch - that’s three hours! 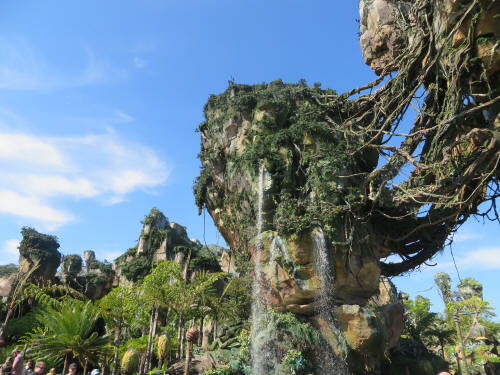 We whistled through the FastPass line in no time, had a terrific flight on our banshees, and left the park at about 1:00 p.m.
We spent over an hour with the dogs, then drove to Booster Packs and Beyond, a retailer just west of the Disney Parks. 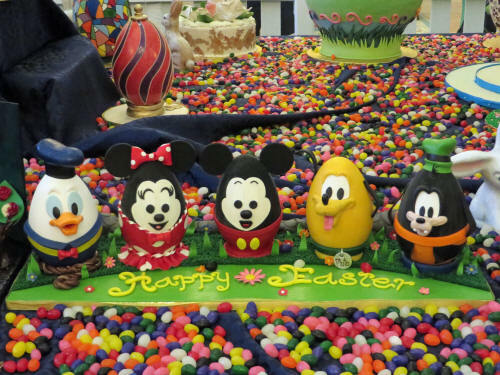 They deal in Disney pins, Vinylmations and plenty of other collectibles. Carol found a Disney plate which completed a set she began collecting in the 1970’s. On the way home we made a brief stop at Property Control, the shop where Disney sells it’s outdated or overstocked merchandise. There were no bargains today! We were home with the puppies, fed them and took them for a walk before we left at 6:00 p.m. for our dinner. Tonight it was Chik-Fil-A. We don’t have them in Canada so those simple chicken sandwiches are a real treat for us! After dinner we headed to a nearby Home Depot store where I picked up a few Mickey Mouse lamp post components that Home Depot doesn’t carry in Canada. We were home with the puppies before 8:00 p.m. and enjoyed another quiet night of television. It began to rain lightly at about 10:45 last night. Carol scrambled out with the dogs to get their nightly ‘business’ done before everything got too wet. It was a good thing she got them out quickly; it rained all night! I went to bed and slept through it all! It’s a gift . . . I can sleep through anything. Carol wasn’t so lucky. The dogs had her awake several times during the night. At 4:00 a.m. the rain was teeming down and Blue, our largest and most timid Sheltie, couldn’t get to his Momma. Jak was curled up on the floor beside the bed blocking Blue’s way. Blue made quite a fuss, enough to wake Carol up. She had to get up and comfort him. By the time Jak woke Carol again at 6:30 the rain had stopped and the campground was starting to come to life. The boat whistles were sounding out at the marina, the cardinals were singing and most importantly the coffee was brewing in our trailer! I took a cup of coffee outside, unfolded one of the lawn chairs we had stowed under the awning the night before and sat outside for a while. Mornings are the best time of day at the campground. We love sitting out as people walk by with their dogs, jog past on their morning run or ride around the loop on their bicycles. It’s like stepping back in time 50 years. Everyone is happy, everyone is friendly. People stop to say hello and often have time to chat! It’s a wonderful place, so much nicer than staying in a hotel! We had no plans for any of the theme parks today, just a couple of meals with friends. We took the dogs for a walk along the canal behind our camp site. 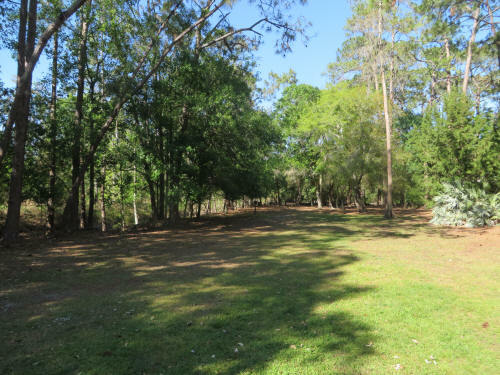 It runs all around the back of the 800 loop of campsites too, and it’s a great spot for the dogs to get some light exercise. It’s not an official ‘off-leash’ area, but when there are no other people or dogs around we often let the boys run free. They’re much better about attending to their chores when they can wander a bit! We hopped in the car at 9:15 a.m. and drove to the Wilderness Lodge Hotel a short distance away. 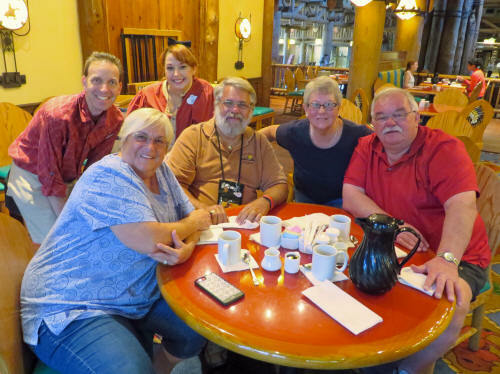 We met our friends Al & Jane, from Blue Springs Missouri, for breakfast at Whispering Canyon Café. Al & Jane are snowbirds. 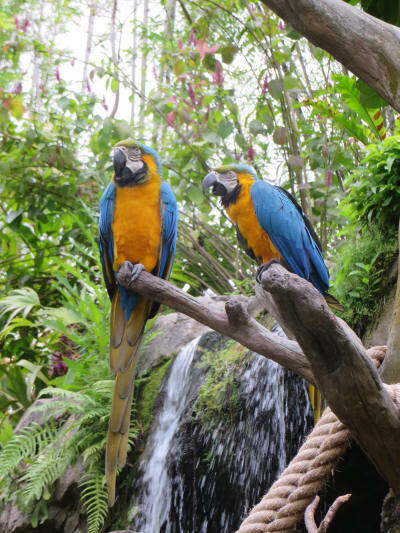 They spend half the year in Florida and one of their winter traditions is ‘Whispering Canyon Wednesday’. Once a week they have breakfast in the same restaurant. 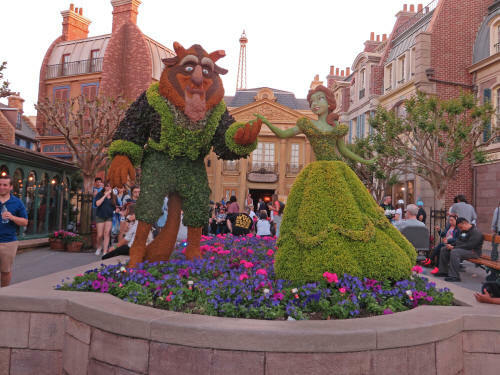 They have gotten to know all of the cast members and are loudly welcomed each Wednesday. It’s not unusual for their regular server, Chad, to set their special table with white linen. 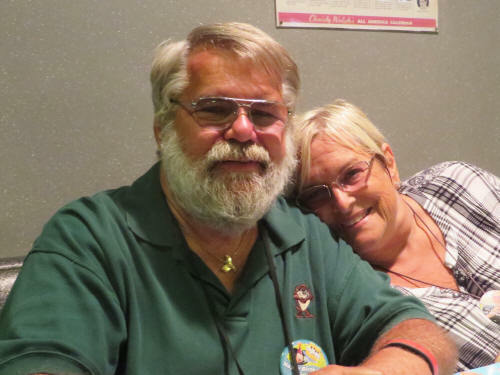 If you are eating at Whispering Canyon Café and you see the staff making a fuss over the folks at the only table in the restaurant covered in linen, those are our friends Al & Jane! Carol and I had a great breakfast and enjoyed catching up with friends we had not seen in many months. We were back home to the dogs at noon. 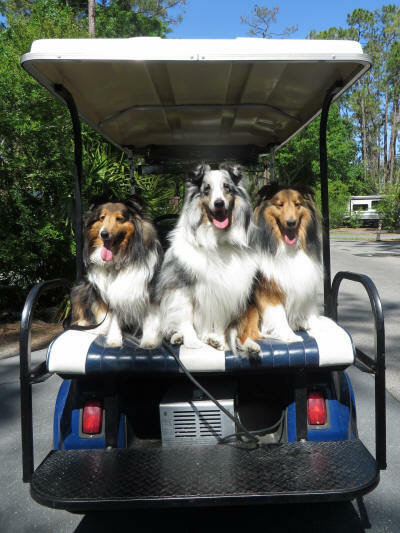 Before long we loaded all three on the golf cart and took them to the off-leash dog park for some exercise. We had the park all to ourselves so they had a good romp! When we got back from the park we took some family portraits on the golf cart! The dogs were a bit distracted when a team of horses clip-clopped past with a big wagon in tow. It looks like they're ready to go back to the dog park! This was my favorite picture! By 1:15 we were on the road again. 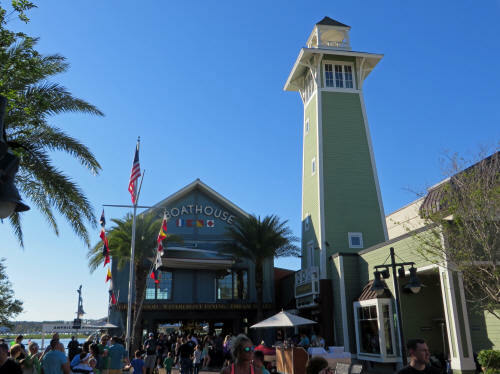 This time we headed to Disney Springs where we were meeting friends Deb & Linda for lunch at The Boathouse. Once again we had a great meal and lots of laughs as we caught up with dear old friends. We were back home at 5:00, just in time to get dinner for the dogs then take them for a walk along the canal. 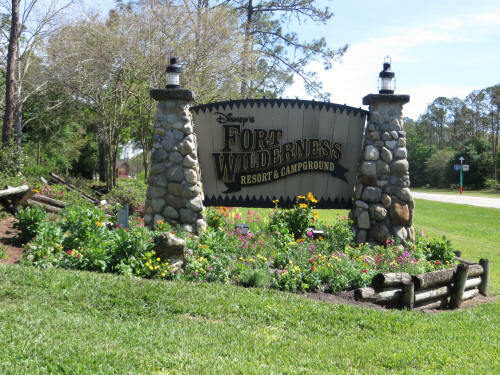 We decided to tour a few camping loops before it got dark so the five of us boarded the golf cart and spent about an hour roaming the far corners of Fort Wilderness. We were back home before 7:00 and sat outside with the dogs for a few minutes until the gathering darkness and cool temperature drove us inside. Then it was time for another quiet night of television. 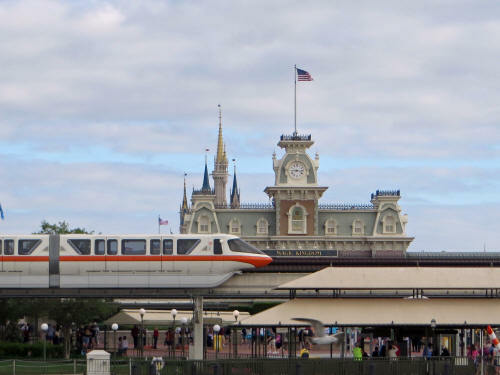 Today we planned to head to Magic Kingdom and we wanted to get a fairly early start. The dogs helped by getting us up at 6:30. It was sunny and bright, but too cool to sit outside and waste time sipping coffee. Before we knew it the dogs were fed and walked, I was shaved and showered and we were in the boat on the way to the Magic Kingdom. By 9:30 we had picked up some new packets of Sorcerers of the Magic Kingdom cards and were wandering up Main Street USA. 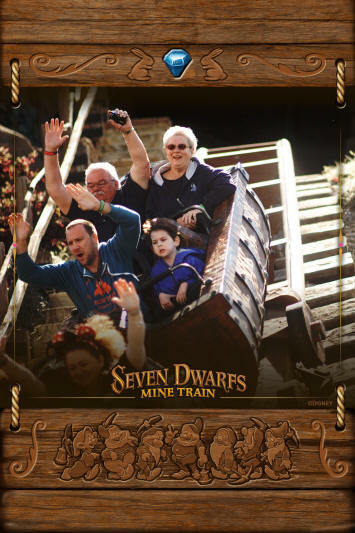 We arrived at Seven Dwarfs Mine Train just in time to use our FastPasses. We were glad to have them, the standby line was 105 minutes . . . almost two hours! 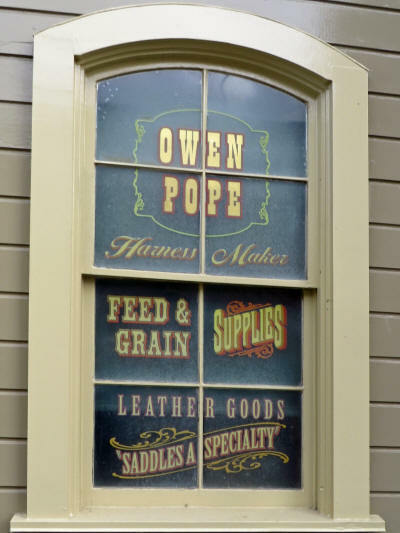 It was a bit too early for our FastPasses at Peter Pan’s Wild Ride so we headed to Frontierland so Carol could check out the pin store at Frontier Mercantile. There were a few distractions along the way! 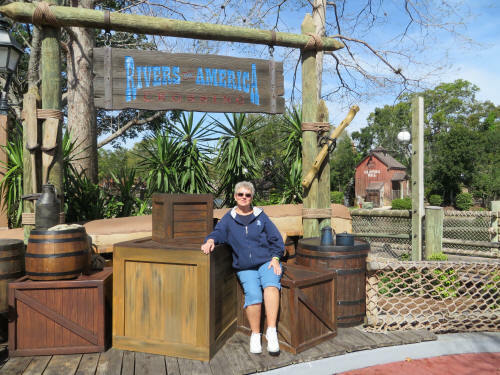 Once we arrived at Frontier Mercantile Carol was able to pick up all the pins she needed for her buddies back home. 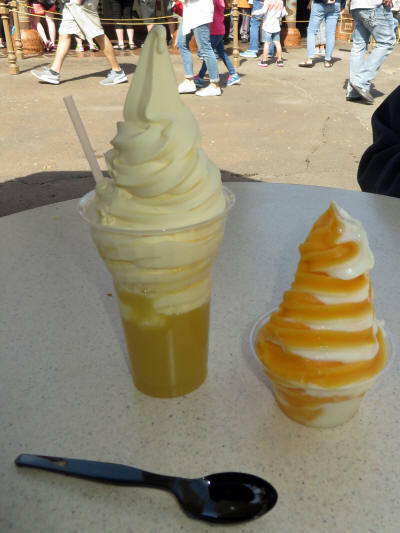 We celebrated with a Pineapple Float and an Orange Swirl. Yum Yum! 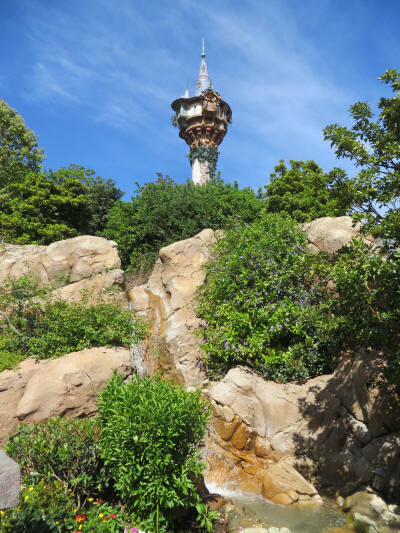 By the time we recovered from our brain-freezes we needed to head to Peter Pan to cash in our FastPasses. 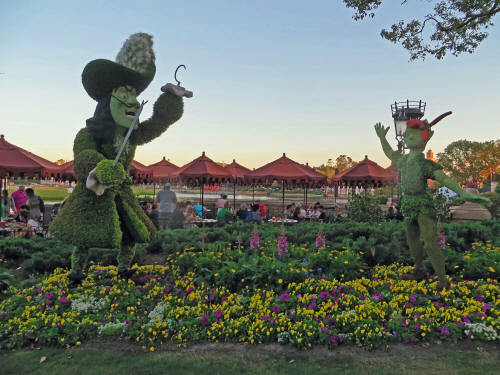 The park was really getting crowded, so once we had flown through Neverland we started heading toward the exit. Unfortunately we were sidetracked by a hot dog craving. 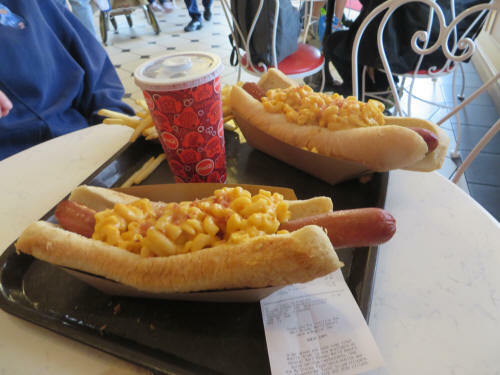 They have started serving gigantic hot dogs topped off with some unusual things.. We both wanted to try the mac ‘n cheese dog! Big mistake . . . the dogs were huge all right, but the buns were far to large, impossible to get your mouth around, they were very stale and very dry. The mac ‘n cheese was not too bad, but everything else was. The wiener kept repeating all afternoon . . . nope, won’t be having those again! The trolley dancers were performing on Main Street as we approached the exit. Our boat back to the campground was approaching the dock when we arrived at 12:30. The dogs were happy to see us, and even happier when we loaded them on the golf cart for a trip to the dog park. Jak doesn’t chase a ball like Blue and Jake do, so he doesn’t usually have as much fun at the park as they do. Today was different, Jak found a few other dogs to run and play with so he had a blast! We had just gotten home from the park and were contemplating a nap when a visitor arrived. It was Barb, a dairy farmer from Wisconsin. Barb and her husband Bill have been the custodians of a ‘travelling fire pit’. 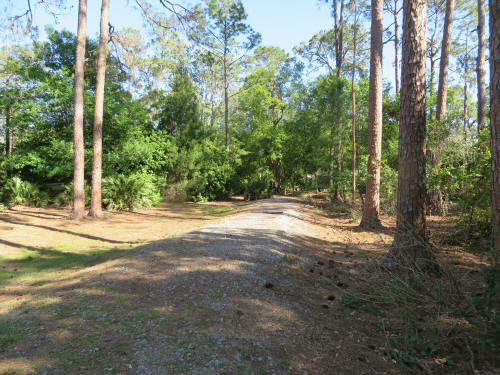 An Internet discussion group has a thread focusing on a fire pit which never leaves Fort Wilderness . . . it just moves from one camper to the next. Barb and Bill are leaving tomorrow (Friday) morning and the next user, Michael from Mississippi, doesn’t arrive until Saturday or Sunday. Carol and I have agreed to be temporary custodians. We’ll store the fire pit at our camp site until Michael can come to pick it up. 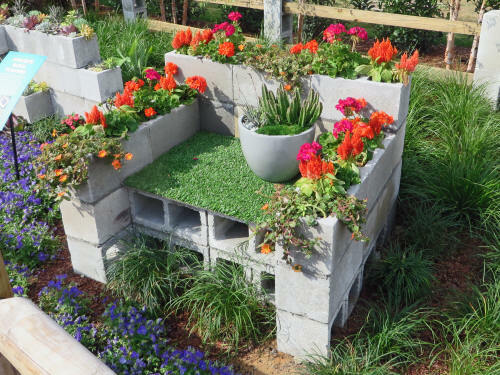 It’s a great way to recycle, or to ‘pay it forward’. You often see posts on the thread - ‘Leaving tomorrow, have extra milk’ or bread, or firewood. It’s a friendly and sharing bunch on that camping site! Wonder why there’s never any surplus beer to share? Hmmm? Once the travelling fire pit was stowed away it was nap time. We both tucked in for over 90 minutes . . . and awoke refreshed! 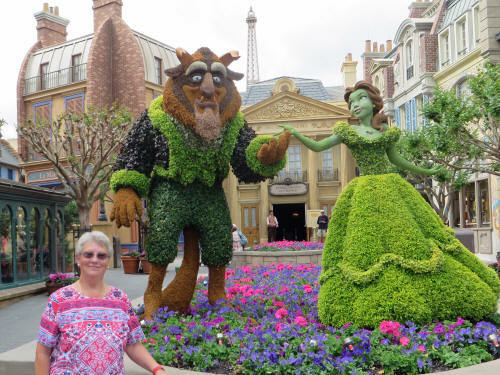 Carol fed the dogs a bit early, we walked them along the canal and left for EPCOT at 5:00 p.m. 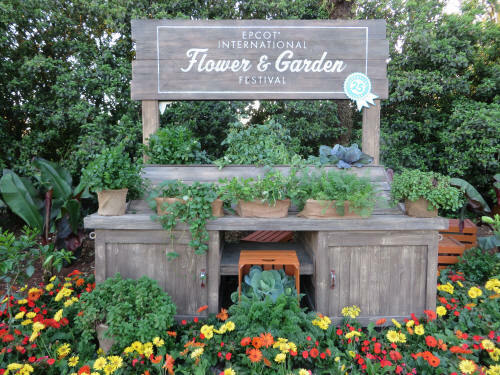 This year they have a number of food kiosks set up as part of the Flower & Garden Festival and we wanted to try some of their fare. 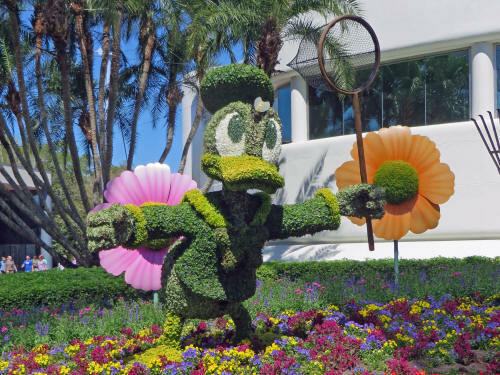 Mickey Mouse was waiting to greet us as we entered EPCOT! 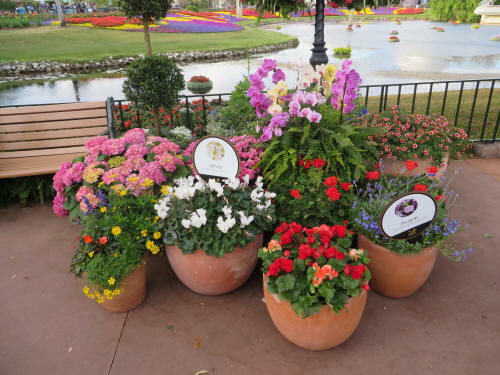 We enjoyed some of the Flower & Garden displays as we made our way back to World Showcase where the kiosks were set up. 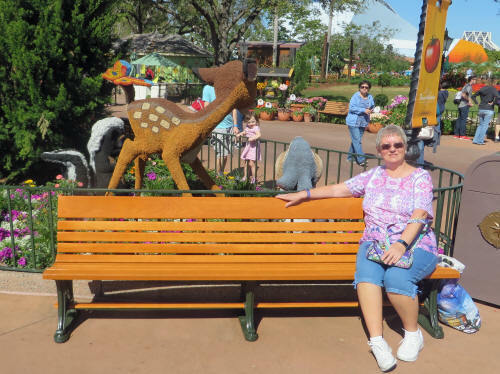 Carol really enjoyed meeting Orange Bird, he's one of her favourite characters! 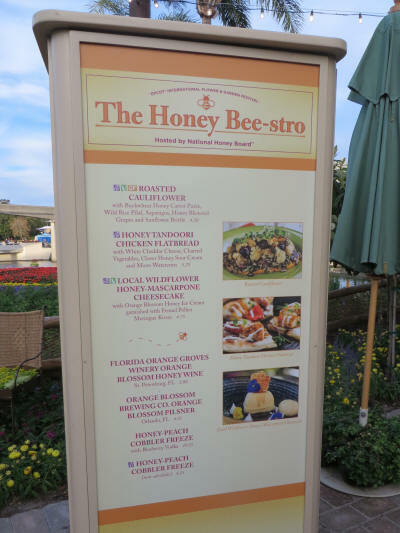 Our first food stop was the Honey Bee-stro where we had three dishes, roasted cauliflower, chicken flatbread and mascarpone cheesecake. All three were delicious, we ate every bite! 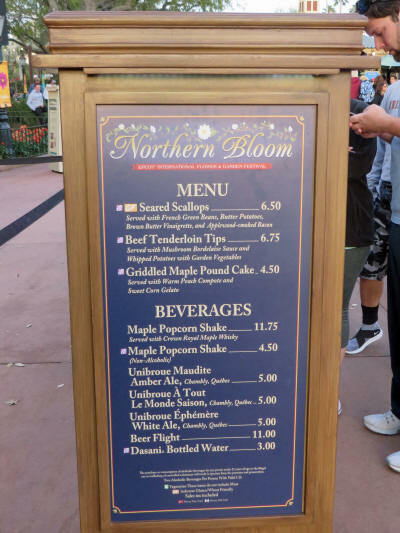 Next was Northern Bloom, where we also had three dishes, beef tenderloin, seared scallops and maple pound cake. Once again we cleaned up all three plates - in fact it looked so good that I didn’t even think to get a picture. 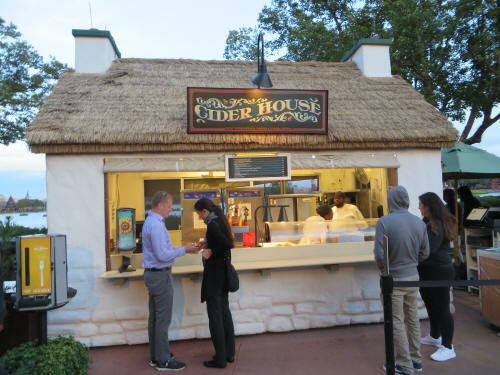 We carried on to The Cider House and once again all three dished sounded delicious, so we ordered them all. 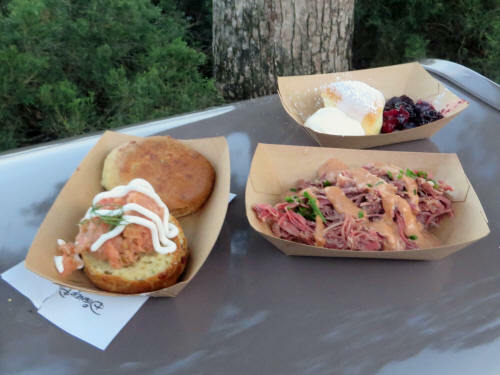 I enjoyed the potato and cheddar biscuit with smoked salmon and Carol liked the shredded corned beef but we both agreed that the lemon scone with berries was great. We were both starting to feel a bit full, so when we got to the Berry Basket we decided to have dessert and call it a night. 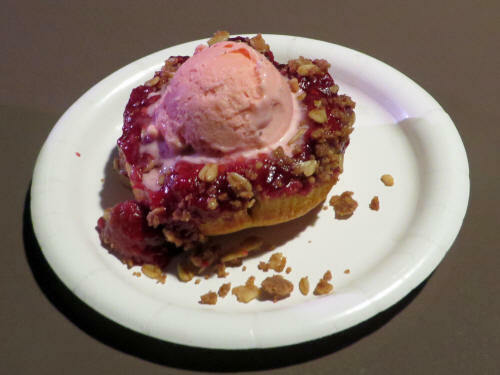 The wild berry buckle was the best dish we had all night. We’ll probably be ordering that one again! 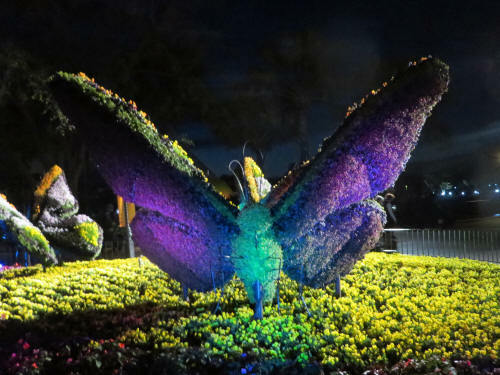 We wandered toward the exit, enjoyed some more of the floral displays and topiary along the way and were home with the dogs by 8:00 p.m. It was another nippy morning. Carol got up at 6:30 to let Jak out and told me, “It’s down to 40° out there this morning.” I pulled the duvet up and rolled over for another half-hour of sleep! We took the dogs for a walk along the canal and by 9:00 a.m. were in the car on the way to Hollywood Studios. We had a very light agenda for the day, only two FastPasses, Tower of Terror and Toy Story Midway Mania. We slowly ambled up Hollywood Boulevard as Carol checked out every cast lanyard and even stopped to trade at a pin board. I took a few pictures while she indulged her pin collecting obsession hobby. 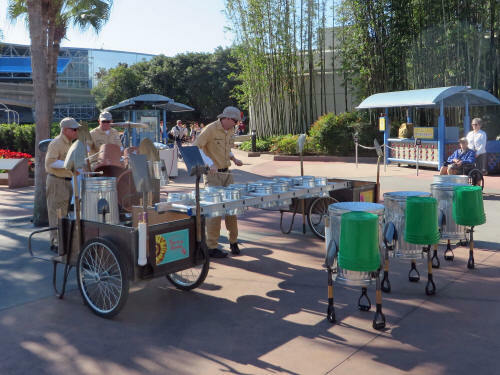 The park wasn’t terribly crowded yet and the streetmosphere performers were out entertaining guests in several spots! 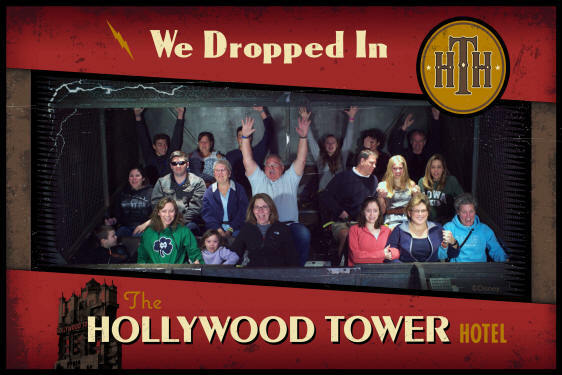 We had a couple of PhotoPass pictures taken and then it was time to join Rod Serling and take our elevator ride to the Twilight Zone. 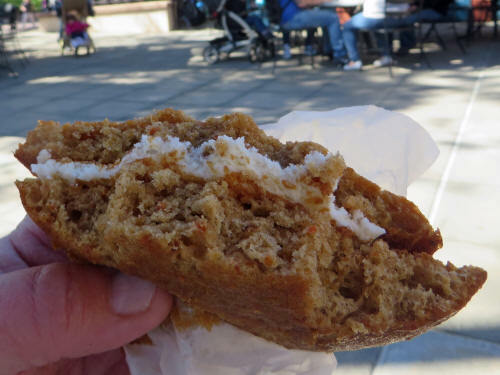 After our terrifying misadventure in the tower we decided to reward our bravery so we picked up a carrot cake cookie at the Sweet Spells Shop on Sunset Boulevard. As we sat sharing our cookie at a nearby table Carol noticed a backpack hanging on the back of a chair. Some poor guest had left it behind. Carol took a quick look through it looking for a phone number to give them a call. No such luck, it contained their passport and lots of other valuable stuff, but no phone number that we could see. 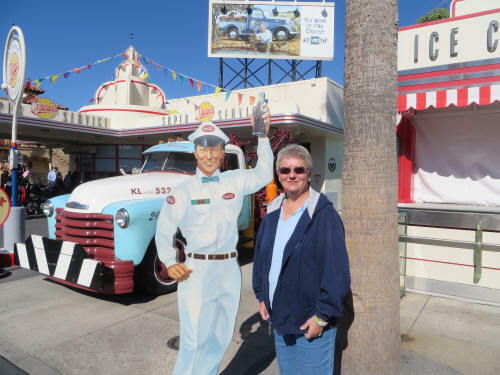 Carol turned it in to a cast member at the Information Booth on the corner of Hollywood and Sunset. We sure hope they’re able to retrieve it before heading home! 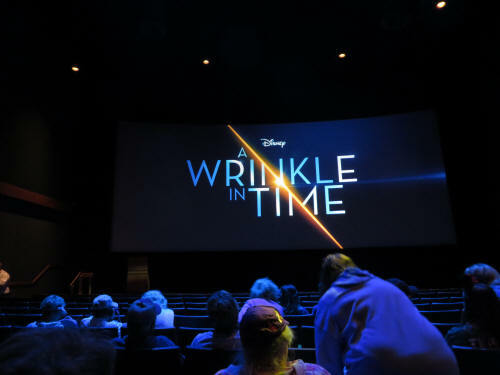 We carried on toward Pixar Place and stopped at Walt Disney Presents (formerly One Man’s Dream) to watch the special preview trailer for A Wrinkle In Time. It looks great, we definitely want to see that one in a theatre, probably in 3D or Imax. 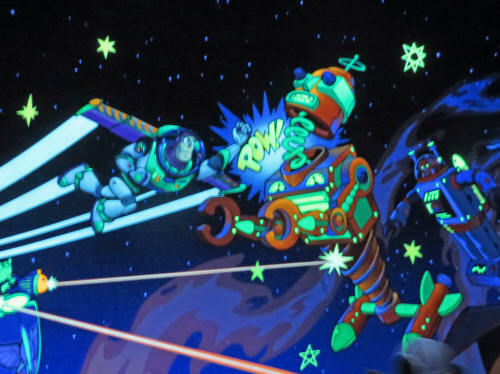 Then we rode Toy Story. Carol took the lead early and was ahead all the way through the ride . . . but in the final event, when those mine cars are falling off the track I swept ahead to record a slim victory. Bwaah Haa Haa! 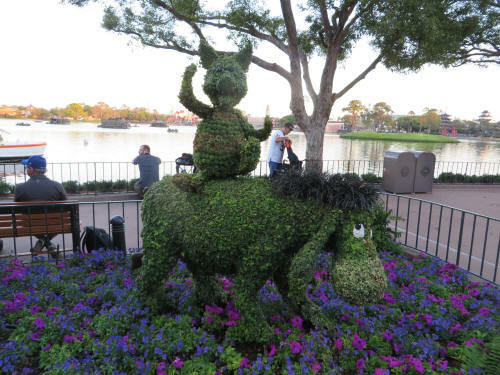 Does this ride bring out the competitive animal in both of us? No, not at all! 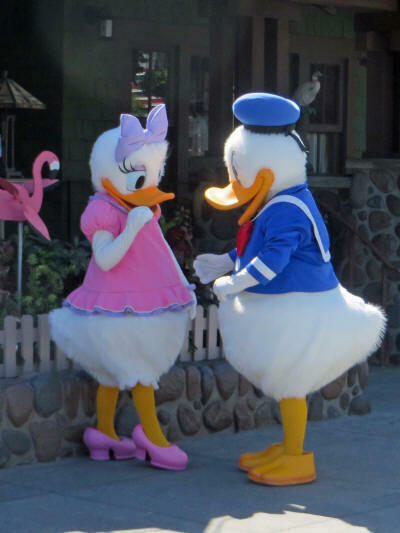 As we were leaving the park at 11:45 we spotted Donald and Daisy off in a quiet corner. We were going to go over for a picture with them, but their body language hinted that this might have been a ‘special moment’ in their relationship. I was expecting Donald to drop to one knee, but he hadn’t done it by the time we walked out of sight. Once we were in the car heading home Carol said, “Let’s go to TD Collectibles. 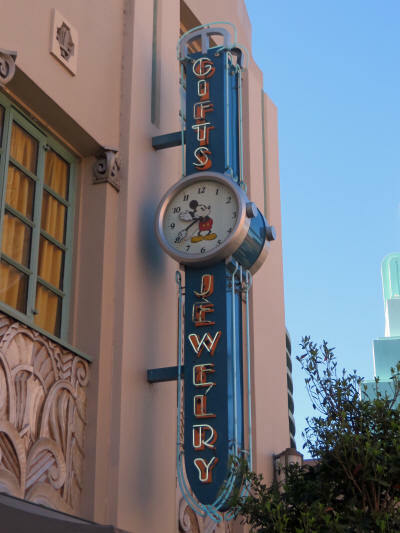 I need to buy some trader pins.” That’s a store in Winter Garden that sells all sorts of Disney collectibles including pins. I turned the car around and we made a quick dash up Highway 429 to Winter Garden. Dang - the store was closed when we got there. Ah well, it’s not far away, we’ll get there another time! We were home with the dogs by 1:00 p.m. and they joined us on the patio while we had sandwiches for lunch at the picnic table. The dogs enjoyed a good workout at the off-leash park today. Blue and Jake chased their ball while Jak ran and played with Elly, a very friendly and active 3-year-old boxer. All that exercise was followed by 90 minutes of intermittent snoring which emanated from two humans and three canines. 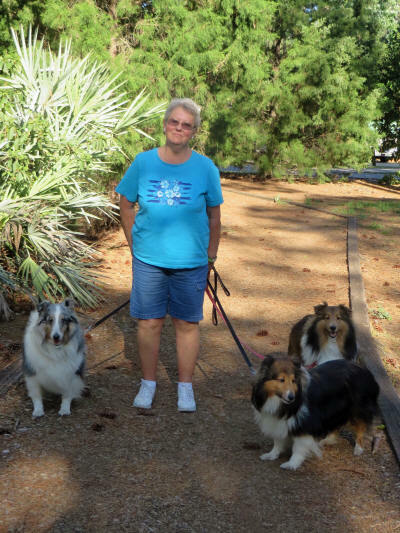 Carol fed the dogs at 5:00 and we walked them along the canal before heading out to Old Key West for dinner at Olivia’s. We checked in a few minutes early for our 6:15 reservation and were seated immediately. It was the best dinner we’ve had so far. Carol started with chicken pot pie soup and I had conch fritters, both were excellent. Carol’s entree was buttermilk fried chicken; I had mahi mahi. We didn’t have room for dessert, but we ate it anyway! Carol had vanilla bean ice cream with chocolate sauce and I had banana bread pudding sundae. We were stuffed when we left Olivia’s! We made two quick stops, first at a Winn-Dixie grocery store, then at a Walgreens pharmacy and got home at about 8:15. We had prowlers! 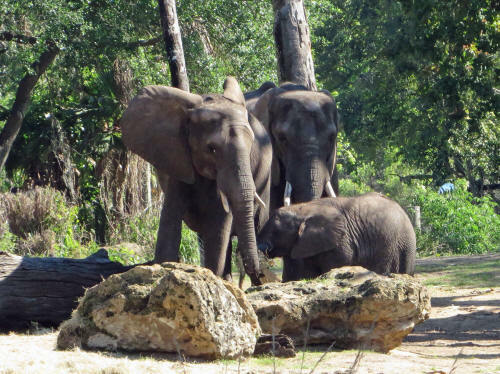 Our friend Hilda, her daughter Stephanie and another friend were parked beside our golf cart. They came in and we had a nice visit for about a half hour. We spent the rest of the night watching TV. It was a quiet day . . . a gloriously quiet day. Jak has an excellent internal clock. He had Carol up at 6:30 sharp and I followed a few minutes later. It had warmed up a bit outside, so we were able to sit out with coffee and listen to the birds and the boat whistles. We took a few more dog portraits on the golf cart, then at about 9:45 took them off to the park for some exercise. At about 11:00 Carol left with her pin trading bag. 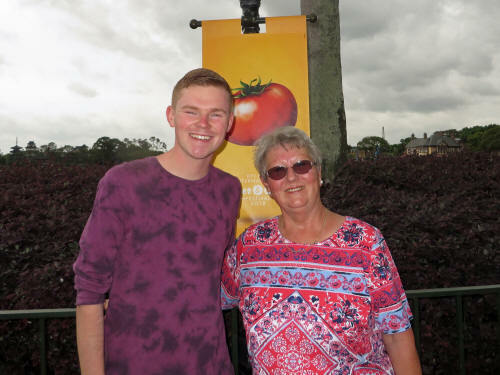 She joined a group of Disney Pin Traders at a nearby Italian restaurant and spent several hours chatting and trading. There were quite a few people she knew from previous pin events in Florida, New Jersey and Ohio so there was plenty to catch up on. I stayed home with the dogs and spent most of the day sitting out on the patio reading my book. I took a break and cruised around a few camping loops on the golf cart and had a sandwich at the picnic table, but most of the rime I was reading, soaking up the sun and fresh air. Very relaxing! Carol was back home at 3:00 pm. and told me she had a great time. “Did you make some good trades?” I asked. “Only one,” she replied, “I only made one trade, but it’s a nice pin.” She was there almost four hours and made one trade . . . sounds like there was an abundance of yakking! It was getting cooler and overcast by the time she got home - perfect weather for a nap! Ooops! That nap came to an abrupt end when Carol checked the clock and said, “Uh-oh, it’s quarter to five. We’ve got to get moving!” She was up in a flash and before you could say ‘Art Smith’s Homecoming Florida Kitchen’ the dogs had been fed and walked. We were in the car and on our way to Disney Springs by 5:20 and that was a good thing. The parking lot was full and it took a few minutes to find a spot to pull in. 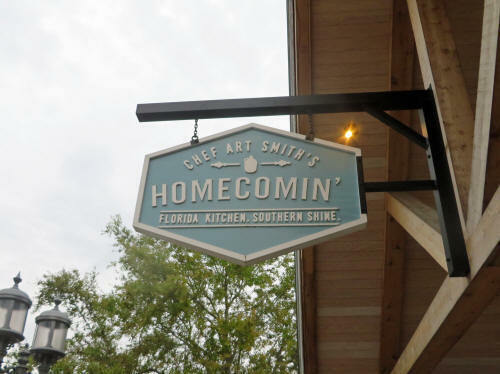 We arrived just a few minutes early for our 6:00 p.m. reservation at Art Smith’s and were seated promptly. We skipped appetizers; we knew from previous experience that the food was good and the portions were huge. Carol was tempted by the chopped pork barbecue plate but she ordered he regular dish, fried chicken, instead. I tried The Art Burger - a gigantic double-decker. Everything was terrific . . . but we couldn’t finish it all. We brought home enough fried chicken and mac ‘n cheese to feed us both at lunch time tomorrow. 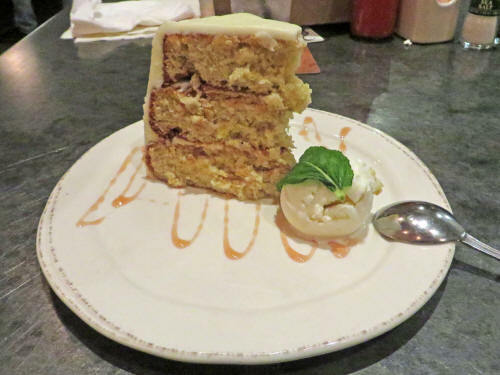 We topped the meal off with one of Art Smith’s specialty dishes, hummingbird cake. It’s pineapple-banana cake with cream cheese frosting and, try as we might, we couldn’t finish it either! Carol toyed briefly with the thought of shopping but quickly decided that she was too full and a bit too tired. That was great news for me! We hopped in the car and were home with the dogs by 8:00 p.m. for another quiet night of television. We were surprisingly tired after our gloriously quiet day. Carol was up before the dogs this morning! They slept in until 6:53 when Carol hopped out of bed. Of course, we had turned the clocks ahead an hour Saturday night, so it was only 5:53 in ‘yesterday-time’. I was up just a few minutes later; we needed to get an early start to make it to Animal Kingdom for our first FastPass which was 9:15 - 10:15. There was no slothful coffee sipping outside, Carol was an active expediter and had everything moving along at a quick pace. By 8:45 I had showered and had a bite of breakfast and Carol had fed the dogs and gotten herself all prepped for the day. 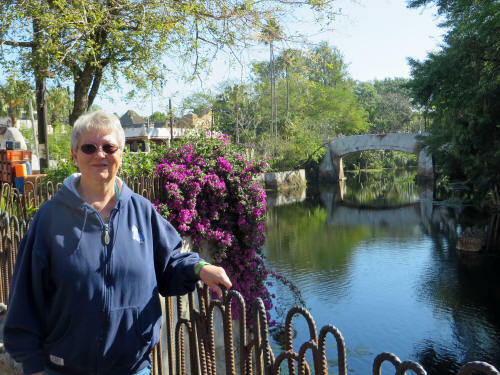 We took the dogs for a nice walk along the canal and by 9:00 a.m. we were in the car on our way to Animal Kingdom. Carol has been leaving her backpack and her purse behind this trip. If it won’t fit in her pocket, it doesn’t go with her. The only thing I carry is the camera and as a result we can whisk through the ‘No Bag’ line and save a few minutes every time we enter a park. 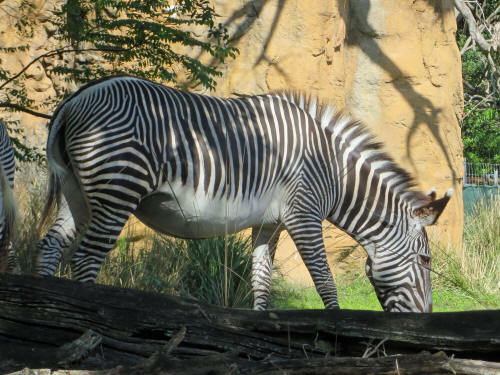 We paused for a few pictures on our way to Africa and arrived at Kilimanjaro Safaris at 9:35, well within our FastPass window. We barely stopped on our way through the line and before we knew it we were sitting in the front row of our safari truck chatting with our driver Nick. 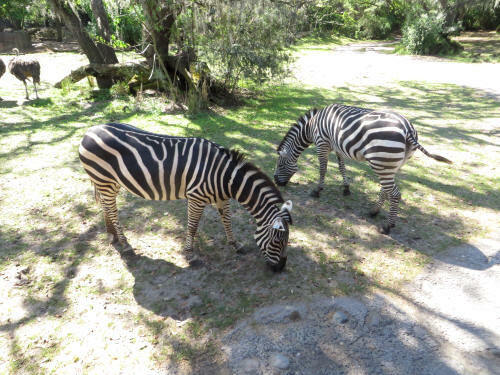 It was a terrific safari. 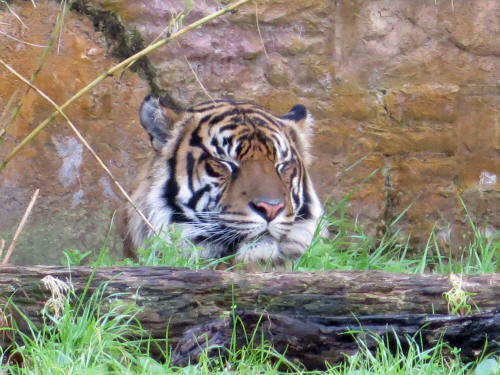 They always seem to be better early in the morning or at dusk; the animals seem more active. Today may have been the most activity we have ever seen. The African painted dogs were up wandering about, not sleeping like usual. 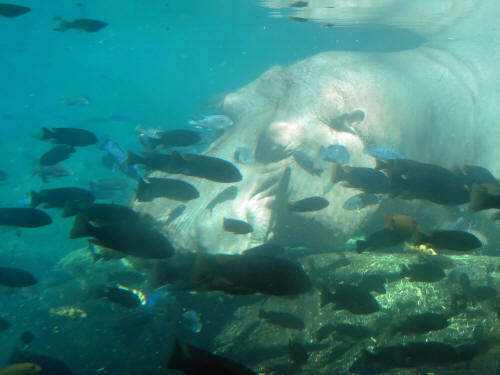 The baby hippo, Augustus, born January 13, 2018 was swimming alongside his mother Tuma. Alas, we couldn’t get a picture from where we were sitting! 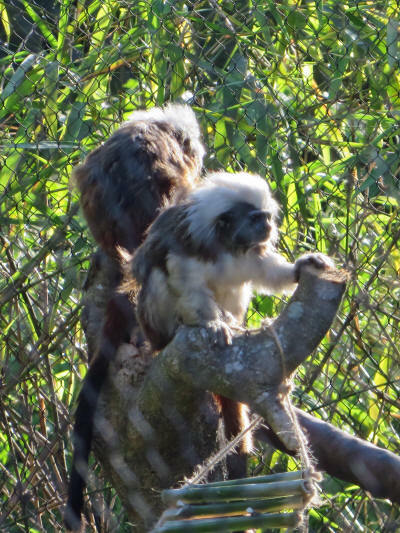 Two of the Nile crocodiles were slapping their tails on the water; a baby mandrill ran across the back of their habitat and scampered up a tree. 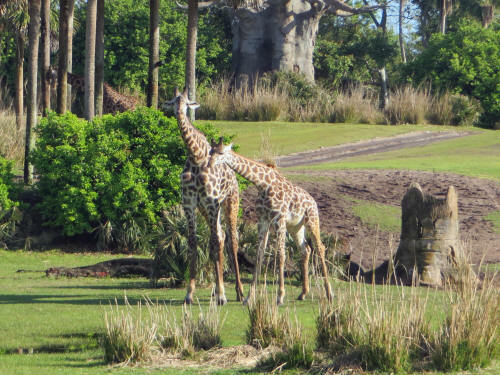 The giraffes were everywhere . . . once again we had to stop briefly for a ‘giraffic-jam’. 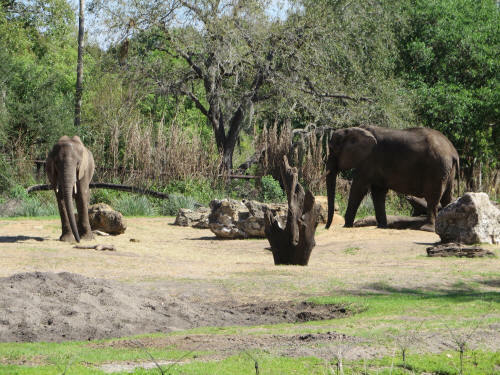 There were several elephants out grazing, including baby Stella, and the flamingos were all flapping their wings and squawking. Driver Nick pulled the truck about two feet too far forward for us to get a picture of the male lion as he rose and stretched, but Carol did get a nice shot of the two resting females. 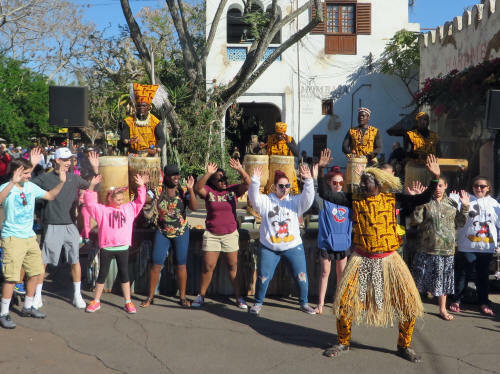 It was one of the most entertaining safari rides we’ve had in several years! 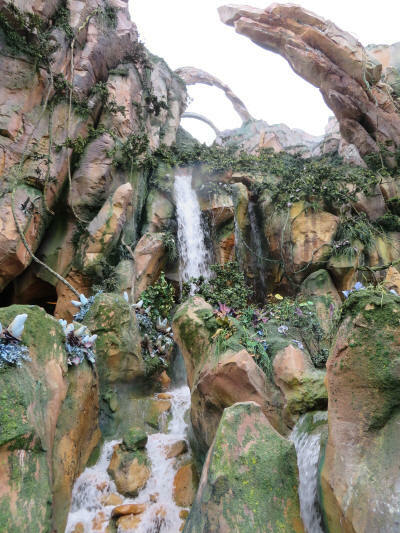 We took the back way, past the Lion King Theatre, on our way to Pandora. We had 10:15 to 11:15 FastPasses for Flight of Passage. 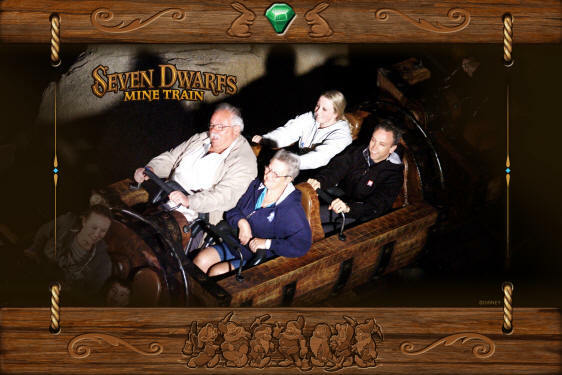 Carol has now ridden this new attraction about eight times and I had only ridden twice before. 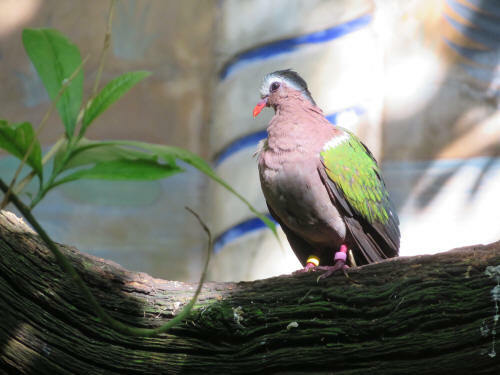 She decided that it’s time I caught up, so she waited while I rode it twice, using my Magic Band for the first flight, then using her band to fly again. It really is an amazing experience . . . and so hard to explain to others . . . it really does feel like you’re flying on the back of a Pandoran banshee. 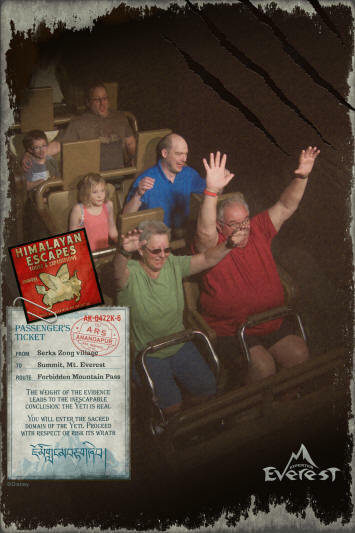 We had FastPasses for Expedition Everest, but it was approaching noon and getting hot, so we slowly made our way to the exit. 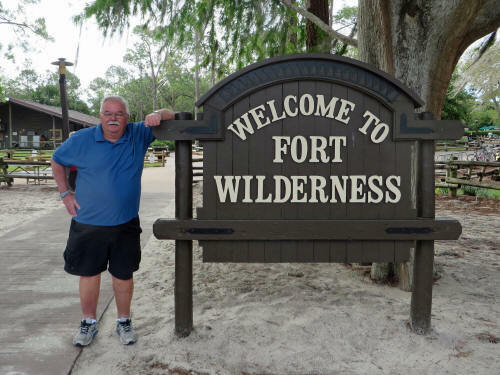 We were back to Fort Wilderness at about 12:15 and stopped briefly in the 1400 loop to let Michael from Mississippi know that we were back. 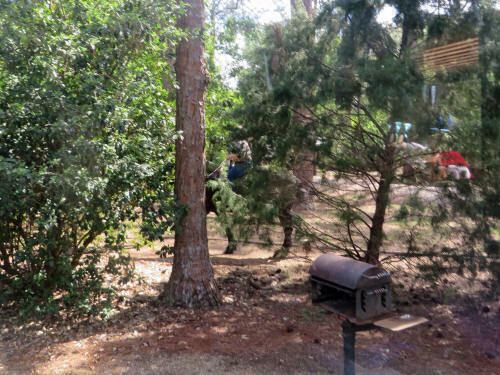 We had just gotten to the campsite and let the dogs out and had a quick lunch at the picnic table when Michael, his wife and two daughters showed up to pick up the travelling fire pit. Once they spotted the dogs they had to come in and meet them, before we knew it their daughters were both sitting on the patio having a love-in with the pups! We had a nice visit with Mike and his family, and as we chatted I couldn’t help but think how well travelled that fire pit really is. 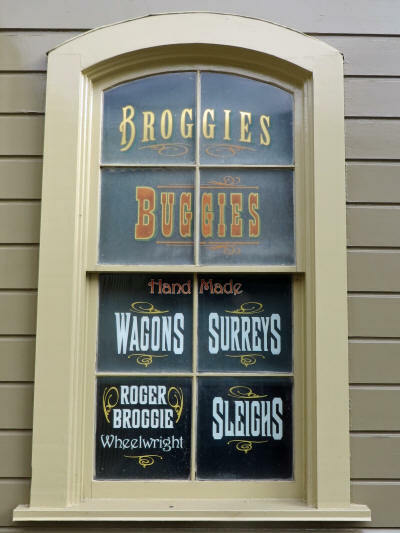 It never leaves Fort Wilderness . . . but . 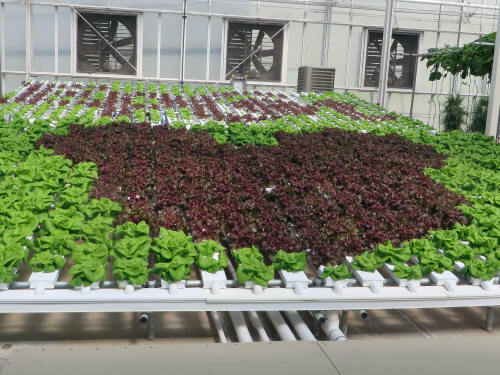 . . it was dropped off with some retired bankers from Ontario Canada by a family of dairy farmers from Wisconsin and the bankers in turn handed it off to a nurse practitioner from Mississippi and his family. Although it doesn’t move very far, it sure gets around! We rested for a while and then our next visitors arrived. It was Mike and Terri, the owners of Wilderness Camper Rentals. They had texted Carol earlier wondering if she wanted them to drop off a vacuum cleaner. Of course she said yes, the dogs have shed their normal amount of hair and they’ve also dragged in some sand and pine needles. It wasn’t me, the dogs did it all! 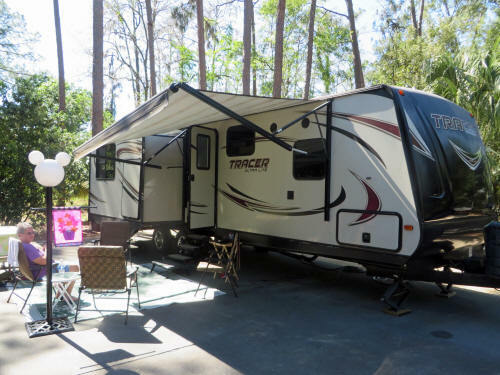 We had a pleasant chat with Mike and Terri and before they left I paid the deposit on the rental trailer we have booked for 2019. The temperature was rising so we turned on the air conditioning and moved inside with the dogs for a few hours. 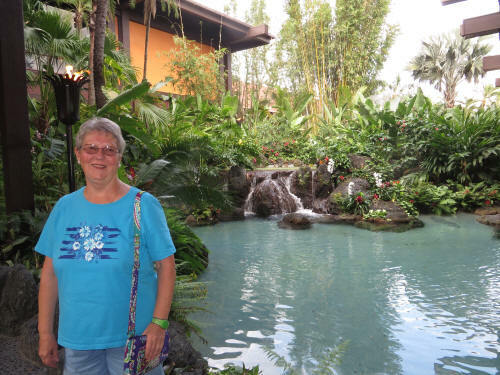 We had a 5:55 p.m. dinner reservation at ‘Ohana so Carol fed the dogs a few minutes early. We were walking them along the canal at about 5:10 when I saw a ripple in the canal. 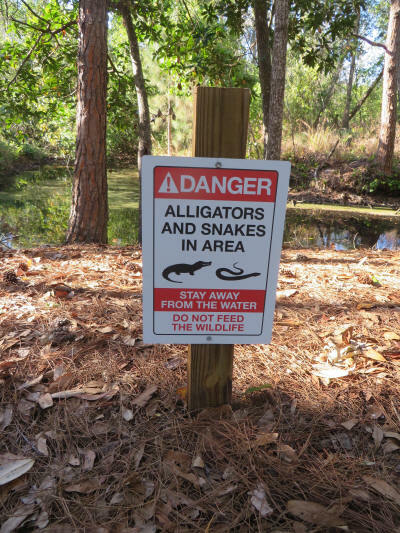 “I think a gator just went into the water.” I told Carol. We both stopped and watched the water closely. A little nose popped up and Carol said, “It’s a turtle - no, no, it’s an otter!” Sure enough, she was right; it was an otter. Have I told you how Carol feels about otters? She can watch them for hours! We followed the otter down the canal; he swam up a little side canal and splashed around in the shallow water, then swam back toward us and turned to swim further down the canal, away from us. We followed him to a spot where there were four big turtles sunning, two on the shore and two on a log which rose out of the water. 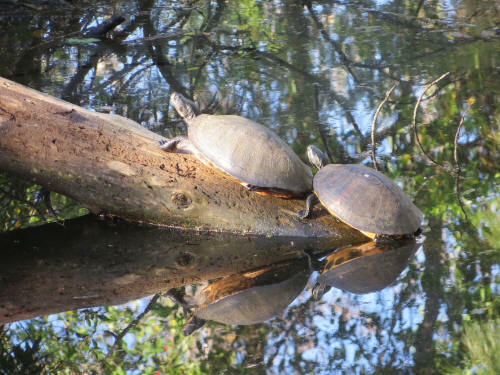 When the otter climbed up the log the first turtle poked out his head and legs and slithered off into the water. The second turtle held his ground. The otter nudged him with his nose, as if to encourage him to jump in the canal. The turtle still held his ground - then the otter used his nose to give the turtle a huge shove and flipped him into the water. It was amazing to watch! All three dogs were sitting beside us, watching the critters put on a show for us. I don’t think we’ll ever walk that canal again without a camera! 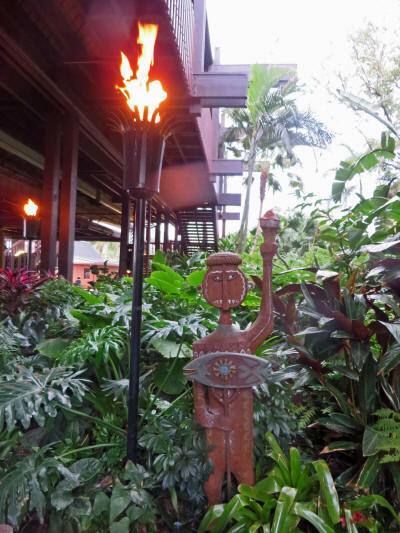 We made it to the Polynesian Village Resort at 5:55 and were seated almost immediately at ‘Ohana. We had a nice meal, but it wasn’t up to their normal standards. The starters, salad, chicken wings, noodles and pot stickers were great, but the beef and shrimp were both really overcooked. We had to send the first offering of beef back, it was inedible. Our second serving was OK.
As always, the dessert was fantastic! 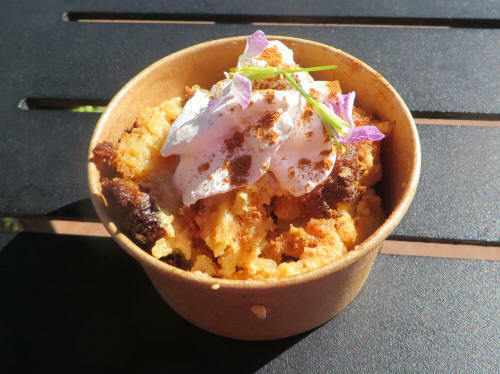 The banana bread pudding is amazing and we never leave a crumb of it behind! 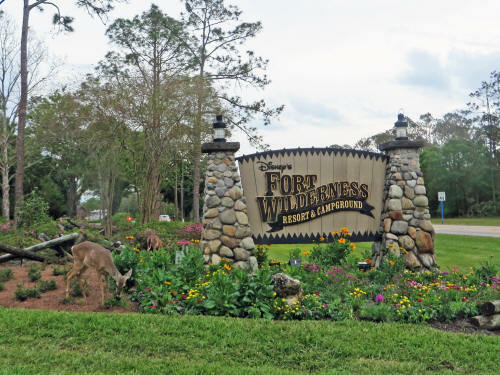 Two members of the local deer population were waiting at the Fort Wilderness sign and welcomed us back home as we drove by! We were back home with the puppies at 7:20. The switch to Daylight Saving Time gave us a short window of daylight. We took advantage of it by loading the dogs onto the golf cart and taking them off to the dog park. They had a good run and played a bit with a husky named Whiskey. It was almost fully dark when we got home at 8:00 p.m. and settled in for an evening of television. Carol was up before dawn again this morning. The dogs were confused and so was I; it will take us all a few days to get used to Daylight Saving Time. It was drizzling very lightly so the dogs didn’t get much of a walk; just a quick trip outside to ‘do their business’ and then right back in. Carol and I sat outside for a few minutes, under the awning, listening to the falling rain until it started raining a bit harder and we took shelter indoors. By 9:30 there was a lull in the shower so we took the dogs for a walk along the canal. I had the camera in my pocket, so naturally the otter was nowhere to be seen. 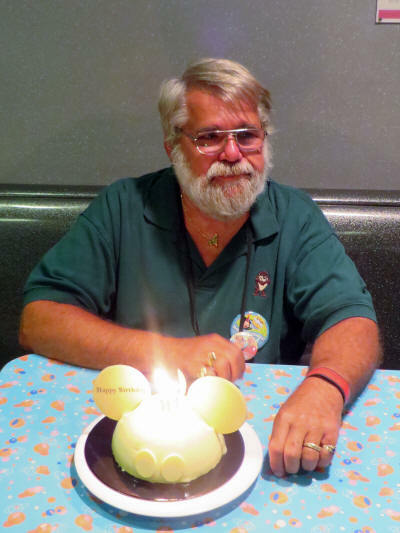 Soon it was time to head out to Disney Hollywood Studios to join a gang for lunch. 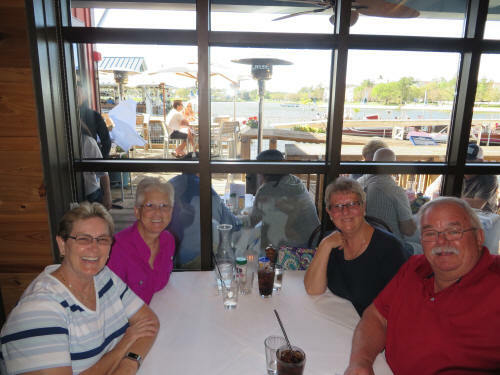 Our friend Al from Missouri was celebrating his 71st birthday and they asked us to join them, along with a few other folks, for lunch at 50’s Prime Time Café. We had just parked and were making our way through the shops on Hollywood Boulevard when Carol looked out the door and spotted Al and Jane passing by on the street. We walked with them toward the Chinese Theatre where Al wanted to get a picture of the Star Wars Stage, the latest eyesore Disney has erected to block everyone’s view of the original park icon. Once Al had his picture we took a slow stroll over toward 50’s Prime Time. We encountered some streetmosphere performers along the way and they were happy to stop for a picture. 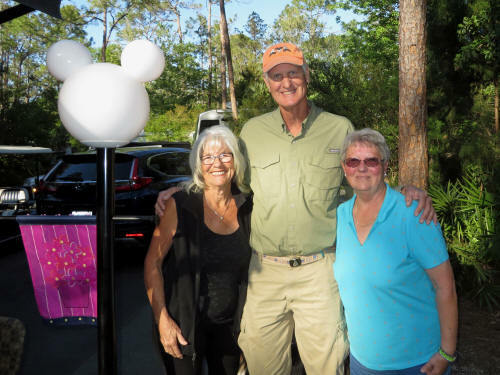 Kevin and Robin, from Illinois, were waiting in front of the restaurant as we approached and within a few minutes Hilda from Fort Wilderness arrived, with her daughter Stephanie. The eight of us were seated by 11:15 and our server Liza did a wonderful job taking care of us and hosting Al’s big birthday shindig. One of the chores Liza assigned us was to list the 26 animated Disney or Pixar movies with one-word titles. Not as easy as it sounds - The Aristocats is two words, not one. We worked hard at it with only moderate cheating (clues from other tables and checking on smart phones were no-no’s so we did them both) and we came up with about 15 of them. Liza was a bit of a smarta$$ when she rattled off the names of all 26 in alphabetical order, almost faster than we could listen. It was good fun! Liza was the best server we’ve had at Prime Time in several years! After lunch the birthday cake arrived. 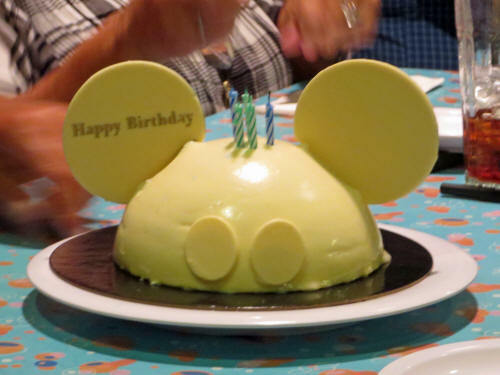 Jane ordered it from Amorette's Patisserie in Disney Springs. It looked good and it tasted good! 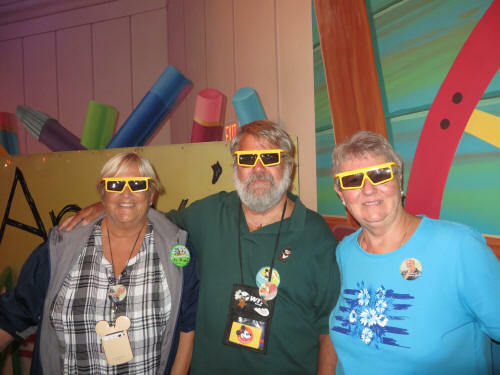 After lunch Carol and I joined Al and Jane and headed to Toy Story Midway Mania where we all had FastPasses. We had to wait a few minutes until our 1:15 FastPasses were valid, then all four of us rode on the same car. 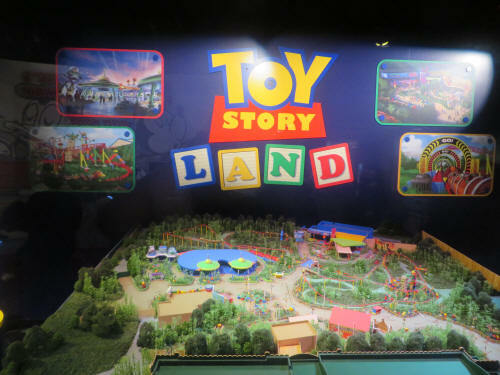 After a short tour of the Toy Story Land preview in Walt Disney Presents, we said goodbye to the birthday boy and headed to the exit. We were home with the dogs just after 2:00 p.m.
Jane told Carol over lunch that today was National Nap Day. 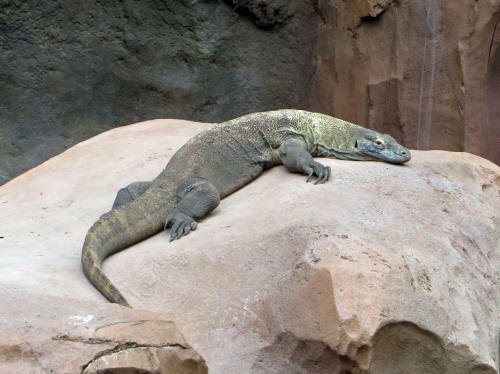 I had never heard of it so I Googled it, and sure enough the first Monday after the switch to Daylight Saving Time is National Nap Day in the USA. It really doesn’t apply to us since we’re Canadian but we figured we might as well give it a try since we’re vacationing in the USA. Glad we tried . . . it worked quite well for us! Carol fed the dogs at 5:00 and we gave them a nice long walk along the canal. This time I made it a point to bring the camera, but as you might expect, there were no otters. 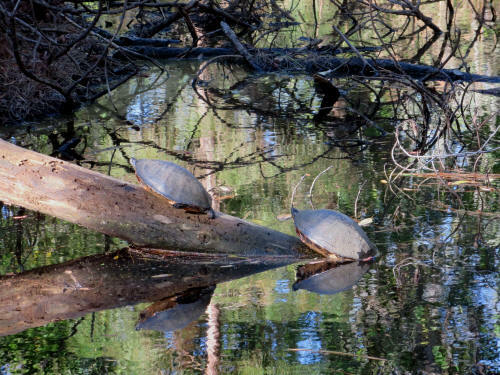 The turtles were there; I’m not sure they were the same turtles but they were in the same spot. 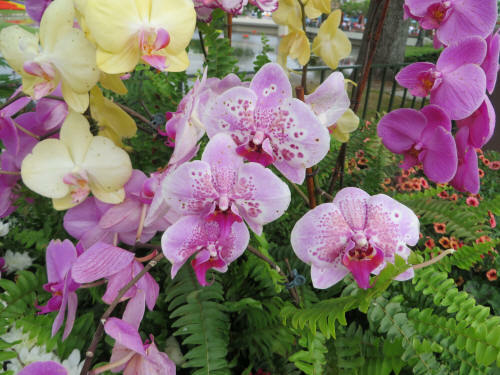 When we finished walking the puppies we hopped in the car and headed to Disney Springs. Can you believe that we’ve been at Disney for over a week and haven’t made it to Earl of Sandwich yet? It was time to remedy that! When we approached Earl’s there were plenty of empty tables outside. When we walked through the door there were plenty of empty tables inside . . . and there was not a single person in line. Not one! It was eerily strange! I grabbed a table and Carol ordered our dinner. We each had tomato soup, Carol enjoyed a tuna melt and I had a club sandwich. As usual it was great, we’ve never been disappointed at Earl of Sandwich. I read my book for a few minutes while Carol shopped. I was thankful she didn’t shop for too long because the wind was picking up and it was cooling off quickly. We were home with the dogs before 8:00 to protect them from the nightly fireworks! 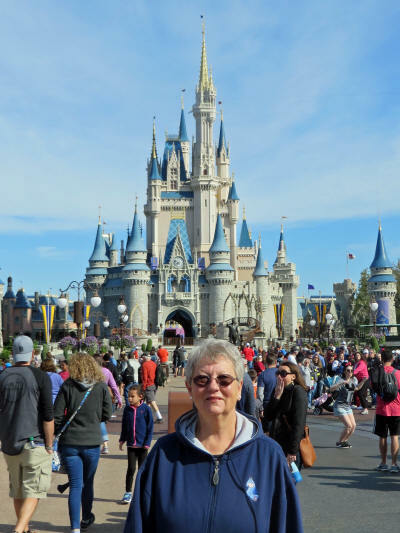 This morning we had FastPasses at Magic Kingdom so after our normal routine - Carol up at 6:30, me up at 7:00, eye-opening coffee, feed the dogs, more coffee, shower, walk the dogs - we caught a boat to the Magic Kingdom. 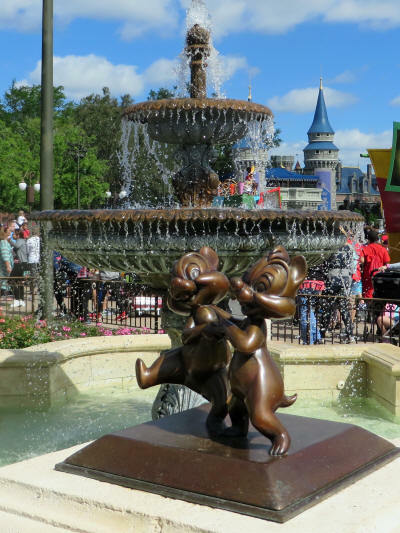 The park was already crowded as we walked up Main Street USA at 9:30; that’s a bad sign! 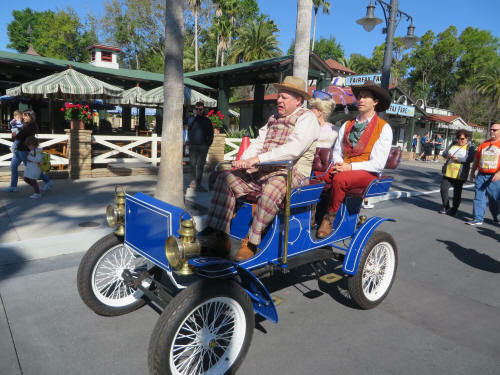 It was so busy that they were already taking the Main Street vehicles out of service. 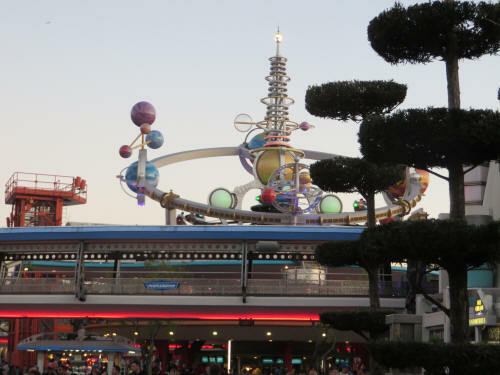 We poked through a few shops as we did our best to avoid the congestion on our way to Tomorrowland. 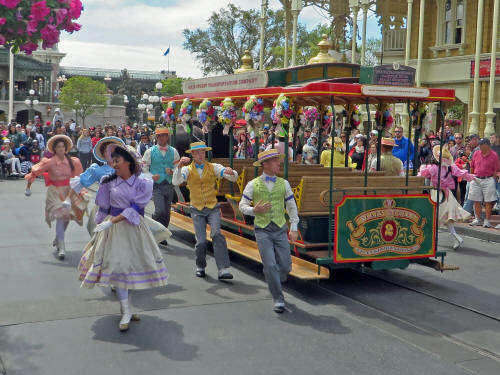 As I passed by an open door I heard a deep voice booming out, “Horse coming, horse coming!” The cast members leading the horse-drawn trolley were having a difficult time parting the crowd as they made their way down the street. 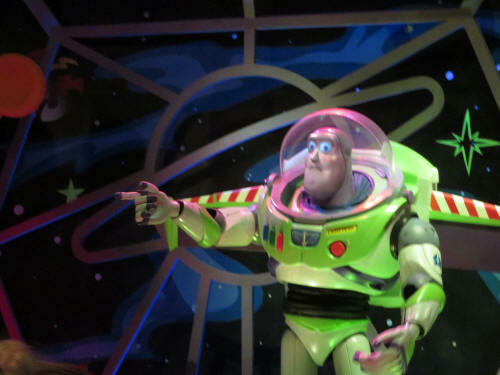 We got to Buzz Lightyear’s Space Ranger Spin at 9:35 and were thankful to have our FastPasses - the standby line was already 50 minutes long. Yikes! Carol took an early lead and when I glanced at her out of the corner of my eye she was looking pretty smug. I was getting very concerned about a potential loss, but then I scored a couple of big hits just at the end to assure my victory. We’re too competitive you say? No, no, not at all! 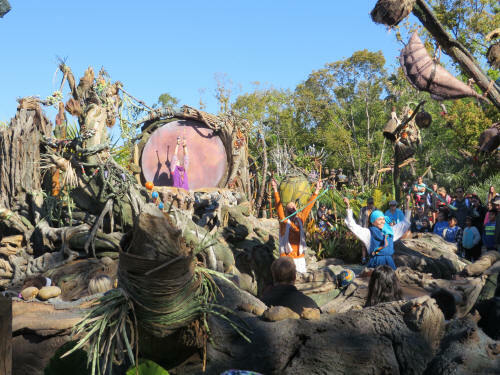 We wandered off through Tomorrowland, astounded at the crowd. It’s spring break in Canada and in many US states and apparently every family with children has flocked to Florida. There was a 70 minute wait for the Tomorrowland Speedway. 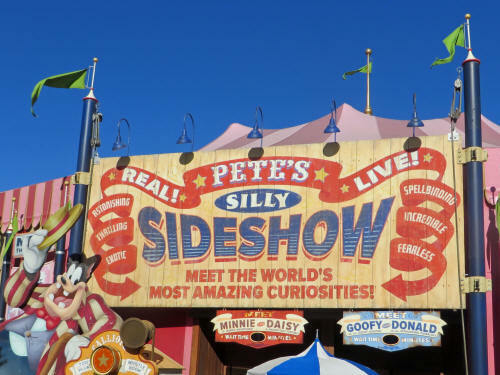 We arrived at the Big Top in Mickey’s Storybook Circus just a few minutes before 10:00 and found a very short line in front of Pete’s Silly Sideshow, so we joined the line to visit a couple of our favourite characters, Goofy and Donald. 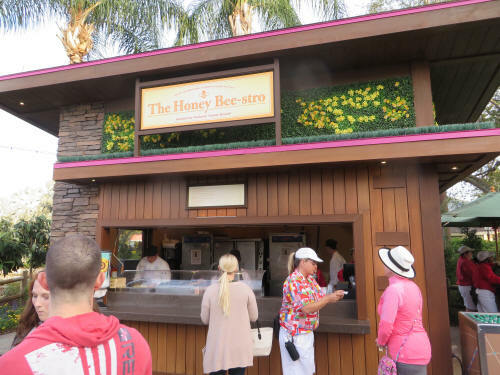 We hoped to finish with the two of them, hustle though the exit line and re-enter to see Daisy and Minnie before it got crowded, but it was too late when we finished, the line for the two ladies already stretched all the way out the door! 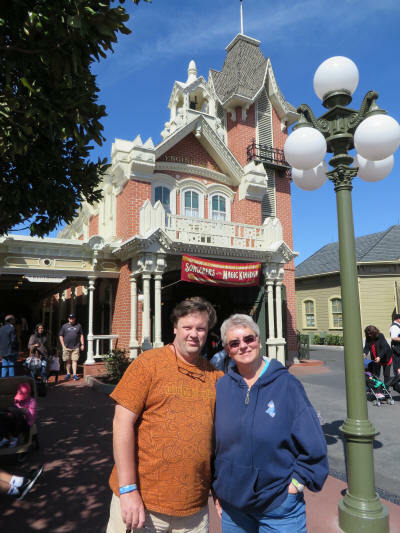 We took a slow stroll through Fantasyland (it was impossible to move quickly) on our way to Frontierland where Carol spent a few minutes browsing through the pins at Frontier Mercantile. 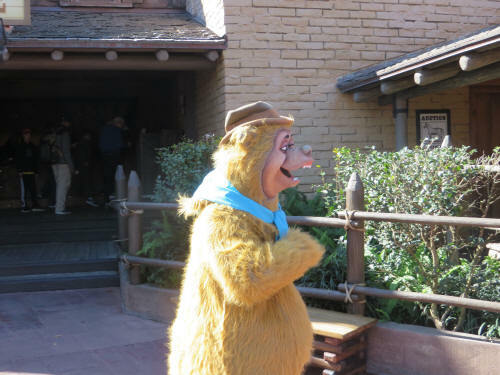 I stayed out on the street trailing Wendel, one of the Country Bears. I tried my best to get a clear photograph of Wendel but it was almost impossible because of the swarm of little children who were following him. 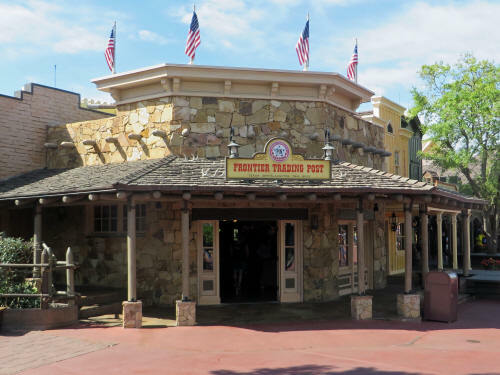 We ducked through the tunnel beside Frontier Mercantile and entered Adventureland. 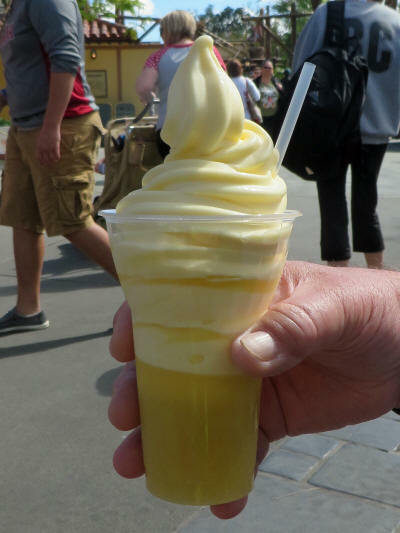 Since we were right beside Aloha Isle I decided that I ought to have a Pineapple Float. 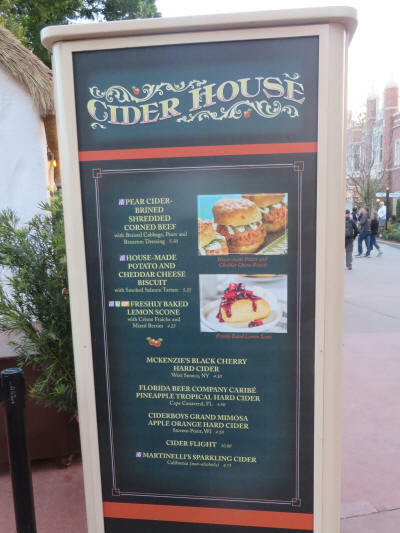 Carol surprised my by saying, “Get me one of those new Pineapple Upside Down Cakes.” I knew she was disappointed when they changed the Citrus Swirl and it became an Orange Swirl, but I didn’t realized she was that disappointed! I had a nibble or two of her cake; they’re very good! 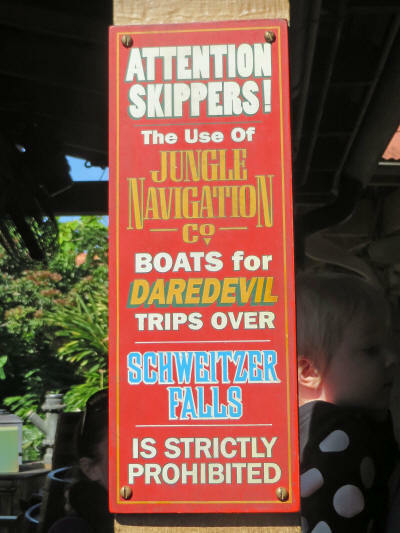 By the time we recovered from our dual brain-freeze it was time for our FastPass at Jungle Cruise. Our skipper was Tara and she did a terrific job. They were the same old corny jokes that we’ve heard many, many times, but Tara delivered them skillfully. She was sometimes exuberant, sometime banal, but always entertaining! It was 11:30 by the time we cruised out of the jungle and we decided to head for home. 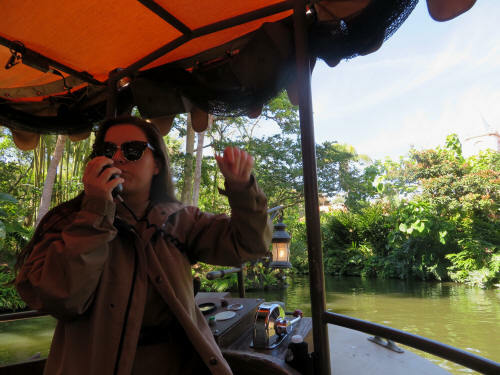 We fought the crowds through Adventureland and down Main Street USA; it felt as though we were fish swimming upstream in a rapidly flowing river. 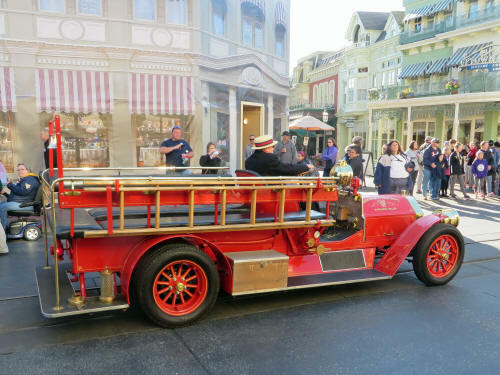 We stopped at the Fire Hall before leaving, to pick up some Sorcerers of the Magic Kingdom cards, and were just leaving the station when a familiar voice asked, ‘Where are all the Canadians?” It was our friend Kevin from Oshawa. We stood in front of the Fire Hall and chatted for ten or fifteen minutes. 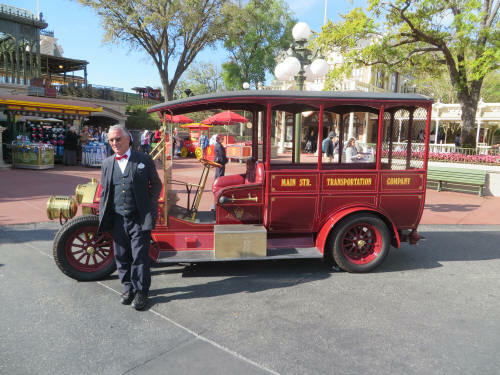 As we yakked with Kevin the trolley came out of it’s garage for fight it’s way back up Main Street. 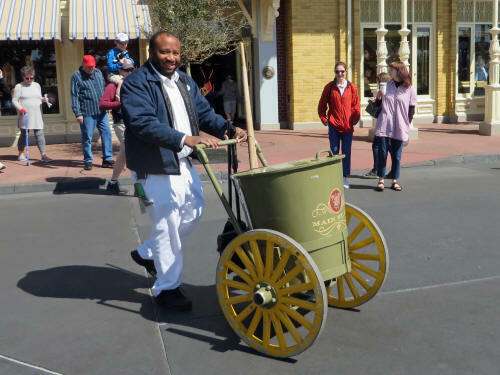 Soon after the trolley passed by along came one of Walt Disney World’s unsung heroes . . . the ‘Road Apple Man’. 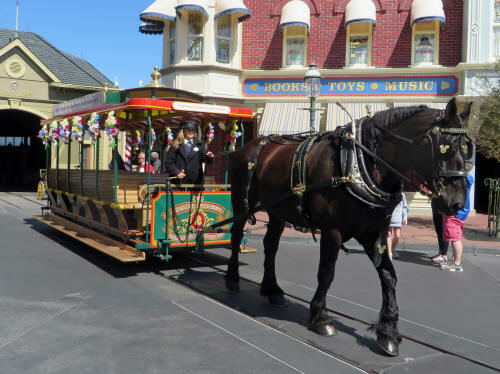 This dedicated cast member trails that horse everywhere he goes to ensure that guests do not step on a fresh, steaming road apple! Hooray Road Apple Man! We said goodbye to Kevin and headed to the dock for our boat . . . which had just untied and cast off! We’ve been having good luck with the boats so far and this was the first time we’ve had to wait more than just a couple of minutes. Back at Fort Wilderness we enjoyed a quiet afternoon. We had sandwiches for lunch before Carol started a couple of loads of laundry in the machines at the nearby comfort station. We took the dogs for a nice long run at the off-leash park and when we got back the dogs and I relaxed while Carol finished up the laundry and put it all away. We had some more horses go by the campsite, it’s an everyday occurrence and the dogs have become quite used to it. They don’t even stir when they hear the clip-clop of hooves! 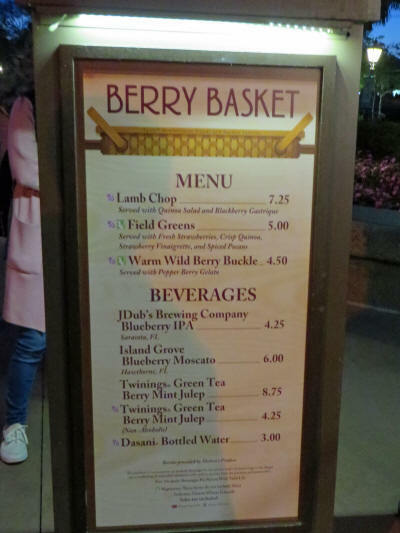 There’s no Road Apple Guy at Fort Wilderness . . . what the birds don’t pick up the street sweeper gets when it drives past each day! At about 4:30 there was a knock on the door. Our friends John and Sharon, from Ohio, were here for a visit. 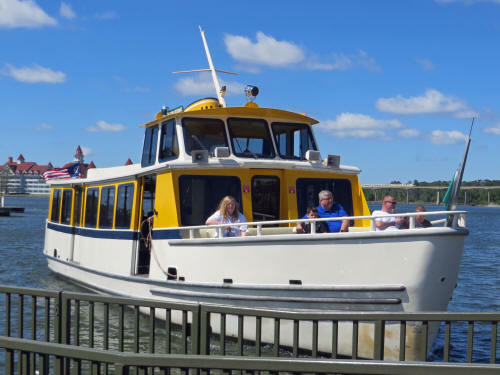 They’re snowbirds who spend summers boating Lake Erie and winters boating the Gulf of Mexico and the Inland Waterway. 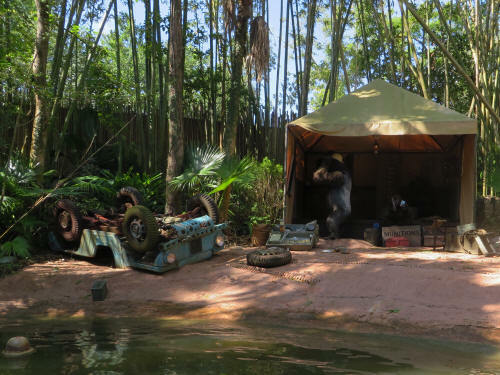 This time they didn’t have their motor home at Fort Wilderness, they had just popped over to Walt Disney World for the day. 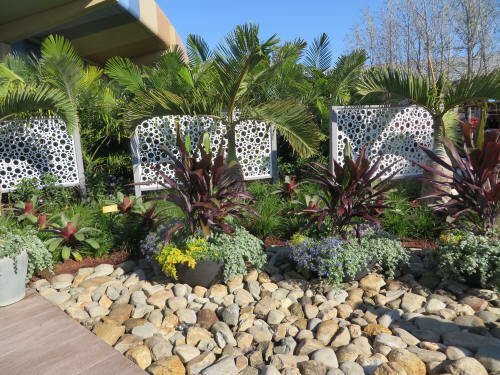 John has been busy doing a big repair job to their Florida home, the pictures of some of the work he has done were astounding. We had a great time with John and Sharon until about 5:30 when Blue became pretty insistent that it was dinner time! Sharon found Blue’s antics very amusing as he continually tried to coax Carol the get the chow ready! 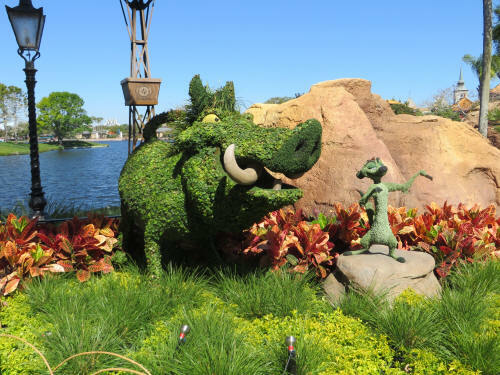 We said our goodbyes to John and Sharon, fed and walked the dogs (no otter, same turtles) had caught the boat Back to the Magic Kingdom. 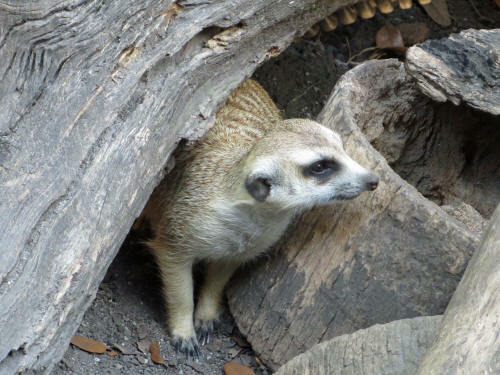 Zounds! It was busy! 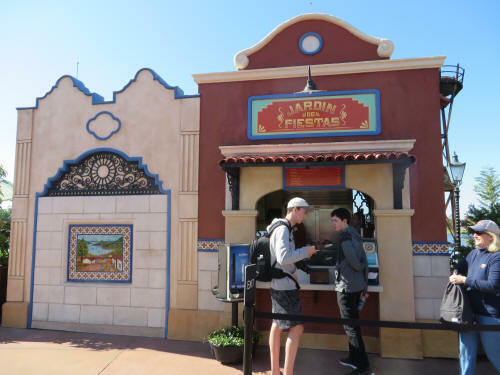 We struggled up Main Street and paused at the Plaza Café to ask us they were taking ‘walk-ups’. 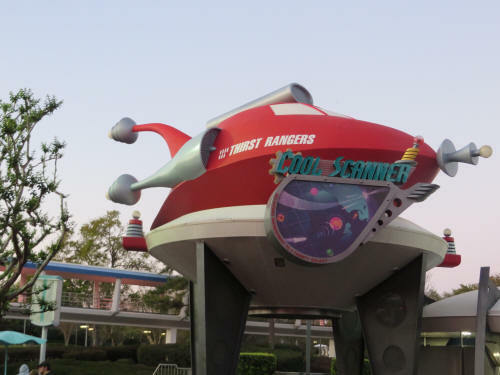 “Yes, there’s about a 50 minute wait.” We knew that meant we would miss our FastPass at the Seven Dwarfs Mine Train so we carried on to Cosmic Ray’s Starlight Café where we each had a burger. 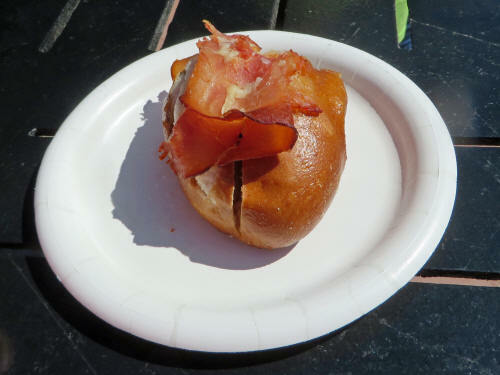 The burgers were so-so but they have a great fixin’s bar so Carol was able to dress them up as gourmet fare! We had time to spare after dinner so we headed to the WEDWay People Mover, there’s never anyone there. Holy Cow! The line zigged and zagged all the way through the queue area and then carried on past the Astro Orbiter line. 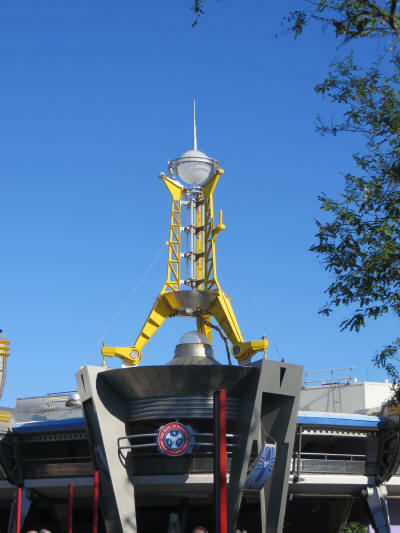 There was actually a cast member holding a tall sign to mark the end of the Peoplemover line. That’s something we’ve never seen before. It was the same everywhere, huge lines and the concourses and walkways were so crowded it was very difficult to move. When we arrived at the Mine Train the FastPass line extended out through the normal queue and all the way down the side of the attraction to the entrance to the Be Our Guest Restaurant. We waited a half-hour in the FastPass line. It’s a cute ride, and it’s nice to ride it a night when you can see some of it much better, but this wasn’t a good night to choose! 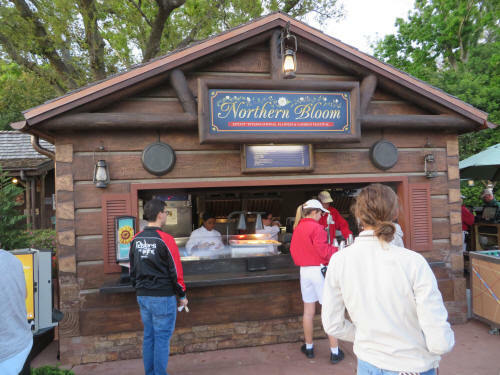 When we finished at the mine we stopped at Gaston’s for a cinnamon bun. 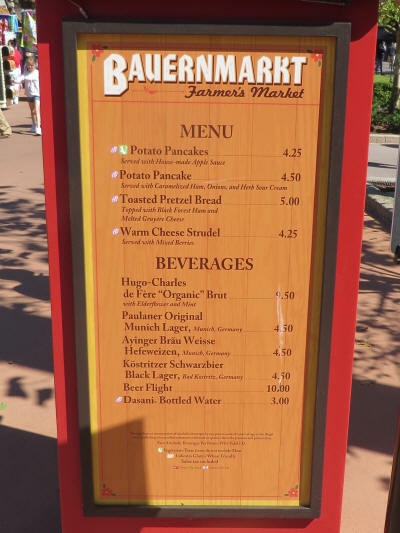 They are OK, but nothing like they used to serve at the Main Street Bakery. Sure miss that place! As we started our exit we discovered that they had closed Fantasyland to prepare for the 8:55 fireworks so we had to exit through Fantasyland and around The Hub where everyone was waiting for the fireworks show. There were cast members everywhere waving flashlights and directing people where to go . . . but everyone was ignoring them. No one was moving. It was a nightmarish traffic jam. People were jostling, people were muttering; at one point a couple came running as fast as they could through the crowd, each of them pushing a child in a stroller. I managed to dodge the mother and her stroller, only to put myself in the path of the father. He deked the baby and the stroller around me and then gave me a solid body-check with his shoulder. He almost knocked me down - what were they thinking? It was the worst crowding we’ve ever seen at Disney. I’m pretty sure the Fire Marshal would have ordered them to empty the park if he/she had seen it! We were very thankful when we finally made it to the dock to board our boat home! 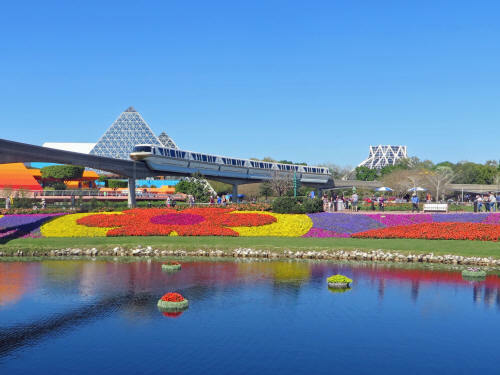 Today we were headed back to EPCOT to enjoy some more of the Annual Flower and Garden Festival. It was a cool morning so we stayed inside with our coffee and when we left for the park at 9:25 I took a jacket along. There was a big traffic jam as we approached the gates to the EPCOT parking lot. Cars were backed up well past the point where the two entry roads merged. Not a good sign! When we got out of the car in the parking lot it felt a bit warmer so I left the jacket behind. It turned into a nice sunny day and I didn’t feel cool at all. The traffic jam was a false signal, the crowd wasn’t all that bad . 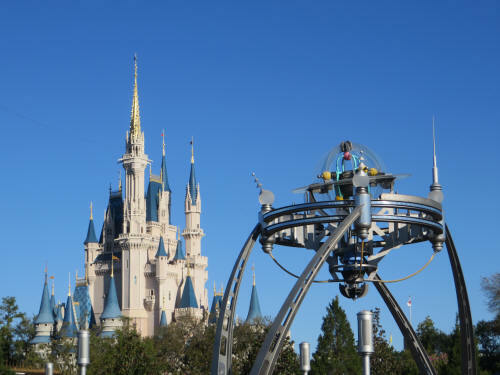 . . especially compared to yesterday at the Magic Kingdom. Once again Carol had no bag and we breezed through the ‘no bag’ check-in line. 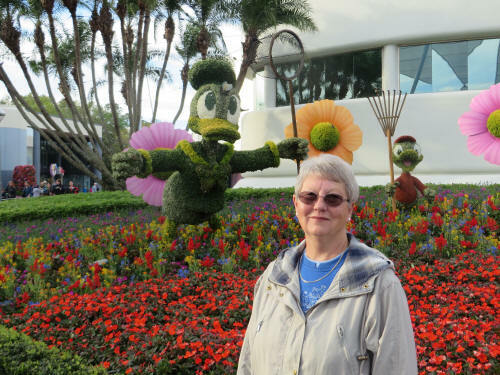 Carol made a quick stop at Pin Central while I took yet another picture of the Donald Duck topiary behind Spaceship Earth. 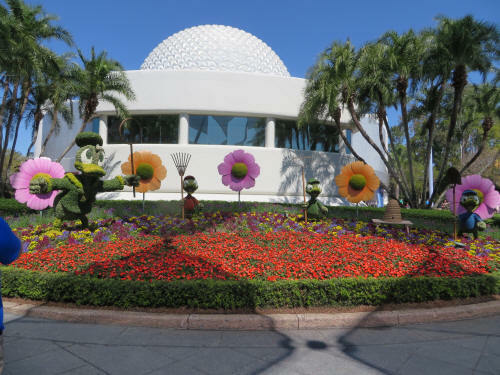 We wandered through the breezeway at Innoventions East and checked out the Flower and Garden Displays near Mission Space and Test Track. 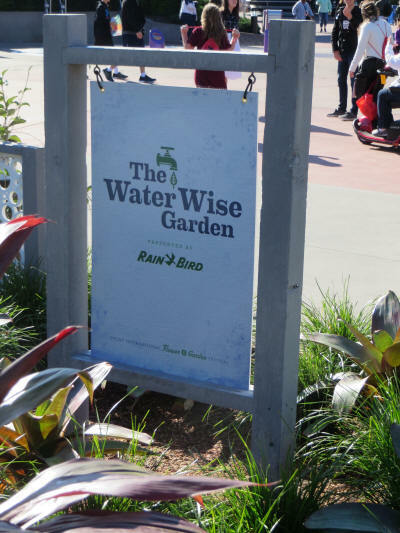 We had just finished checking out the drought resistant plantings at The Water Wise Garden display when we ran into Michael from Mississippi and his family. Michael was the one who picked up the travelling fire pit a few days ago. We had a short visit with them. As we said goodbye to Michael and his family the Jamitors began a performance nearby. 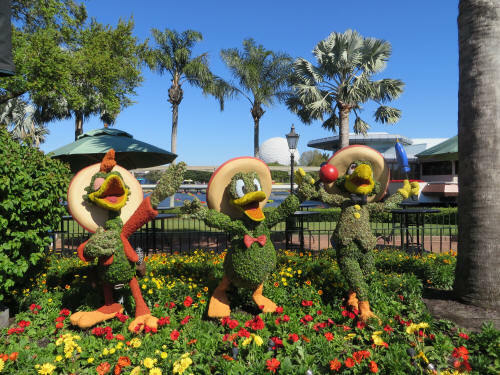 They have added a few flower pots to their pile of percussive instruments and now call themselves the EPCOT Jammin’ Gardeners. They put on a great show! We headed around the Mouse Gear store toward the central bridge between Future World and World ShowCase. 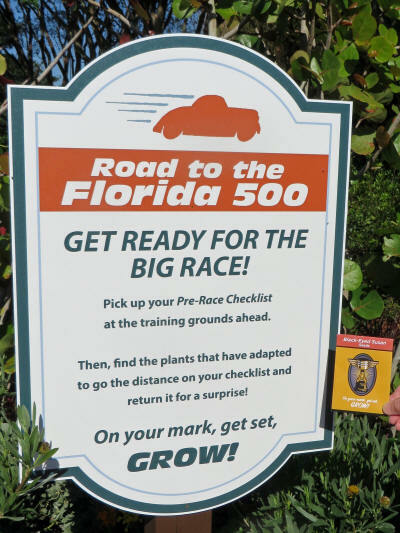 Carol ran the Road to the Florida 500 Race and won a packet of seeds while I took pictures of the many topiary creations on display along the way. 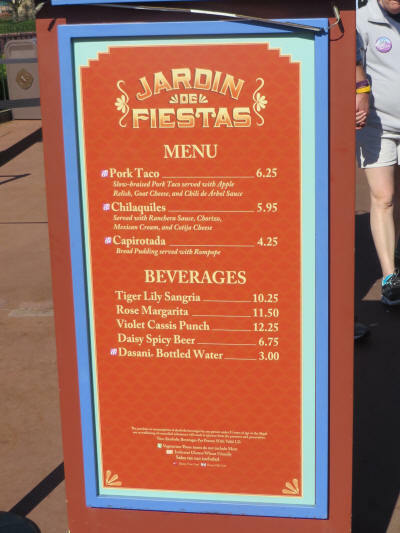 Once we got to the Port of Entry we turned east toward Mexico and stopped for our first bite of what soon became a ‘roving lunch’. 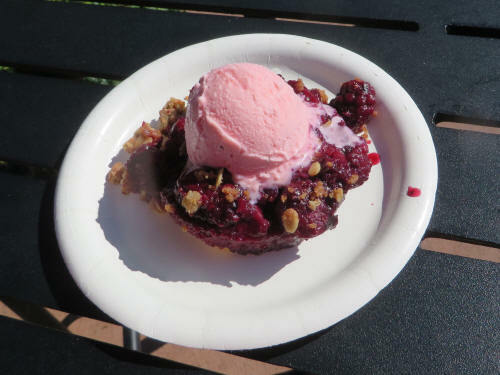 We tried the Capirotada at Jardin de Fiestas. It was a tasty bread pudding with Rompope. I couldn’t distinguish the taste of the ‘pope’ but I’m pretty sure that ‘Rom’ means rum! The rum flavour was easy to distinguish! It must have sparked a craving in Carol because as soon as we finished the Capirotada she rushed back to the Berry Basket and picked up a Berry Buckle. We really enjoyed the one we had last Thursday and I told you we’d be back! 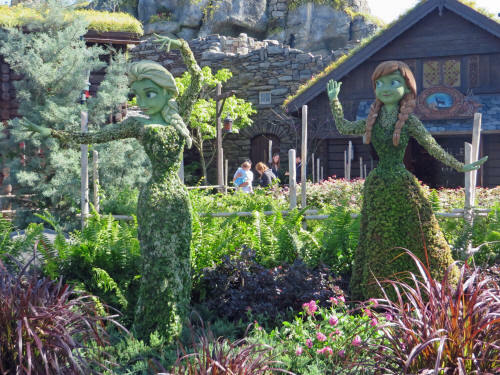 Our next stop was Norway where we had a FastPass for the Frozen Ever After ride. 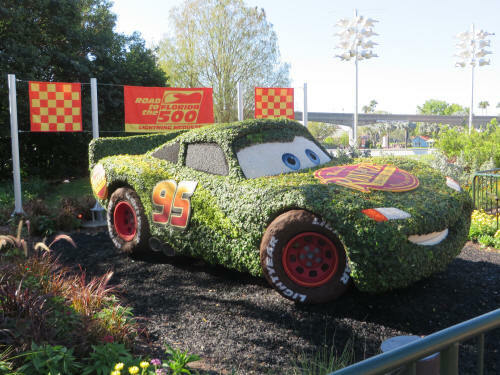 It’s a cute ride but I don’t understand why it’s more popular than Soarin’. The Standby Line was 75 minutes - it takes a lot of little girls to make a 75 minute line! Glad we had the FastPasses, I sure wouldn’t wait that long! 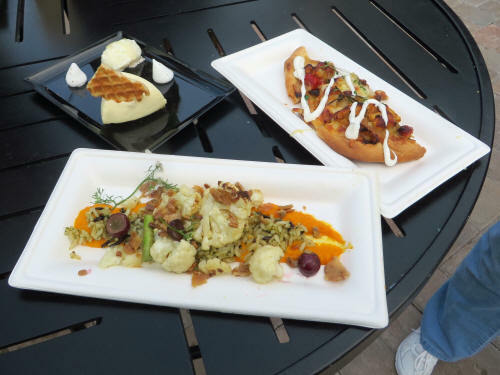 After our trip to Elsa’s Winter Palace we did some more dining. 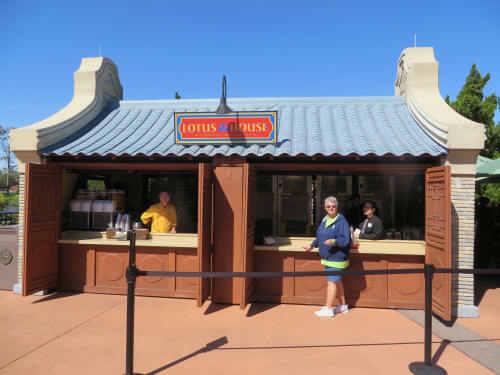 At Lotus House we had Fried Chicken Dumplings and Vegetable Spring Rolls. 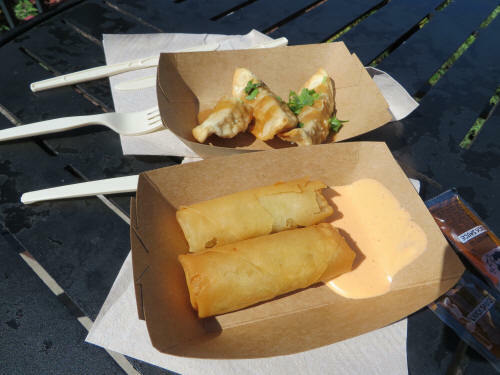 The dumplings were very good, the spring rolls were so-so. At Bauernmarkt Carol picked up the Toasted Pretzel Bread, took one bite then handed it to me while she dashed off to Werther’s to pick up some caramel corn. The pretzel bread was way too salty, I took a bite and tossed the rest of it! The caramel corn, on the other hand, was great. It was time to head home but Carol had one more chore. She dashed off to Canada to buy a sign for a friend back home while I hustled off to Morocco and caught the boat to Canada. I was waiting near the Port of Entry when she came along, bag in hand. She had the sign, one more thing to tick off the shopping list she arrived with! We were home with the dogs by 1:00. 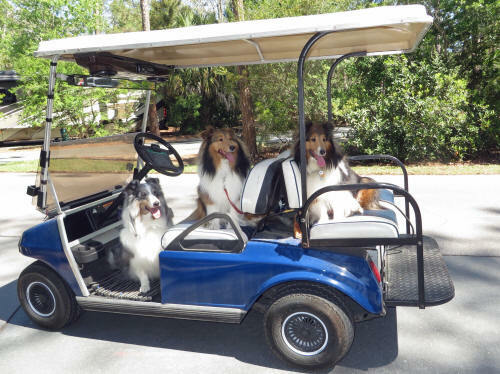 Once their tails stopped wagging we loaded them on the golf cart and headed to the park. They enjoyed a nice long run! As you might expect, we laid down for a nap. It didn’t work for me today, so I took the dogs and sat outside with my book while Carol rested. 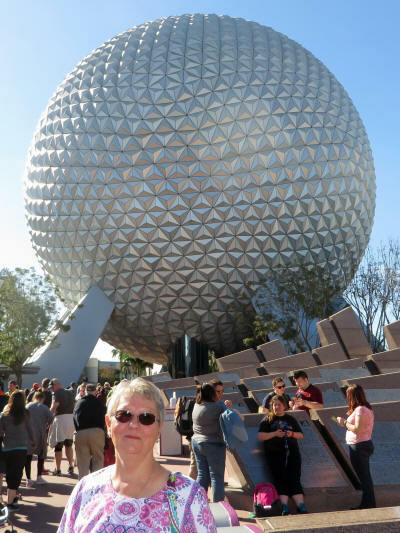 After a quiet, relaxing afternoon Carol fed the dogs a bit early and we headed back to EPCOT for dinner. We had a 6:05 reservation at Nine Dragons in China. 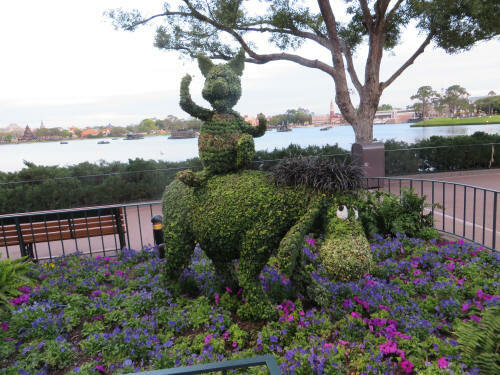 We arrived a bit early so we took a slow stroll back to World Showcase, snapping pictures along the way. We checked in for dinner at 6:00 and were seated immediately. We hadn’t eaten at Nine Dragons in about a decade. We had a few disappointing dinners there a long time ago and decided to give the place a rest. A couple of friends had dinner there last month and really enjoyed it so we decided to give it another try. Our friends were right, it was good. We really enjoyed it. After dinner we wandered back to Mexico and took the Gran Fiesta Tour. The line was the longest we’ve ever seen there, and by the time we finished the ride, there was no line at all. Just a quirk of timing I guess! We wandered to the exit, hopped in the car and were home with the dogs by 8:00 p.m.
We had a quiet day planned today. 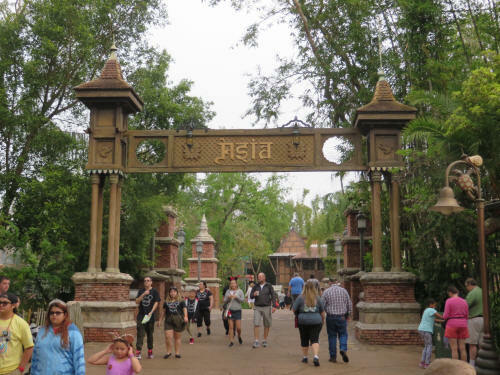 After our normal morning routine with the dogs we hopped in the car just after 9:00 a.m. and headed for Animal Kingdom. 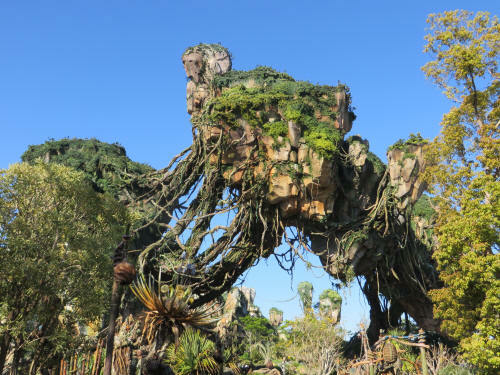 We had two FastPasses booked, one for the Na’vi River Journey and one for Kilimanjaro Safaris and wanted to get them done and get out of the park before it got busy. And that’s what we did! 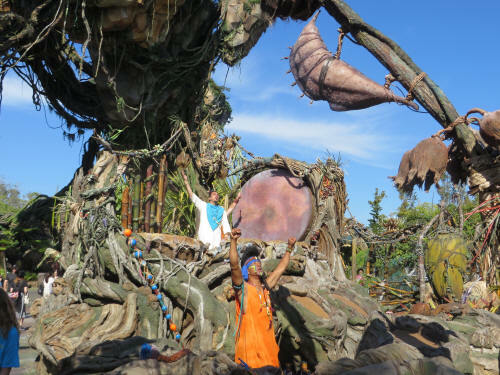 We arrived in Pandora a few minutes early for our FastPasses so we wandered and took a few pictures, then listened to the drummers as they summoned a banshee. 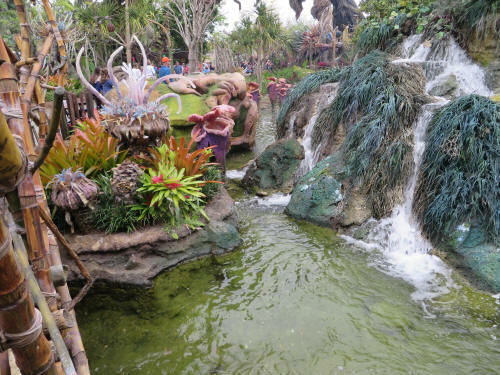 Then it was time to sail the Na’vi River. It was my second time and my opinion was the same as the first time through, it was beautiful but there is no way I’d stand in line for an hour! 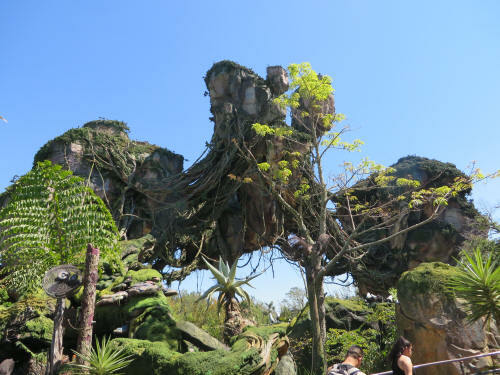 We wandered up the new trail, past the Lion King Theatre and the standby line for Avatar Flight of Passage stretched the entire way . 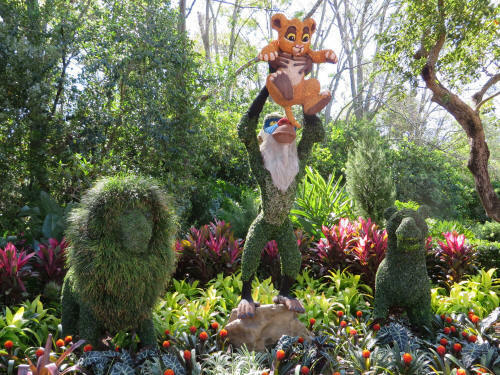 . . all the way to the Lion King Theatre. 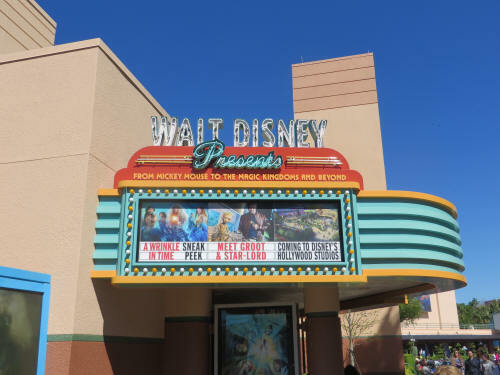 When I asked the cast member holding the ‘End of Line’ sign how long the wait was from that point he replied, “Three hours.” I think he was being optimistic . . . I suspect that those people would be waiting more than four hours! It’s an amazing ride, but no ride is worth that kind of wait! 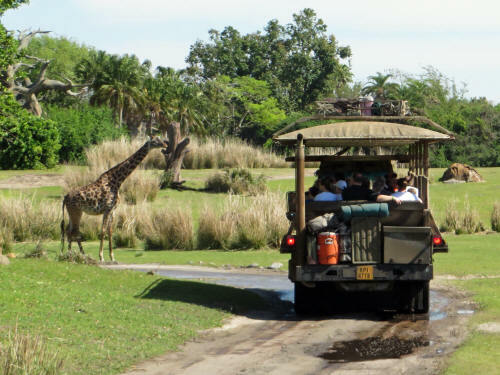 The Kilimanjaro Safari ride was quite different than usual. 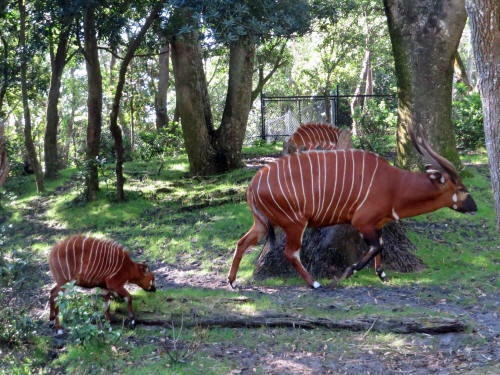 . . the first animals we spotted, the Bongos and the Greater Kudus which are normally in the background and hard to spot, were front and centre. The Bongos were just a few feet from the road and we had to stop and wait while the Greater Kudus crossed the road in front of us. 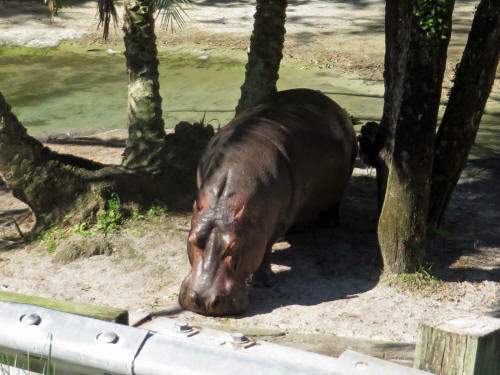 Several hippos were out of the water and walking around. 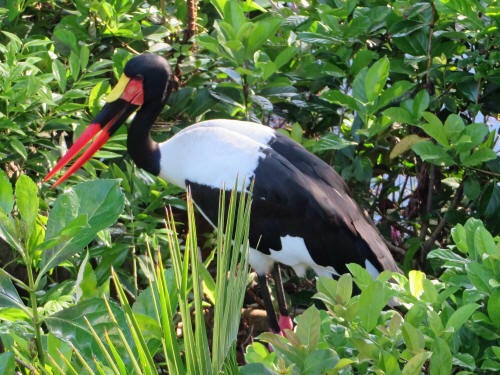 Here’s photographic proof that they don’t wear tutus in the wild! 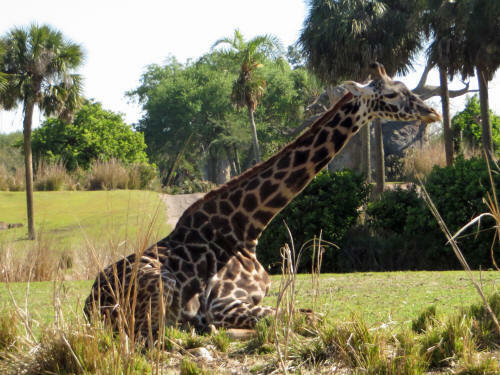 There were a few giraffe roaming again and for the second time we saw one sitting down. Baby Stella was out with her Momma! 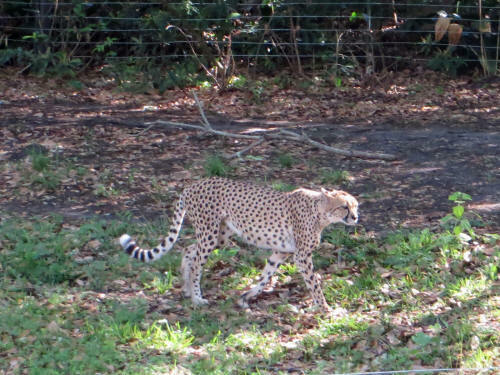 We didn’t have a clear view of the lions but one of the cheetahs was parading in full view! So, while we didn’t see some of the critters we normally see, several of the ones that are very hard to spot were right out in the open! 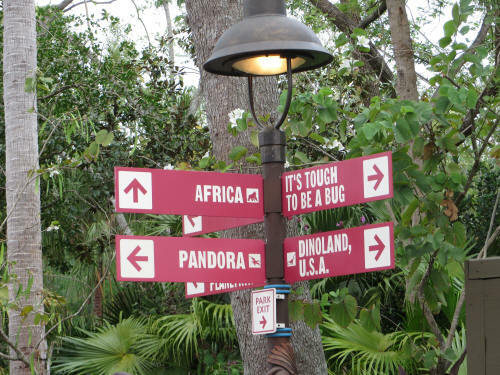 After our safari we made a dash for the exit. Carol made a brief stop at Island Mercantile to pick up some newly released pins while I carried on to the car. She arrived in the parking lot just a few minutes behind me and we were home with the dogs by noon. Carol spotted something new on the table beside the trailer; it was a cute fridge magnet with a picture of Musket Mickey. Bama Ed from the DISBoards camping group had dropped it off for us. Gee, this is a friendly place! Thanks Ed! After we had lunch at the picnic table we gave the dogs a nice long walk along the canal. No otters - no turtles! 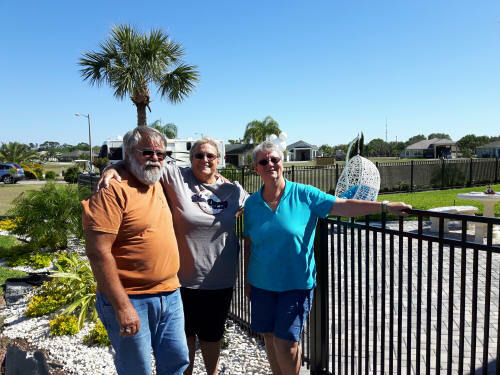 We left at 1:15 and headed west to Polk City, about 30 miles away, to visit our friends Al & Jane in their new RV resort at Mount Olive Shores North. 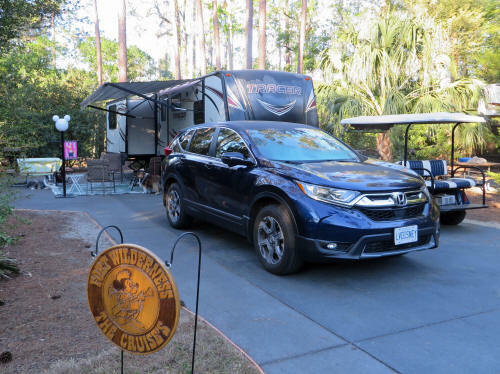 It’s a very nice development, offering everything from a simple empty RV site to a large luxury home with a ‘port’ to park your Class A motor home. Al & Jane have a large site with a pad for the coach, a large patio, a fenced area for their three cocker spaniels and a casetta which houses a washer and dryer, a shower and toilet and a large open area where they can store their golf cart when they head home to Missouri for the summer. 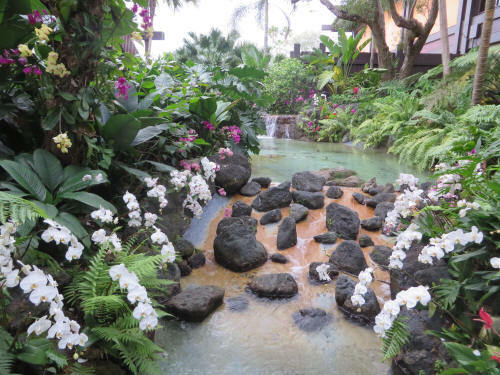 We sat on the patio chatting for over an hour, then hopped on the golf cart to tour around the resort checking out the two recreation halls, two pools, dog park and many large and luxurious homes. It’s a beautiful place! Before we knew it the time had come to head home. 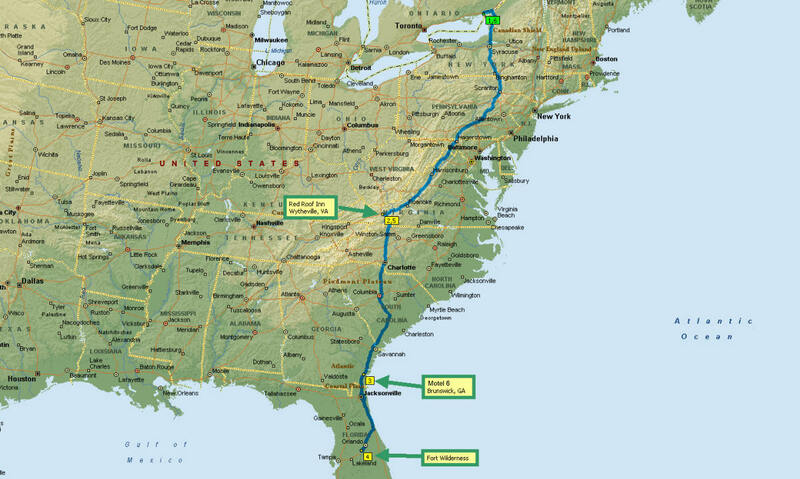 Al drew us up a map showing how to get home without using I-4. The Interstate becomes a parking lot at that time of afternoon and we were thankful to have Al’s map. We were home with the puppies at 5:15. After they were fed we loaded all three on the golf cart for a trip to the park. They had been cooped up all day were overdue for some exercise. 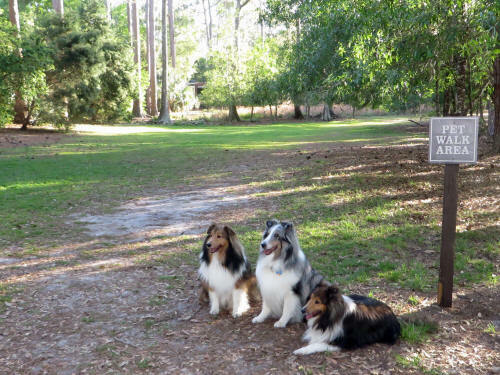 There were several other dogs there for Jak to sniff and play with while Jake and Blue chased their ball. At 6:30 we left in search of dinner for ourselves. The search took us to Olive Garden on SR535 at Apopka Vineland Road. 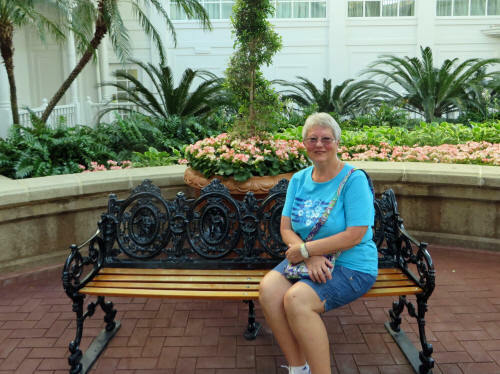 Carol had thoughts of a stop at Disney Springs after dinner, but once the meal was finished we were both too full and too tired to shop. We went home to the dogs and settled in for a quiet night! We had absolutely no agenda today and it took the entire day to get it done! It was too chilly to sit outside with our coffee in the morning, so we savoured it at the kitchen table. We could still hear the birds and the boat whistles through the open window. When we took the dogs for their walk along the canal there were three curious deer watching us. Two of them crashed off through the brush and Jake heard them. When the third one joined the stampede Jake wanted to give chase, but he had no idea where they were; we were lucky he came right back when we called him! By 8:30 it had warmed up a bit so I headed out, with a jacket on, to enjoy the splendour of our ‘natural’ Florida habitat. 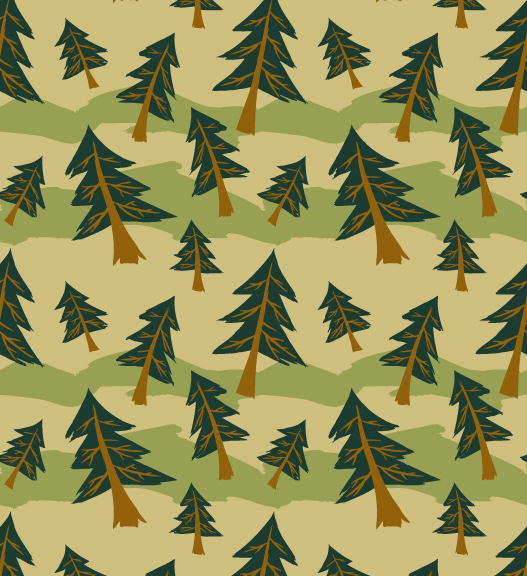 This is what our campsite looked like this morning. This is what I saw when I looked up - brilliant blue and not a cloud in sight! About 9:00 a.m. we rode the golf cart to Pioneer Hall We couldn’t believe we’d been here a week and a half and not had breakfast at Trail’s End. It was all delicious, as usual. Even Carol, who never eats breakfast, had a generous helping! To walk off our big breakfast we walked over to the horse barns and spent a few minutes poking around. 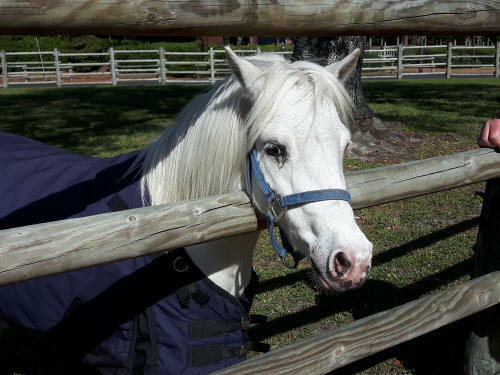 One of Cinderella’s ponies, Polly, was running round and round in one of the paddocks. She was full of energy, really frisky. 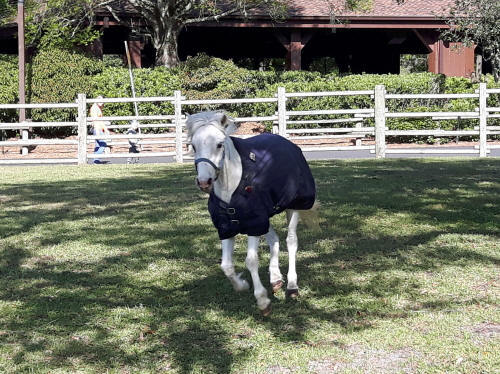 One of the cast members caring for the horses told us that Polly really likes the cool weather and is always full of energy when it gets chilly! 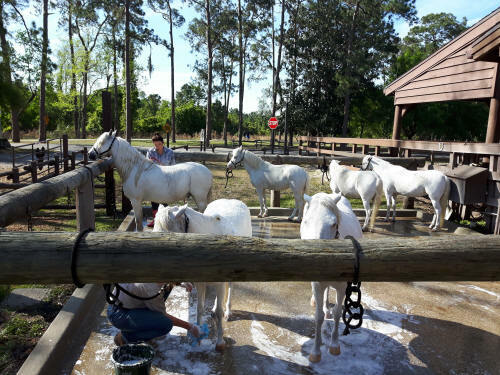 Some of Cindy’s other ponies were taking a group shower. They were getting prettied up for a wedding they were performing at later in the day at Disney’s Wedding Pavilion. 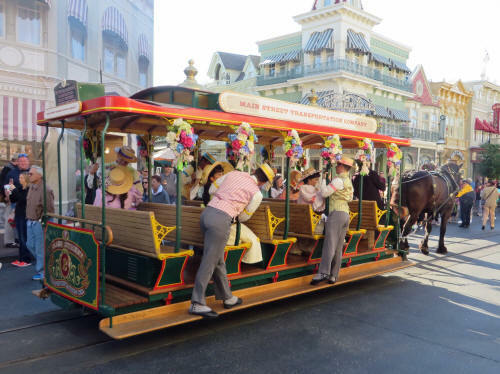 Disney has sixteen white ponies, enough for two teams of eight to pull Cinderella’s Carriage. 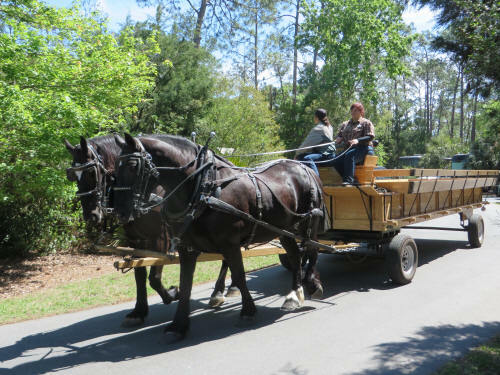 Next time you see the ponies in the parade, clad in all that fancy harness and tack - remember this picture. This is what they look like in their birthday suits! We were back home by 10:45 and spent a few minutes with the dogs before heading off to Disney Springs. 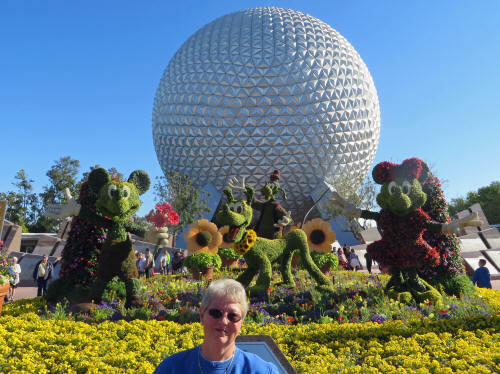 There was a new Passholder Pin released today and Carol had to have a couple of them! I pulled into the former bus area at Marketplace while she ran to The Pin Store. She was back in just a few minutes, empty-handed. 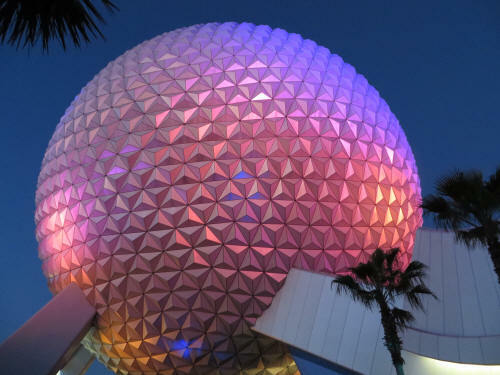 The pins were only available at EPCOT. We carried on to JC Penny where I picked up a half-dozen shirts. I dribble a lot when I eat and that’s hard on shirts! On the way back to Fort Wilderness we stopped at a Publix supermarket where Carol picked up a few groceries we’ll be taking home with us. 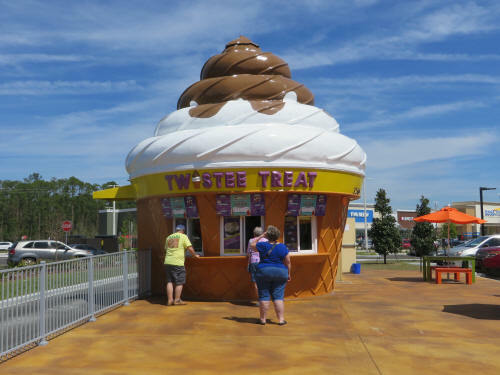 Out in the parking lot, not far from Publix, was a Twistee Treat store. We thought we’d give them a try. Carol had a cone, I had a pineapple shake. They were both delicious! We’ve been here so long that we’re getting confused about what day it is. Today seemed like Saturday to both of us and Carol thought that we were having dinner at Teppan Edo in Japan. 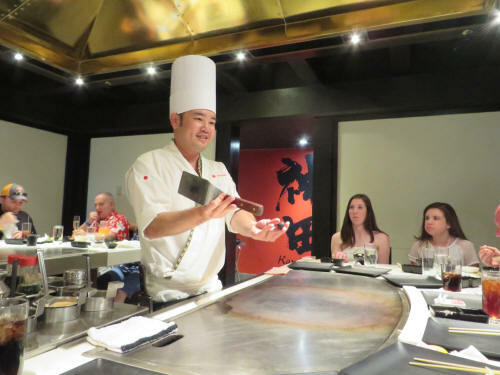 “Nope,” I said, “That’s tomorrow.” While we were eating our ice cream Carol used the Disney android app to change our Saturday night dinner at Teppan Edo to a Friday night dinner. I’m not sure that will straighten the days out, but it might help! The bed of a railroad which used to run behind our campsite. We took the dogs to the off-leash park and they had a nice long run before we settled down for a short nap. Carol fed the dogs a bit early and we walked them along the canal behind our campsite. 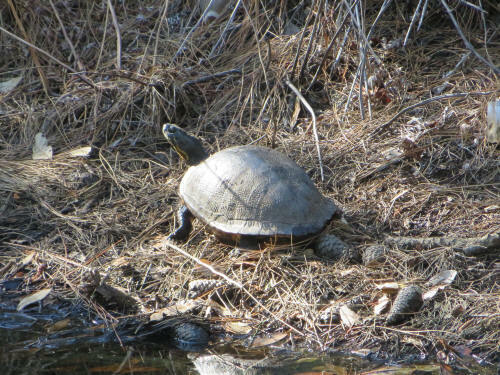 One of three turtles we saw this morning. The dog walk area behind our campsite. 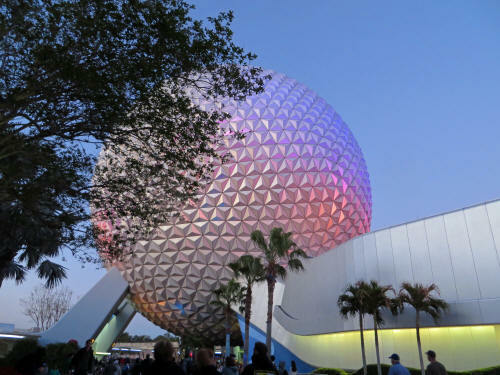 We hopped in the car and headed to EPCOT shortly after 5:00. 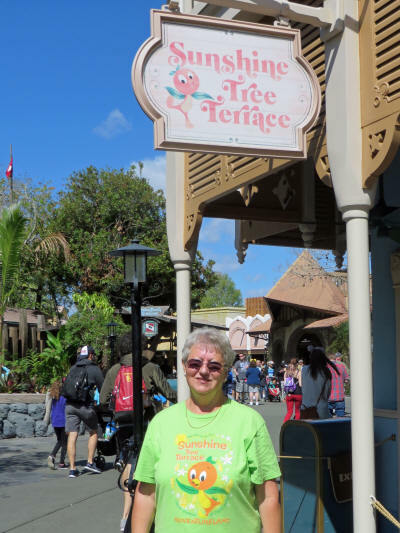 Our first stop was at Pin Central where Carol picked up those newly released pins, then we caught the Friendship boat from Canada to Morocco and walked to Japan. We arrived at 5:55, just in time for our reservation and were seated promptly with two other families, one from Texas and the other from Atlanta Georgia. We had an entertaining chef and a tasty dinner. 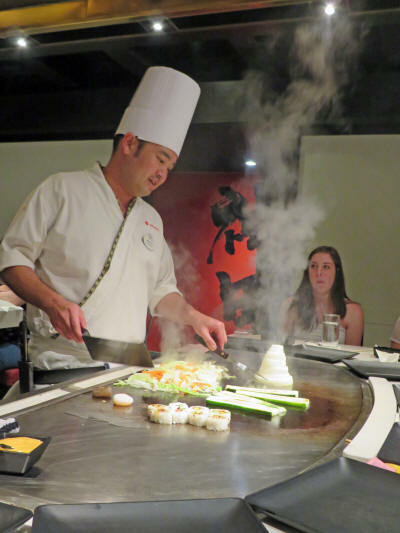 Teppan Edo is one of our favourites! 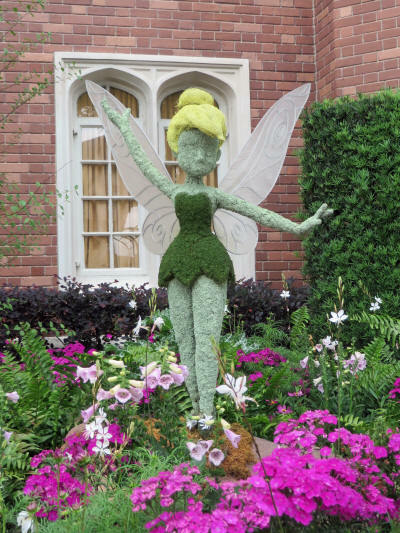 After dinner we strolled slowly toward the exit, checking out the Flower & Garden displays and the topiaries. We had just crossed the bridge near the International Gateway when a young woman stopped us and said hello. Both Carol and I were surprised and neither of us recognized her. "I'm Brinn Card." she said. It was one of those OMG moments. Brinn is the daughter of our friends Dave and Kristen from Upstate New York. The last time we saw her she was a little girl, now she is a young woman. We chatted for a couple of minutes then Brinn dashed off to catch the group of friends she's travelling with. 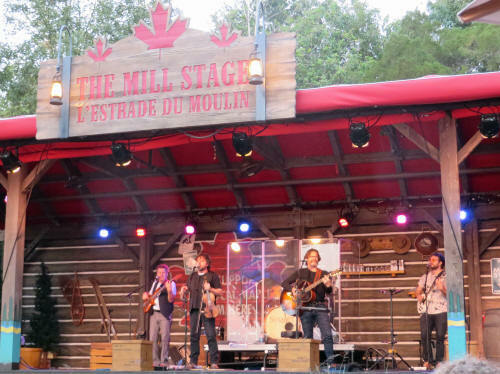 We stopped briefly in Canada to listen to the musical group, Suroit, from Les-Iles-de-la-Madeleine, a couple of tiny specks of land in the St. Lawrence River. They were quite entertaining. We were back home with the puppies about 8:20, in plenty of time to protect them from the 8:55 fireworks at the Magic Kingdom. I heard the coffee maker gurgling at about 6:30 and promptly fell back to sleep. At least I think it was the coffee maker . . . Carol sometimes gurgles a little bit when she sleeps! All three dogs ate a hearty breakfast and after we walked them they joined Carol and I on the patio. We sat for over an hour, sipping coffee, and barely spoke. It was wonderful watching the cardinals fluttering in the shrubbery beside our campsite, listening to the birds and the boat whistles. Jake chased a squirrel and a bunny; once you point the critters out to him he’s not a bad huntin’ dog! By 9:00 we were both showered and ready for the day. Carol hopped in the car shortly after 9:00 and headed off to the Holiday Inn for a pin trading event. I continued to sit outside, reading my book. The dogs were content to just curl up and snooze in the shade. Just a few minutes after Carol left Rusty and Barbara from Jacksonville showed up to pick up the Mickey Mouse lamp post they had bought. They were supposed to come on Tuesday but I guess they were anxious to get it so they asked if they could come early. 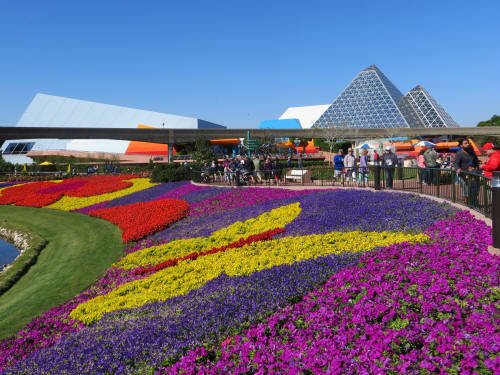 It also gave them a chance to spend a day at EPCOT - how could I say no to that? We’ll miss it though, our campsite will seem dim and gloomy for the next few nights! 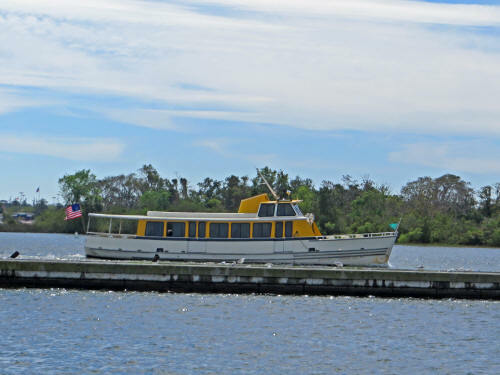 After Rusty and Barbara left on their way to the park I continued to read my book and enjoy the serenity of a quiet day at Fort Wilderness. Occasionally people walked by with their dogs and said hello. Folks riding by in golf carts said good morning. This is such a friendly, homey place! Just after 11:00 Michael from Mississippi dropped in to say hello. 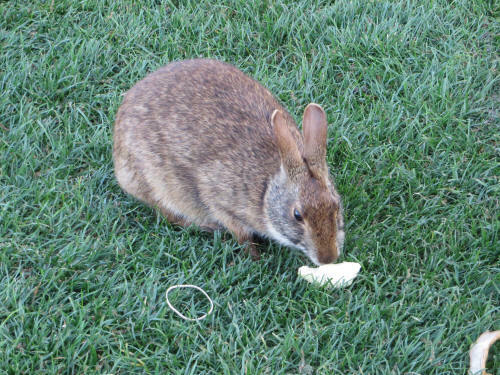 He was walking around the campground snapping pictures while his family slept in all morning. Michael and I were sitting yakking when Carol drove up about 11:30. Just before noon Michael headed back to his campsite to grill up some steaks for his clan; Carol and I had sandwiches out on the patio. It had been a heavenly morning for both of us, she was happy with her pin trades! After lunch Carol tidied up the trailer a bit while I continued my slothful existence outside in a lawn chair. The dogs started giving us the evil-eye about 1:45 so we loaded them on the golf cart and they had a good run at the dog park. Jak doesn’t have any interest in chasing the ball like Blue and Jake do; he spends his time at the park sniffing around the perimeter. Jak loves to run and play with other dogs while Blue and Jake are quite timid when strange dogs are around. When it’s time to go to the park though, it’s Jak who is most insistent. He’s the one who does the most coaxing. When we got home from the park the temperature was in the 80’s. We sat outside for a few minutes but it was difficult to find shade under the awning. Soon the sandman started summoning . . . all five of us headed inside to nap in air conditioned comfort! I woke up first and headed back outside with the dogs. About 4:00 p.m. Mamma Bear emerged from her cave and joined the rest of us. We fed the puppies about a half hour early and took them for a walk along the canal. We left for Disney Springs at 5:15, on our way to dinner at The Boathouse. The signs for the Lime Garage all read ‘FULL’ but we went in anyway. We found a spot on the second floor, very close to the escalator . . . very convenient. 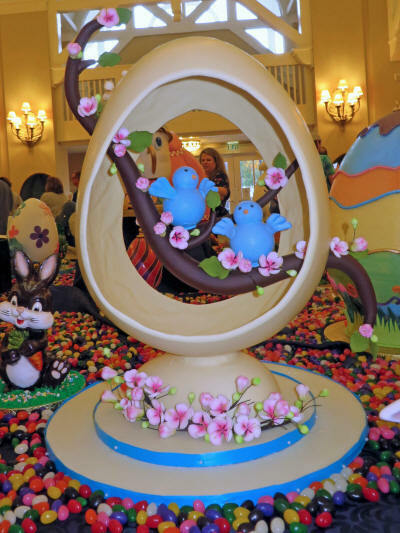 Things were hopping at Raglan Road. They had a special St. Patrick’s Day Party going on, with special bands, dancers and of course drinks! Part of the concourse beside the restaurant was cordoned off to accommodate party patrons, so we had to detour on our way to The Boathouse. Carol checked us in for dinner a few minutes early and we were seated immediately. 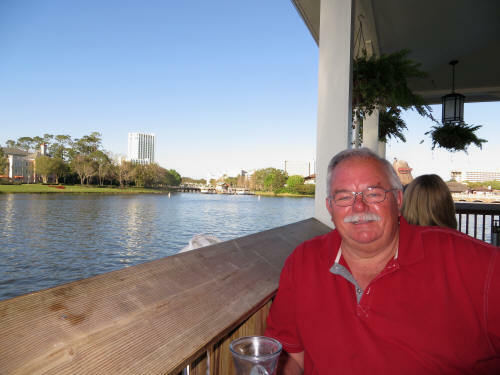 We had outdoor seating with a view that looked across Lake Buena Vista toward Saratoga Springs Resort. 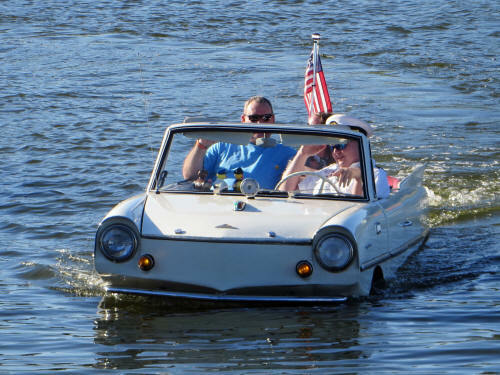 As we enjoyed dinner we watched the amphicars sail past; they looked almost too heavy to float but it sure looked like fun! Dinner was great and when it was done we were looking forward to sharing the wonderful apple crisp they serve. We were crestfallen when our server told us they were out of apple crisp! 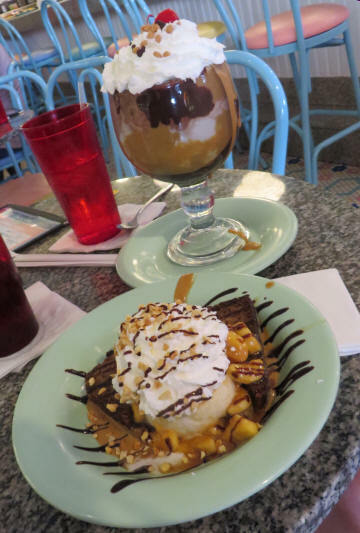 We decided to head to Ghirardelli where we could drown our sorrow with ice cream sundaes! We took a stroll along the dock as we left the restaurant. 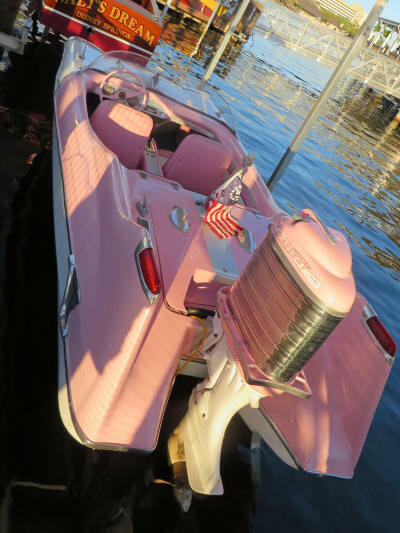 The classic old boats on display are amazing. 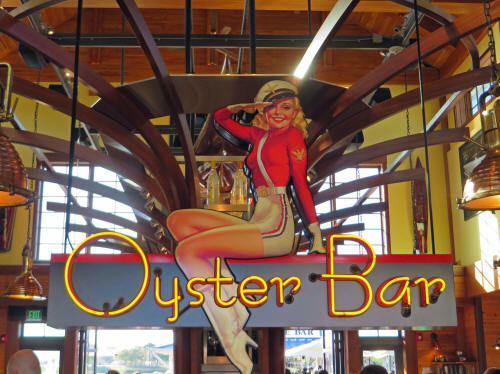 Don't forget to check them out when you're at the boathouse! 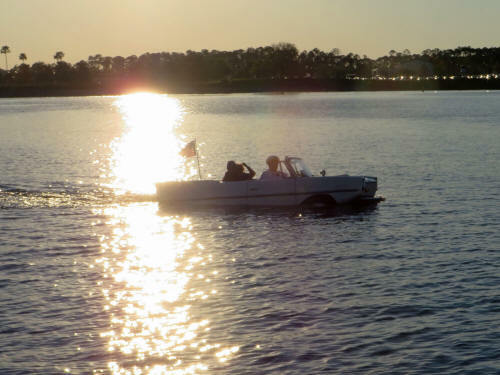 The sun was glistening off an amphicar as we left the dock. 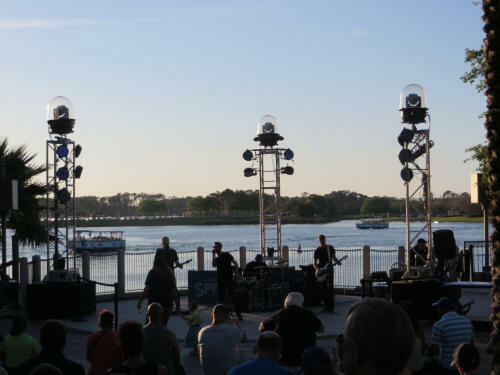 On our way to Marketplace for ice cream we paused briefly to listen to a band that was playing right next door to The Boathouse. When we arrived they were about half way through the last number in their set - so we weren’t long heading on to Ghirardelli’s. The sundaes were excellent! Carol did a quick browse through the pin store while I got some cash at a nearby ATM and we headed for home. 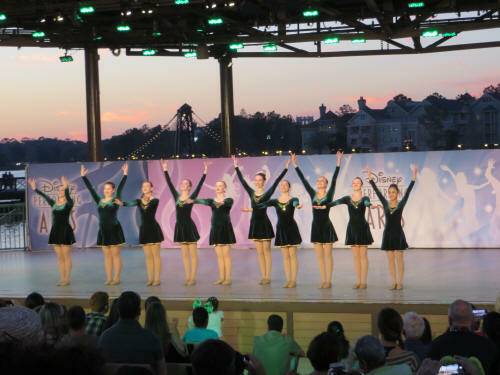 As we walked to the parking lot a group of Irish dancers was performing in the amphitheatre. We saw about ten seconds of dancing. By the time I got the camera out to take a picture the girls were taking their bows. Our timing just wasn’t good tonight! We were back home at 8:15 and enjoyed a quiet night. Carol had a plan this morning so there was no time to waste. We were up by 7:00 a.m. and hustled through our normal morning routine. By 8:45 we were in the car and on our way to Animal Kingdom. 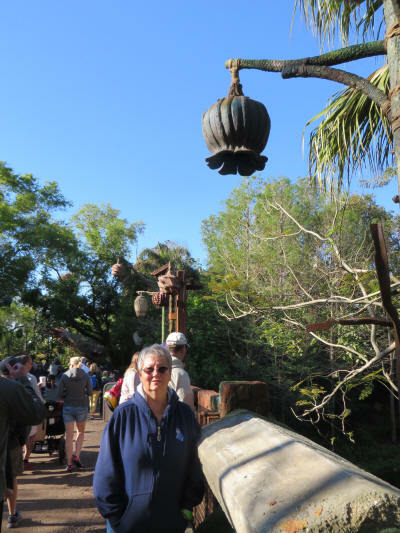 We had a 10:20 - 11:20 FastPass for Avatar Flight of Passage and Carol wanted to walk both the Maharajah Jungle Trek and the Gorilla Falls Exploration Trail before we rode Avatar. We had to wait for this girl to cross the road this morning. 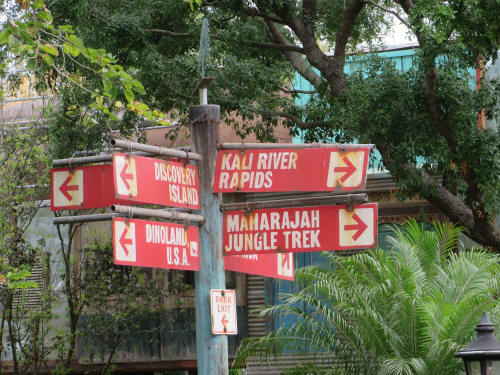 Once we arrived at the park we hustled through the Oasis and Discovery Island to Asia and started the Maharajah Trek at 9:25. 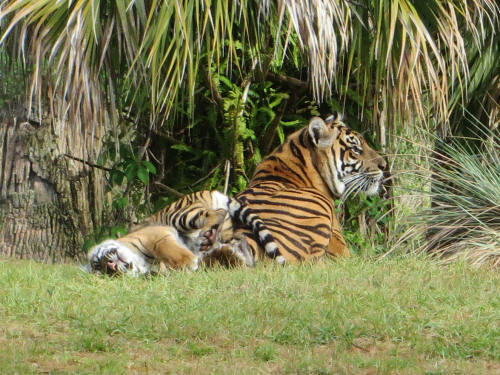 It has been several years since we’ve walked the Royal Forest in Anandapur and Carol was anxious to see the new tiger cubs. They’re seven months old, a boy and a girl. 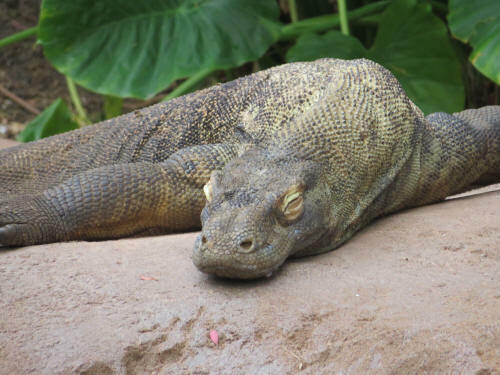 There were plenty of animals to see before we got to the tigers; a Komodo Dragon was stretched out on a rock sunning himself, sound asleep. 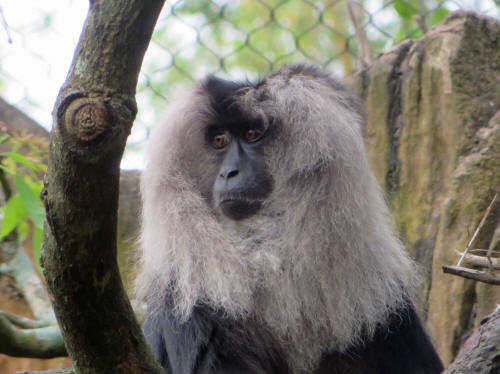 A Lion-Tailed Macaque posed beautifully for me. 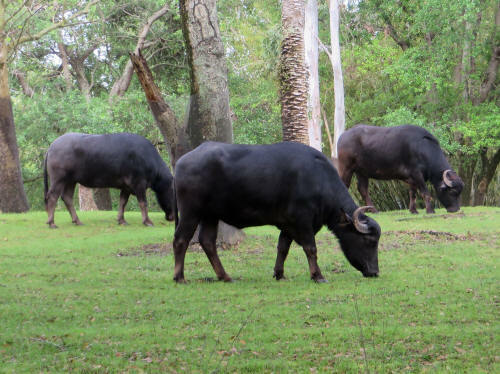 Another Asian species, these are water buffalo. A lively pair of cranes entertained us. 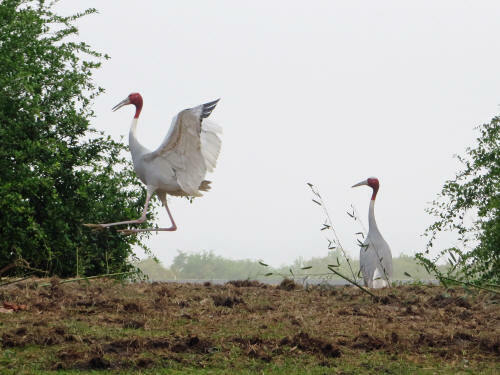 These Sarus Cranes performed a very elaborate mating dance. They soon disappeared over the hill so I think the dance had a happy ending! 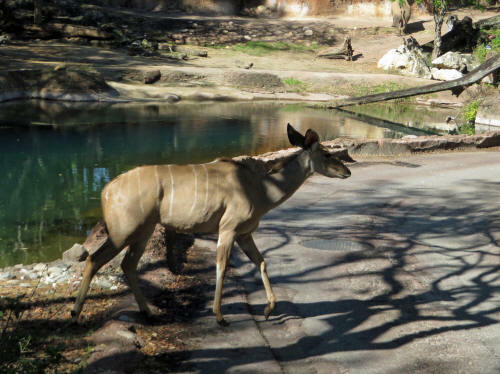 The blackbuck antelopes are one of the fastest species in the world, they can run up to 50 miles per hour. 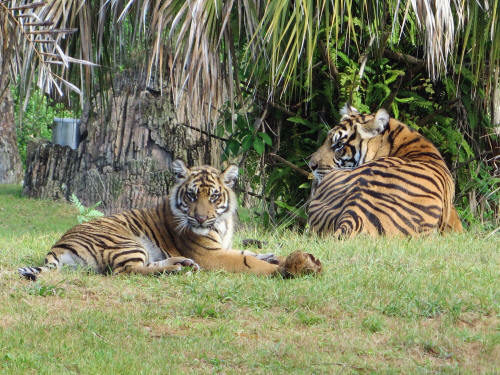 Then came the tigers. The female cub was just full of energy, we didn’t see much of the young male. 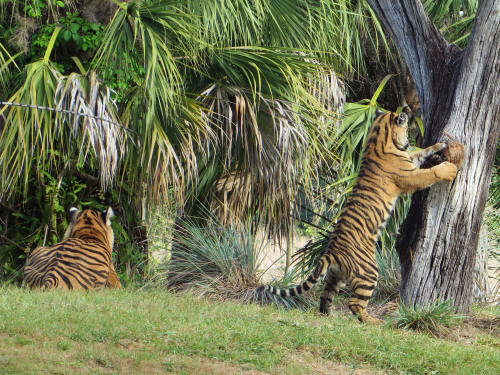 Carol was mesmerized as the little one frolicked, rolling and playing with a ball of twine the keepers had placed in a tree for ‘enrichment’. I’m pretty sure that little girl tiger felt enriched! 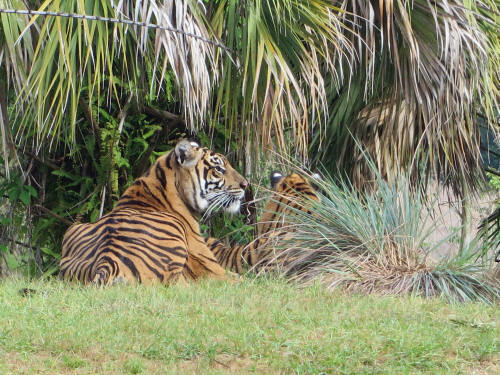 There were plenty of other animals to see so eventually Carol dragged herself away from the tigers. 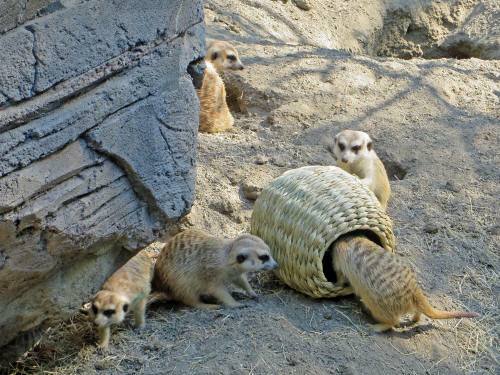 There's nothing cuter than a mob of meerkats! 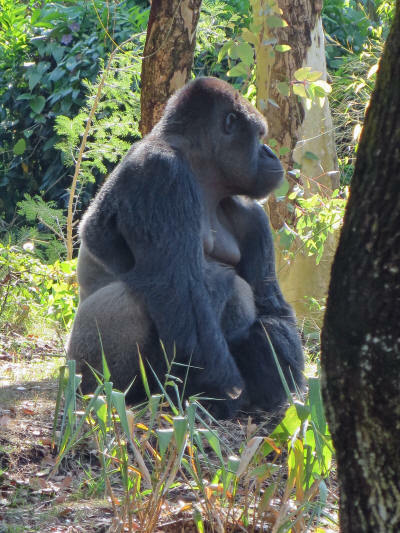 There were plenty of lowland gorillas visible once we started the Gorilla Falls Exploration Trail. 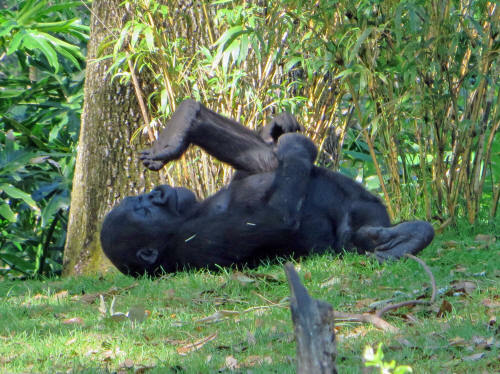 There was even a baby gorilla there to entertain us! before giving it's left foot a very close inspection! I was huffing puffing and limping, but we got there with two minutes to spare! What an amazing ride. 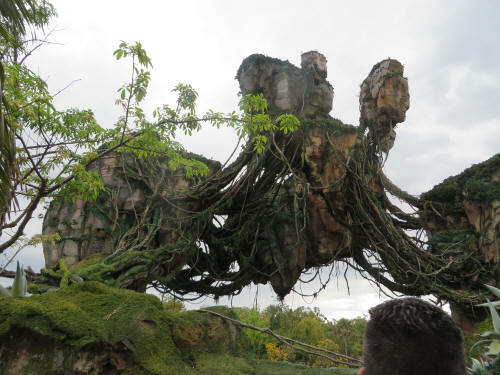 The story line, the graphics, the motion and the 3D Virtual Reality technology really do make it seem as though you are riding on the back of a banshee through Pandora. I still find it breathtaking, even on my fifth ride! 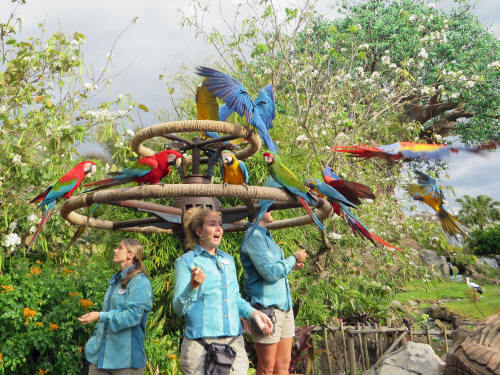 It was over 80 by the time we walked out of Pandora at 11:50; Carol said, “Let’s have a Fruits of Mo'ara Bar.” She was pointing at a sign showing some frozen fruit bars with layers of raspberry, lemon and strawberry. They were delicious! We were back home with the dogs at 12:15. Carol made tuna sandwiches for lunch and before long we took the dogs over to the off leash park. We didn’t let them run as long as they usually do, it was too hot for that. We sat out on the patio with the puppies for a while but it wasn’t long before the heat pushed us inside. We spent the next few hours fiddling at our computers and napping. By 5:30 we had fed and walked the dogs so it was time to head off for dinner. 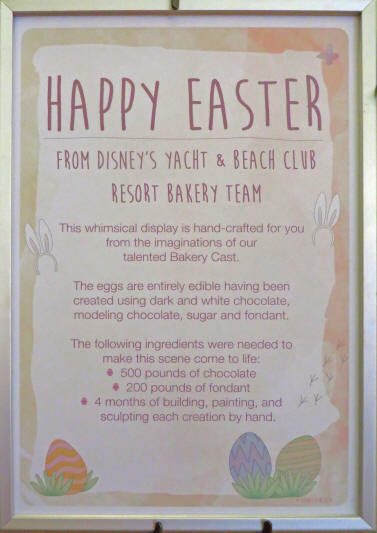 We had reservations at the Grand Floridian Café. We arrived a few minutes early for our 6:20 reservation and we were promptly seated. The onion soup there is delicious so we each ordered one. Carol followed with Miso Glazed Salmon and I had the Café Sandwich. By the time we finished our entrees we were much to full for dessert. It was still hot when we got home at 7:30 so we quickly changed into our bathing suits and took the golf cart to the pool. It was the first night that we’ve had good pool weather and it was nice to take advantage of it. The hot tub was soothing and the pool was refreshing! We felt much better when we got back to the dogs at about 8:15 and settled in front of the television. 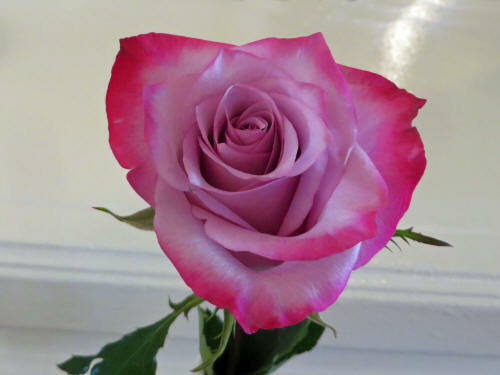 This beautiful rose was on our table at the Grand Floridian Café. Jak woke us up just before 7:00 a.m. and we had another ‘get ready quick’ morning. We didn’t really rush, but we didn’t sit outside with coffee either. By 8:45 we were on the road, destination Animal Kingdom. 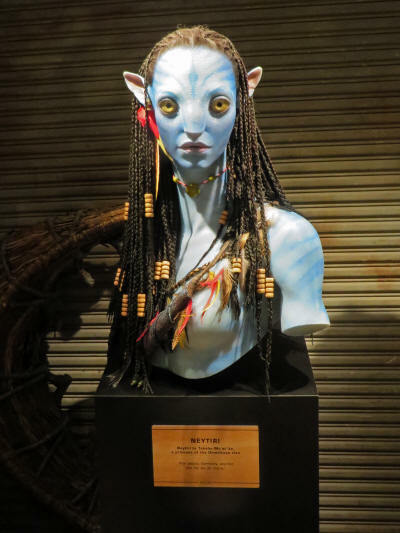 We had a single FastPass for Avatar Flight of Passage between 9:35 and 10:35 and Carol decided that she needed to do some shopping while I took the oh-so-popular banshee ride. 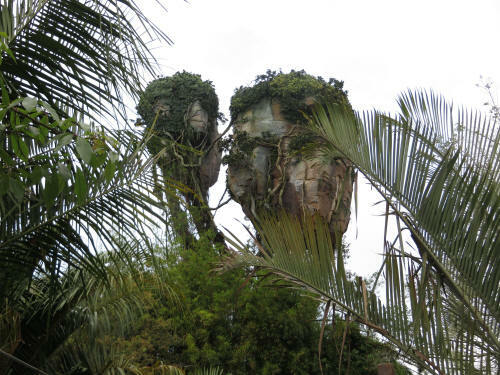 We arrived at the park just after 9:00 and walked through The Oasis to Discovery Island. 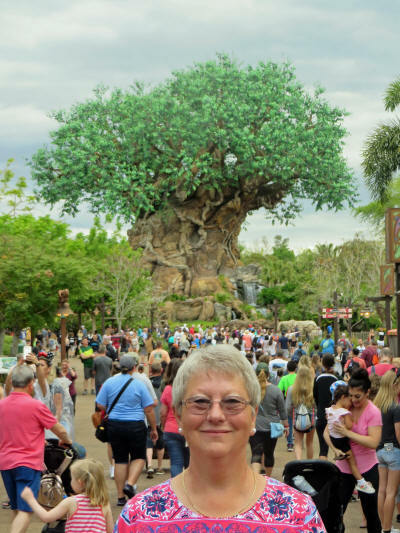 I took a picture of Carol and the Tree of Life from the top of the hill. There was a very short line at the PhotoPass spot in front of the Tree of Life so we stopped for a picture with the frame. 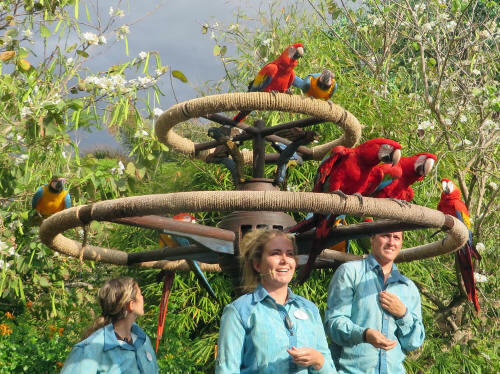 As we walked away from the PhotoPass area Carol noticed some cast members setting up stools under the big roost the parrots use. There was a show starting in just a couple of minutes. We found a good angle for some pictures, and as soon as we were set, the birds started arriving. Wow . . . they’re noisy when you’re up that close! This little guy was waiting before the show too! 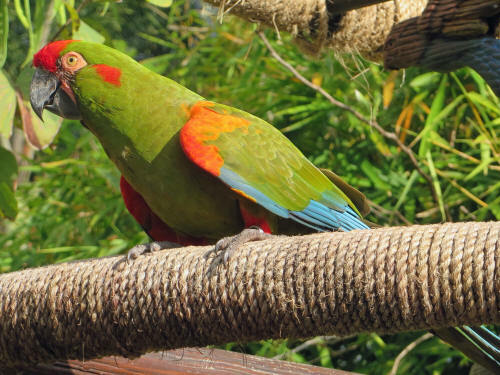 Carol spotted him in the bushes not far from us, and as soon as the cast members started handing treats to the birds the squirrel kept busy cleaning up the scraps they dropped. 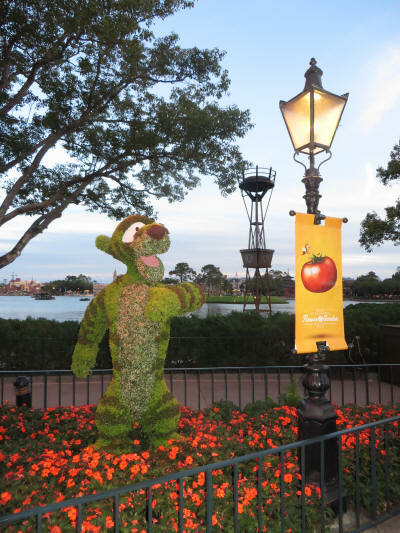 The cast members told us that he’s there for every performance. 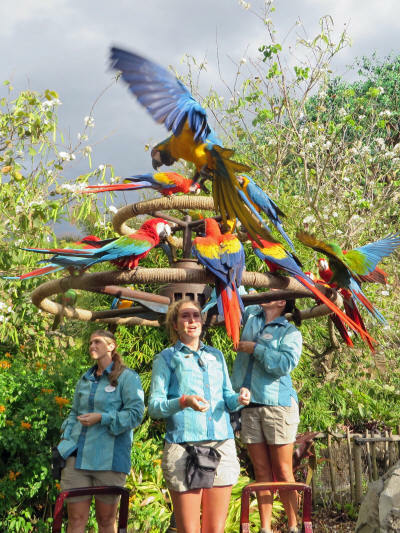 Once the birds were done Carol headed back to Harambe to poke around the shops while I headed to Pandora to ride an Ikran. I was a bit early for my FastPass so I poked around snapping a few pictures before I joined the line. 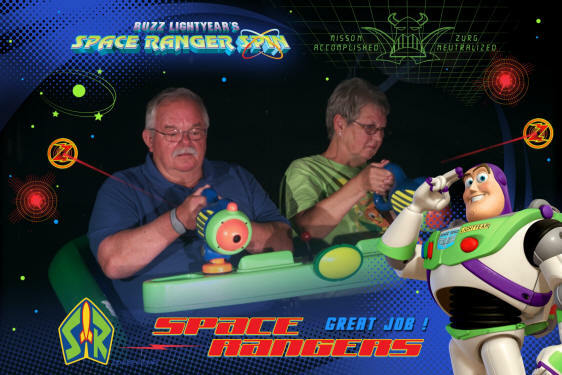 My sixth ride was just as exciting as my first. I was the furthest rider out on the right hand side and it seemed like the motion effects were stronger there than they are in the middle. 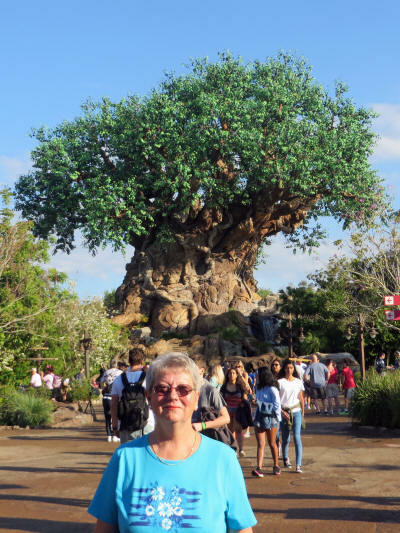 I wandered slowly back to the Tree of Life area where Carol was waiting for me in front of the Island Mercantile store. 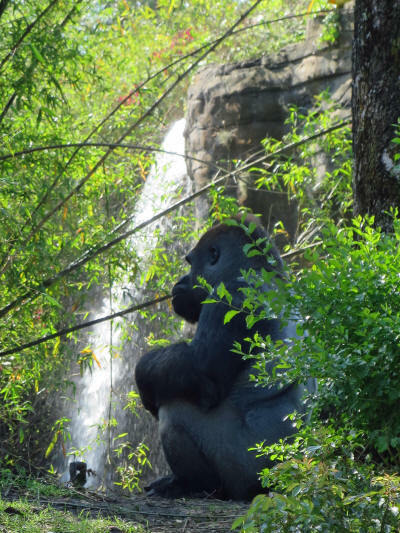 She was empty-handed; there was nothing in Harambe that caught her eye. We headed to the exit and drove off to Property Control, the store where Disney sells off all of their overstock or outdated merchandise. 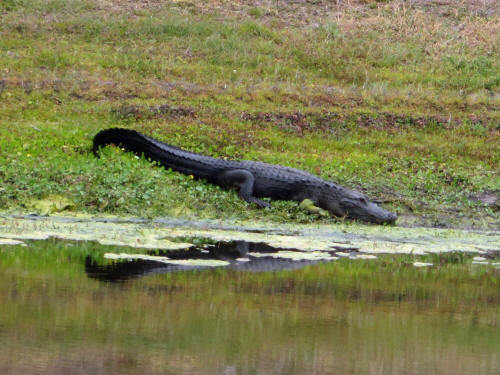 This big gator was sunning beside a pond on Western Way near Property Control. He had to be 10’ - 12’ long! We were meeting Al & Jane there and they pulled in just a few minutes after we did. Jane and Carol spent a half-hour shopping while Al and I chatted on a bench in front of the store. When the shopping spree was over both ladies emerged with a bulging bag. Al and Jane were heading off to Beaches & Cream for lunch and we talked about joining them, but we’re going there for dinner tomorrow so Chik-Fil-A won out for us. I had a chicken sandwich, Carol had chicken fingers and we each had a milk shake. Yum! Sure wish we had Chik-Fil-A in Canada! We were home with the dogs by 1:00 and had a very relaxing afternoon. We sat outside with the pups for about a half hour, then went inside to cool off a bit before taking them to the park. 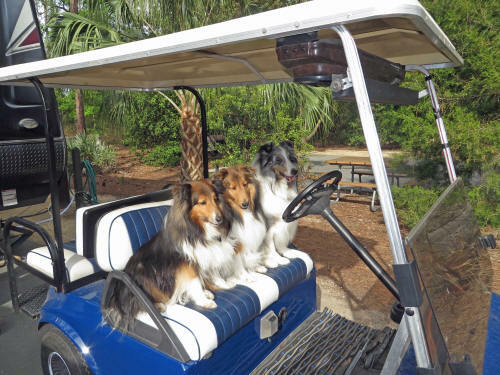 All three of them now go out and jump right up on the golf cart when we mention a trip to the park. They really look forward to their daily trip! It was very hot and humid by mid-afternoon so we didn’t run them too hard today. At 3:00 p.m. Carol was poised at her computer, intent on booking a D23 ‘Animal Kingdom 20th Anniversary’ package for our April trip to Walt Disney World. She was successful - the event was expected to sell out quickly and we didn’t want to miss the opportunity! We spent the rest of the afternoon napping and puttering. By 5:00 Jak was reminding us that it was dinner time; before feeding them Carol checked the D23 event - it was already sold out! Once the dogs had eaten we walked them along the canal before leaving for dinner just before 6:00. 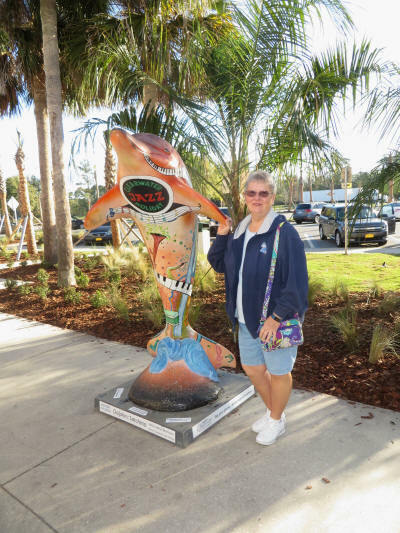 We went to Flipper’s Pizza, in the Crossroads Plaza at the end of Hotel Plaza Boulevard. Carol had been there a few weeks prior with her mother and enjoyed the pizza. It was as good tonight as it was then; we had a good experience and will no doubt go back to Flippers again! It was just starting to rain when we left the restaurant so we rushed back to let the dogs out. Once they had done their business we all sat under the awning for a few minutes listening to the sound of the gentle shower. Shortly after we moved inside the rain really started to come down. We had talked about heading to the pool again tonight, but once it began pouring down we forgot those plans and settle in front of the television. Jak didn’t sing to us this morning, but he was pacing at 6:45 a.m. That was just about the same time the coffee was done brewing, so we got up and started our day a bit early. The air conditioning had been running all night and it was much too humid to take our coffee outside, so we stayed indoors. 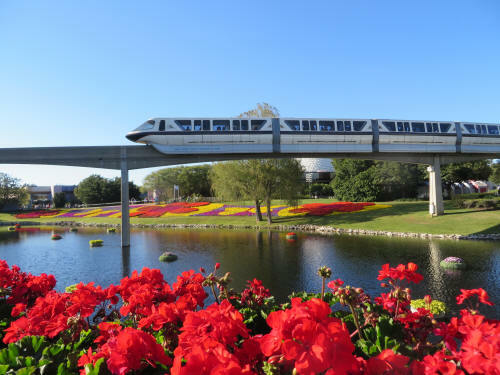 We had FastPasses for Soarin’ and there was still more for us to see at the EPCOT Flower & Garden Festival, so we were in the car and rolling by 9:00. 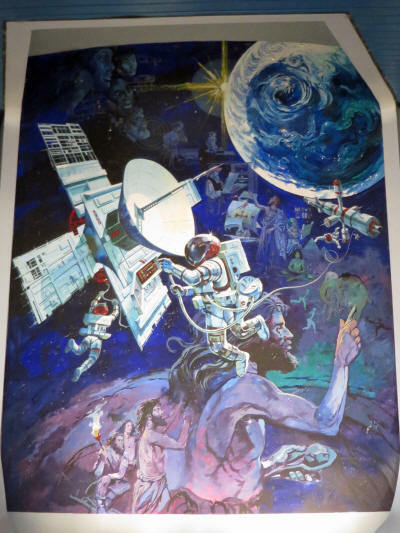 There was no line at Spaceship Earth as we walked past so we entered the queue and took a journey back to the beginning of time. 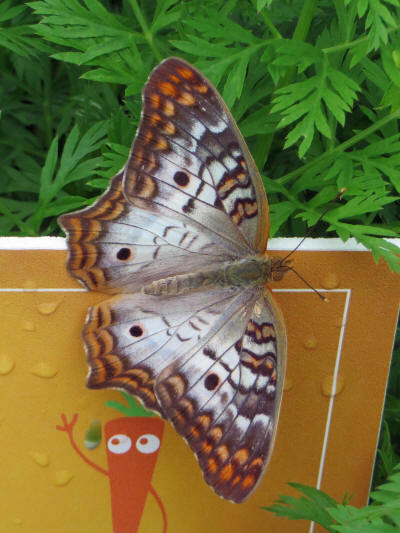 Carol made a very brief stop at Pin Central, we popped into the Annual Passholder Centre to pick up our Passholder Magnets, then went directly to the Butterfly Garden. 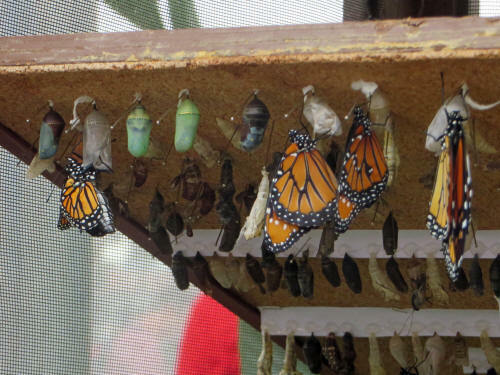 We had stopped there several times but it was always on cool days when the butterflies weren’t active. 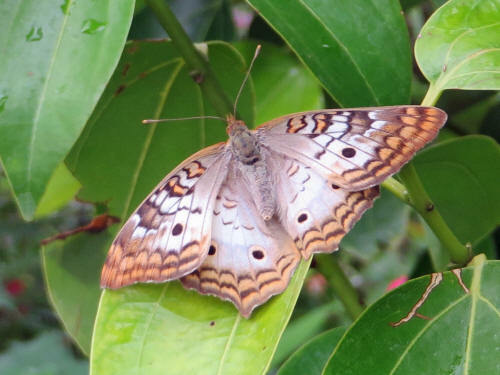 Today there were plenty of them flitting around. 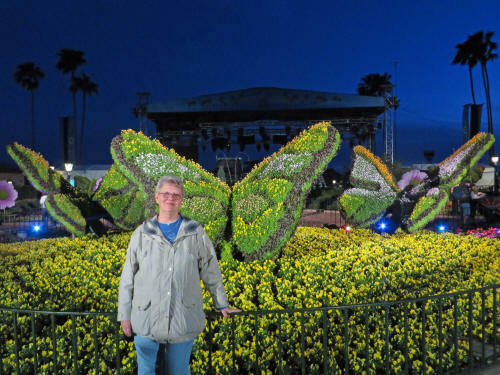 Carol likes butterflies almost as much as she likes otters! When you give her a camera and put her in the middle of a bunch flock swarm of butterflies she’s a very happy girl! 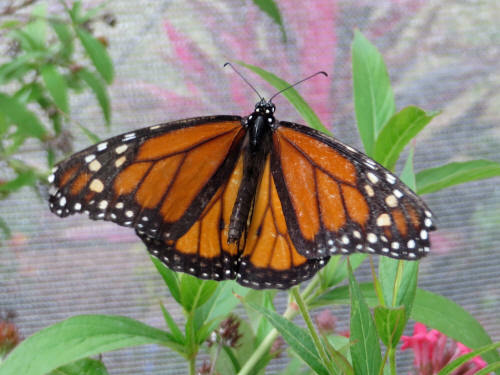 As soon as we entered the netted butterfly garden she started snapping away! 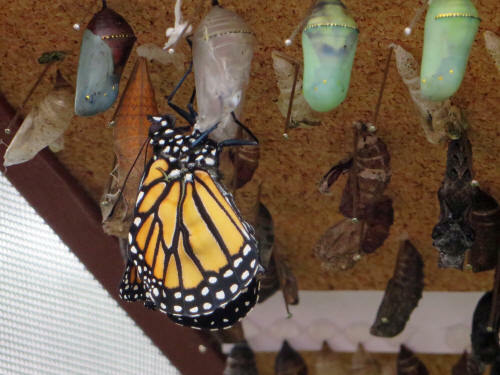 We watched the Monarch on the left pop out of his chrysalis just seconds before this picture was taken. 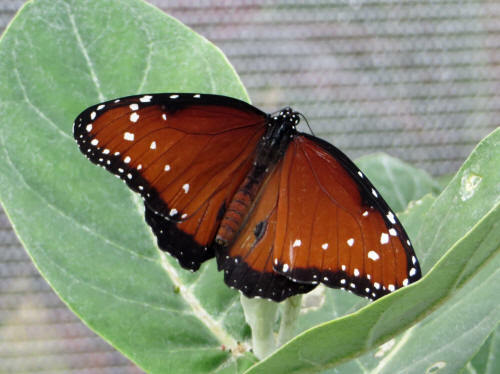 Here’s a closer shot of that newly emerged butterfly! 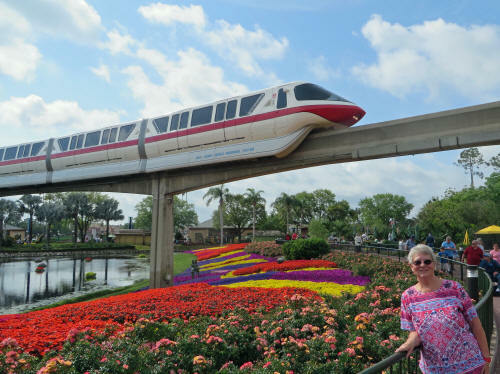 Carol managed to drag herself away from the butterflies just in time for our FastPass at Soarin’ and then we moved on to World Showcase to see some more of the Flower & Garden displays. There were a couple of photo-ops along the way. 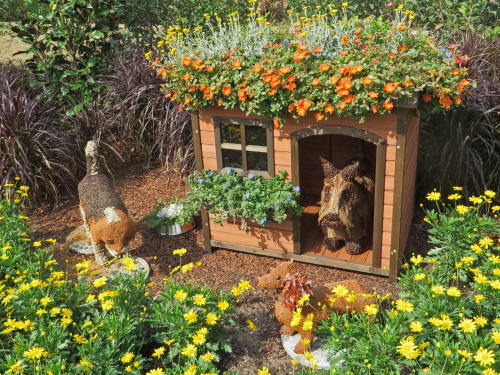 There were even topiary dogs in a garden themed dog house. 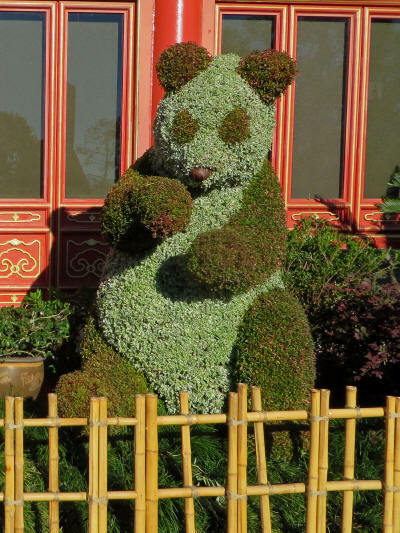 There were even some garden projects for the Do-It-Yourself crowd. 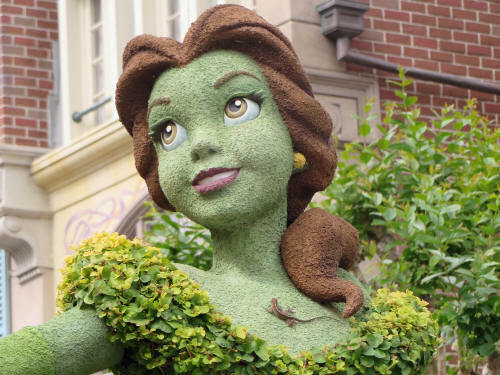 I wonder if Belle was aware of the lizard crawling around on her décolletage? We stopped in France and had a delicious lunch at Boulangerie Paitisserie les Halles. Skies were darkening and there was severe weather in the forecast for the afternoon so we turned back toward the exit to head home to the dogs. 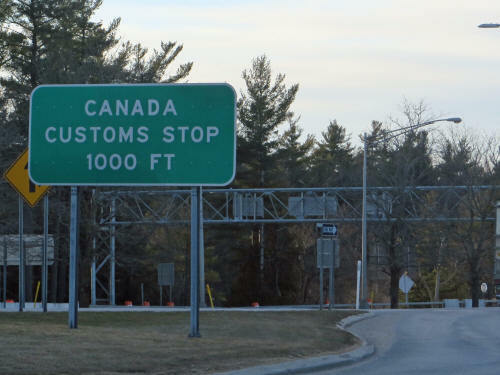 We stopped for a couple of pictures along the way, and as we approached the Port of Entry near Canada a familiar face appeared. It was our friend Curtis from Ontario. He’s here on the college program and is hoping to extend his stay another three months before he goes home. We chatted with Curtis for ten or fifteen minutes before he had to rush off to work. We headed to the exit and were home just in time to let the dogs out before the monsoon came! I pulled the plastic bins out of the storage compartments under the trailer and Carol began to pack things up for our trip home. Then the rain came. It rained, it poured! My phone chattered with an eerie tone we have never heard before - it was a tornado warning. “Take cover immediately!” it said! Yikes, we’ve never seen one of those before! We had pulled in everything we wanted to keep dry and retracted the awning to protect it from the winds, and it was good that we did. The storm was wild! We laid down and tried to nap but between the rail hammering on the roof and three dogs huffing and puffing in our faces, sleep just wouldn’t come. By 4:00 the worst of the storm had passed so I drove Carol over to the Character Outlet on Vineland Avenue. We had heard that they had some surplus inventory from Shanghai Disneyland that they were clearing out and Carol needed some trader pins. Turns out we were too late, there was very little of it left. 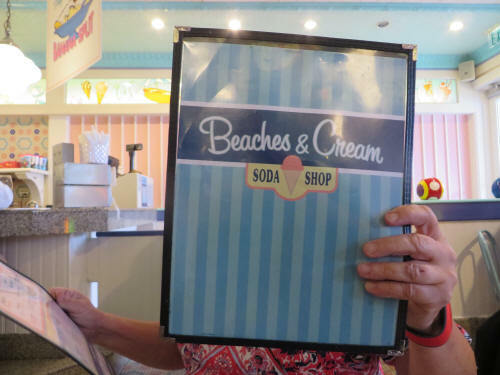 After feeding the dogs we headed off to The Beach Club for dinner at Beaches & Cream. 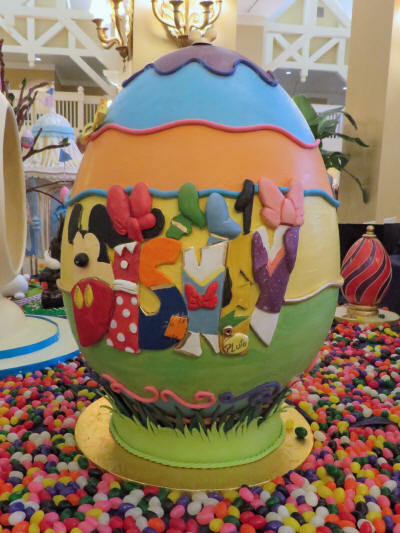 We stopped in the hotel lobby to admire the amazing Easter eggs made by Disney’s talented bakers. 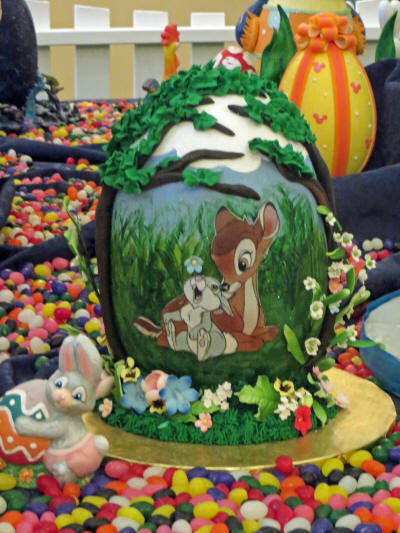 Everything pictured here is edible! Carol had a Reuben sandwich and I had a patty melt, but as you might expect the highlight was dessert. Carol ordered her favourite sundae, a ‘No Way Jose’ and I enjoyed grilled banana bread with ice cream, peanut butter and caramelized bananas. Yum! We were back home with the dogs just before dark, in plenty of time to protect them from the nightly fireworks! Our time is almost done! 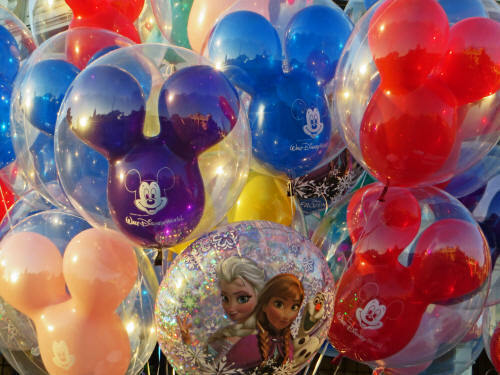 Our last day at Disney is always a bittersweet sort of thing! Jak must have sensed this; he let us sleep in until 7:30. 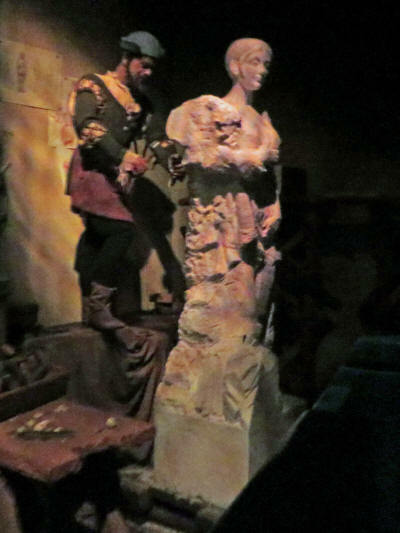 We had a 9:15 - 10:15 FastPass for Pirates of the Caribbean so we moved quickly and got away at 9:00. We had a very short wait in the cold, gusty winds on the marina dock. The storm last night cooled things off almost instantly and we were both wishing we had worn our jackets. Crowds were quite light when we got to the park. We stopped for a PhotoPass in front of the train station and the photographer rewarded us with a little bit of magic. 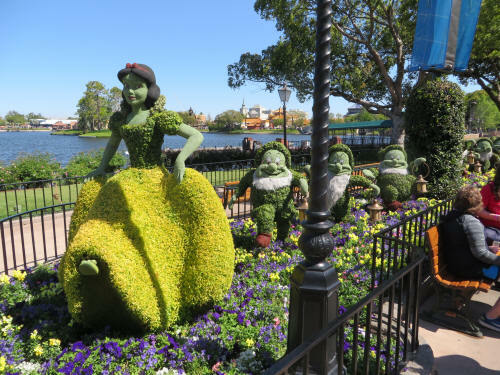 We found more magic as soon as we crossed into Town Square. There were two Easter Bunnies posing for pictures. We stopped at the Fire Hall to pick up Sorcerer cards, then headed directly to Pirates Of The Caribbean. 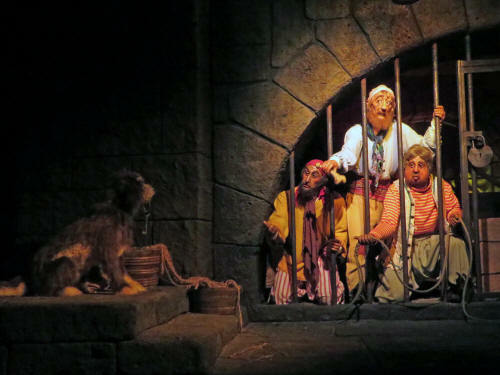 The Pirate ride reopened yesterday after a refurbishment. 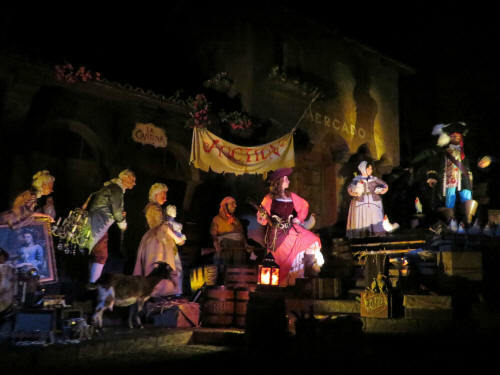 To make the ride more politically correct they removed the “Take a wench for a bride” auction scene and replaced it with an auction for chickens. Yup - chickens. 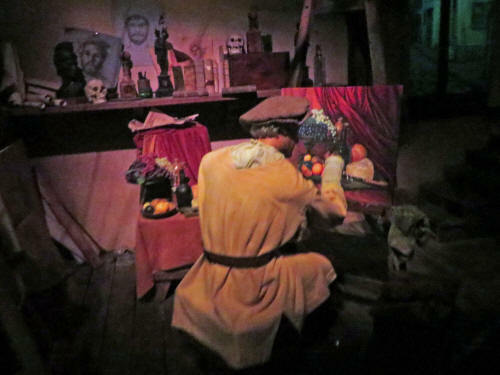 After the next refurbishment the pirates may be reciting poetry and playing chess or polo! Actually, the new scene isn’t all that bad. 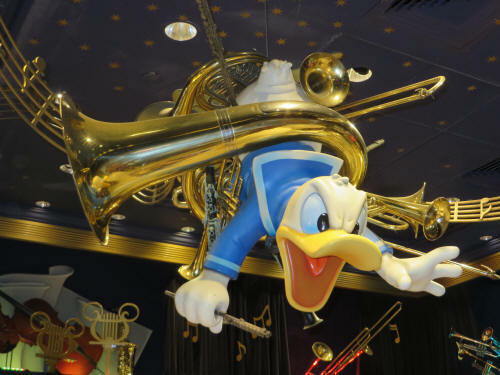 They’ve added some good audio-animatronics and brightened the lighting a bit. I’d like to see it a few more times before I pass judgment! We left Adventureland and walked through Frontierland so naturally Carol had to stop and check out the pins at Frontier Mercantile. 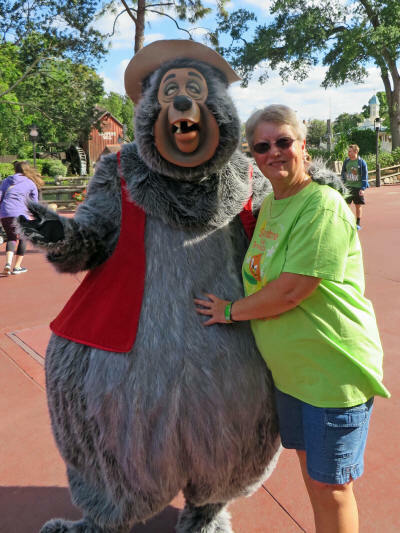 As she was approaching the store Big Al, one of the stars of the Country Bear Jamboree, stopped her to say hello. 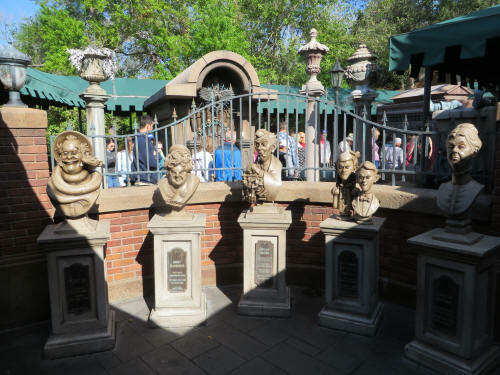 There was almost no line at the Haunted Mansion as we walked past, so we popped in for a ride with the 999 Happy Haunts. After our Doom Buggy ride a hitchhiking ghost followed us home! 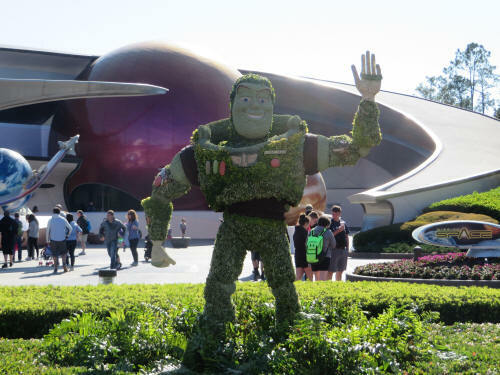 We crossed through The Hub to Tomorrowland an took a spin through Sector 9 with Buzz Lightyear. 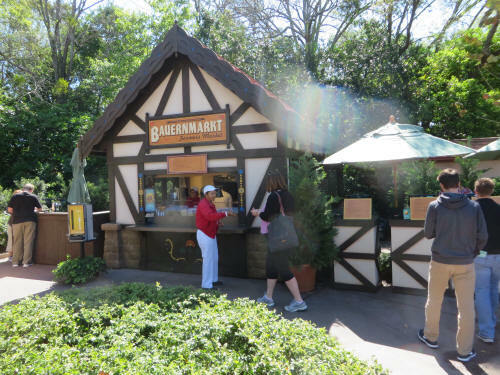 Then we hiked through The Hub again, on our way to sample some treats in Adventureland. 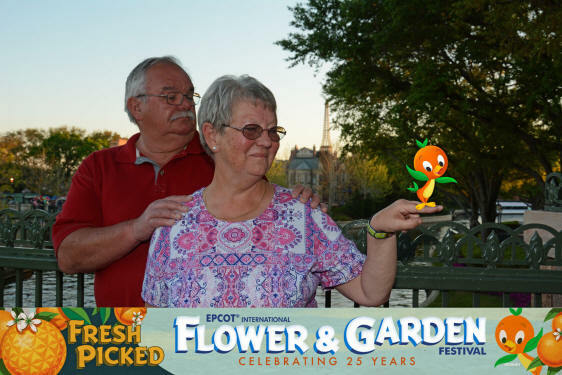 Carol was not the only person upset when The Sunshine Tree Terrace replaced the Citrus Swirl with an Orange Swirl. The outcry was so sudden and so loud that within about a week the old standby was back and the Orange Swirl was just a bitter memory! 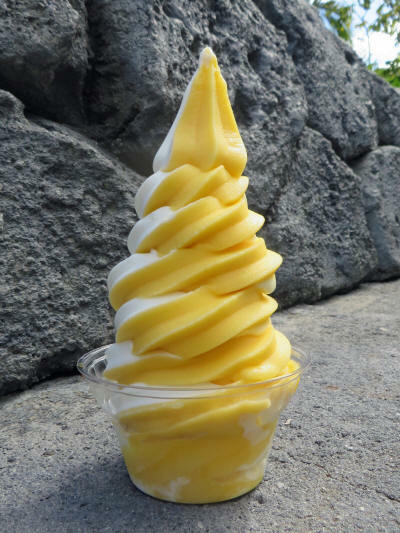 Carol had to have a Citrus Swirl and I wanted a Pineapple Float, so when she stopped at Sunshine Tree Terrace I carried on to Aloha Isle. By the time I returned with my float she was already grinning as she ate her swirl! Between bites she told me that her swirl was free. 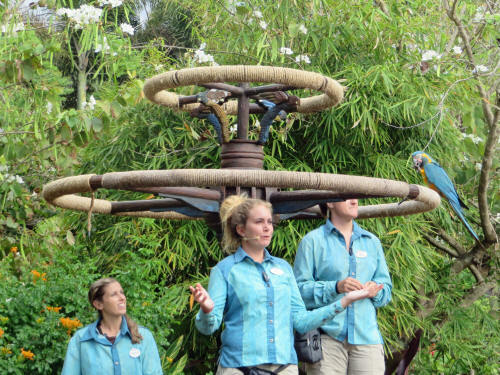 When the cast member serving her saw her Sunshine Tree Terrace T-Shirt he wouldn’t take her money. 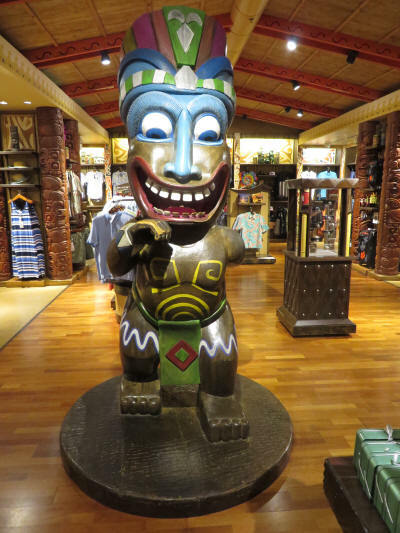 I guess I need to look for an Aloha Isle T-Shirt! After out treats we began our sorrowful walk to the exit. 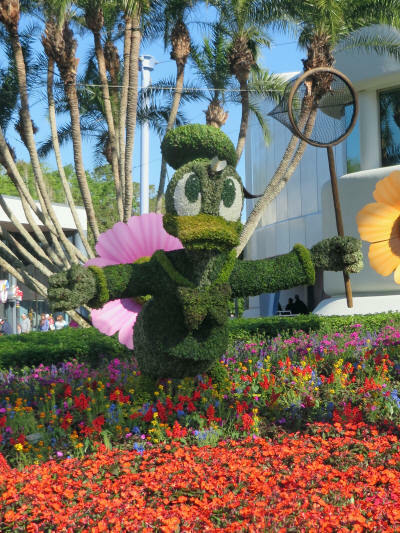 It’s always tough to say goodbye to Mickey. 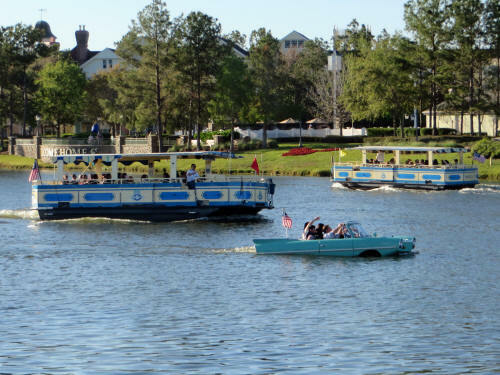 We left the park at about 11:45 and caught the boat back to Fort Wilderness. We took the dogs out for a walk and then hopped in the car and headed to the Character Outlet on Vineland Ave. Today they had lots of those Shanghai pins in stock so Carol picked some up for her collection and some to use as traders. After a stop at Chik-Fil-A for lunch we headed back to pack up for the trip home. It was sure easier to ‘prep’ for the trip home than in the past. I pulled up the rope lights we put down to outline the driveway, gathered up a few extension cords and packed away our Musket Mickey sign . . . that was all. Carol packed all of our clothing into a few big tote bins, gathered all the stuff we have to pack in the car, put away the appliances and wiped down the counters. We stopped for a break and took Jak, Blue and Jake to the dog park where they had a good run. They seem to know that something is up, it will be their last golf cart ride for a year! Once we got back to the campsite we packed up the car and Carol vacuumed the trailer. We were all done after just a couple of hours work, and we weren’t all hot and sweaty. What an improvement! Carol fed the dogs a bit early and we walked them along the canal before hopping on the golf cart and heading out to dinner at Trail’s End. It’s our traditional ‘last night’ dinner . 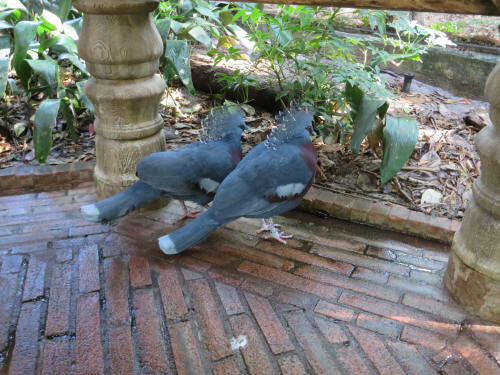 . . we both enjoy the buffet at Trail’s End. After dinner we dropped off our rental golf cart and walked home. We were back just before dark and settled in for a quiet night with the dogs. Tomorrow we hope to get on the road between 6:00 and 7:00 to get an early start on our 678 mile drive to Wytheville Virginia. It was a long day on the road, but we’re half-way home! We had hoped to get away between 6:00 and 6:30 a.m. but wouldn’t you know it . . . our internal alarms both failed on the same day. When I opened my eyes Carol had just gotten up with the dogs. It was 6:00 and we were going to be late! 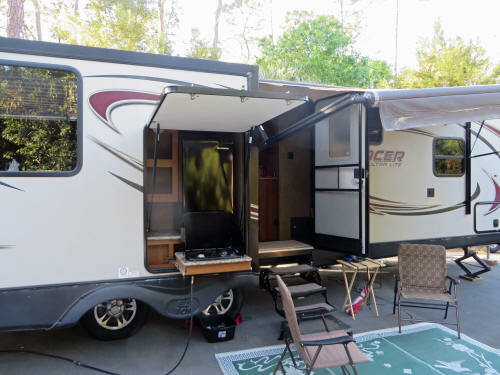 We scrambled to shower, feed and walk the dogs, pack up the last few things, wipe down the last few surfaces in the trailer, load everything in the car and get out of Dodge! We pulled away at 7:01 a.m. 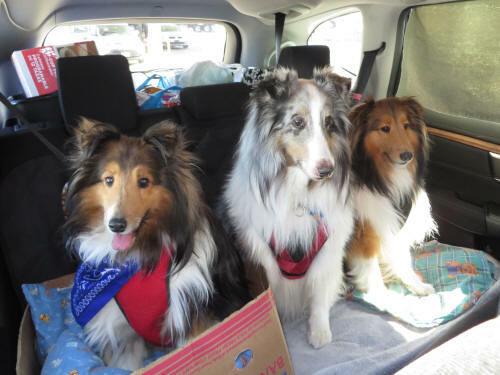 The dogs were set up in the back seat in their ‘Jack-in-the-box’ formation. Jak was in a banana box on the back seat, right behind Carol. Blue was in the middle and Jake was behind me, on the driver’s side. Everyone had room to sit up, everyone had room to lie down. They looked a lot more relaxed than they had been on the southbound trip! This is a drive we’ve done so many times that there is nothing new for us to see. In our first few years of RV’ing it was full of magic and adventure. Now it’s a lot more drudgery than adventure for us. We’re anxious for the drudgery to be over, we’re anxious to get home! 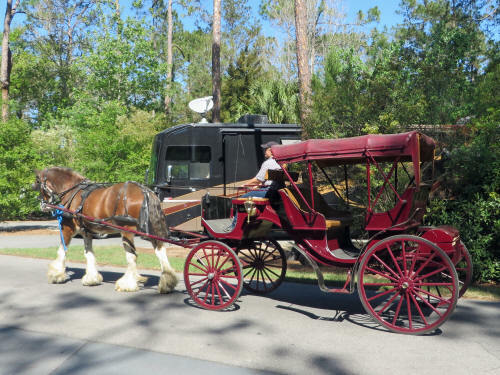 Traffic was horrible in Orlando. 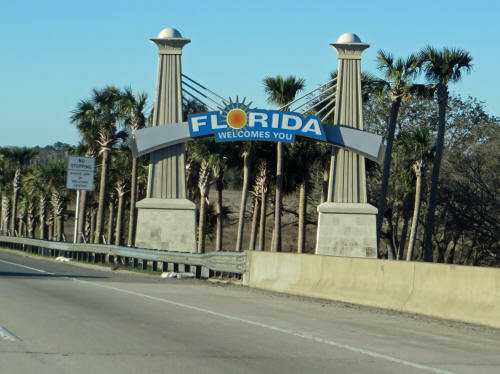 The construction on I-4 combined with rush hour traffic was horrendous; it took a full hour before we cleared the traffic and hit normal highway speed on the eastern outskirts of the city. Once we turned onto I-95 we stopped at a McDonalds and picked up a quick bite of breakfast which we ate on the fly! We crossed the Florida/Georgia line at 10:35 and pulled into the Georgia Welcome Centre to walk the dogs. 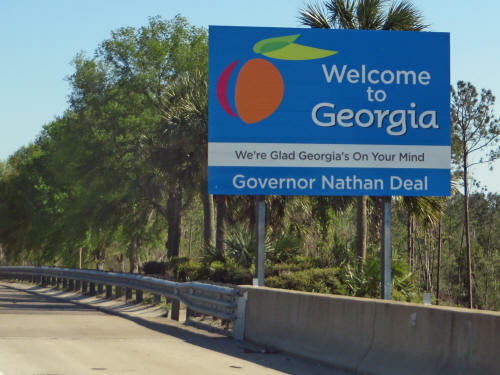 We made good time under clear skies, stopped in Northern Georgia to gas up and quickly got back on the road. At noon we pulled off at a rest area off I-26 and walked the dogs, then Carol pulled some sandwiches and cold drinks out of the cooler. We hopped back in the car and ate lunch as we gobbled up some more miles. Our second fuel stop was at Rock Hill South Carolina and we let the dogs stretch their legs again. Things took a turn for the worse as we approached Charlotte North Carolina at about 4:15 p.m. Once again it a combination of construction and rush hour traffic. 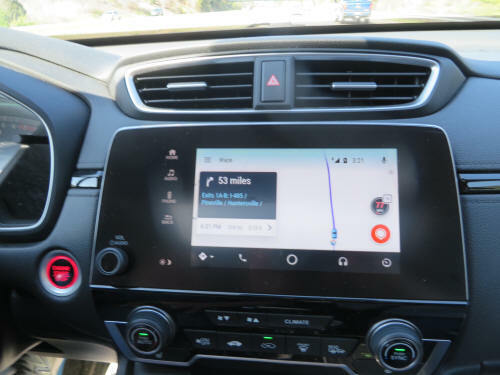 Our GPS originally plotted a route along the I-485 bypass but as we approached Charlotte, Waze changed the route and directed us through the heart of the city. 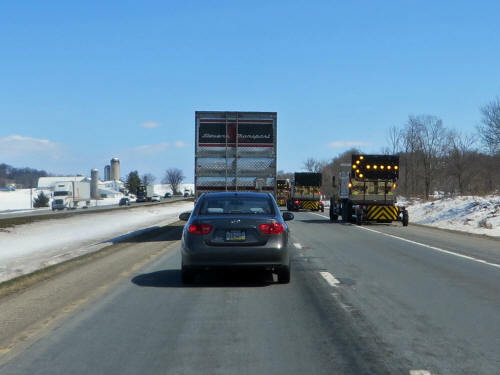 Yikes - it was slow - bumper to bumper, creep and crawl for about 10 miles! 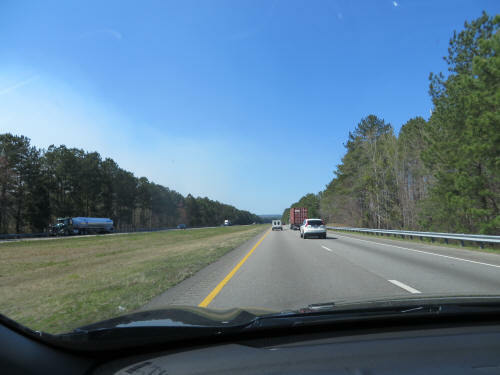 Once we passed the northern junction of I-77 and I-485 things picked up quickly and we were back to full speed. We made a quick stop to walk the dogs at about 6:00 p.m., just before we started up the big hill at the North Carolina/Virginia Line, then we started the climb. There was very little traffic, we passed about three trucks on the way up and found a few small patches of snow in the shaded areas at the top. Once we started down the other side of the Blue Ridge range the snow quickly disappeared. Obviously the 6” of snow in the forecast we heard the day before had not materialized. That’s a good thing! Hopefully we won’t see any more on our way home! 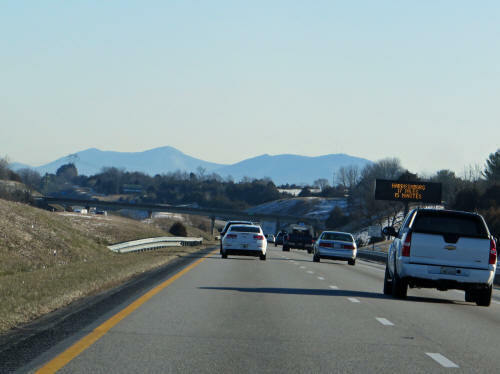 We pulled into the Red Roof Inn at Wytheville Virginia at 7:00 p.m. Those traffic delays in Orlando and Charlotte set us back at least an hour-and-a-half! We dragged the stuff we’ll need overnight out of the car and tossed it in the room. Carol fed and walked the dogs while I went out and picked up dinner which we ate in the room. It will be a quiet night of television and an early night to bed; we have another 733 miles to cover tomorrow and we’ll need an early start if we want to get home by early evening. I’ll spare you most of the details . . . let’s summarize it like this: Awake at 5:45 . . . walk and feed the dogs . . . shower and breakfast . . . on the road at 6:45. Drive, drive, drive, stop for coffee, walk the dogs, blah, blah, blah! 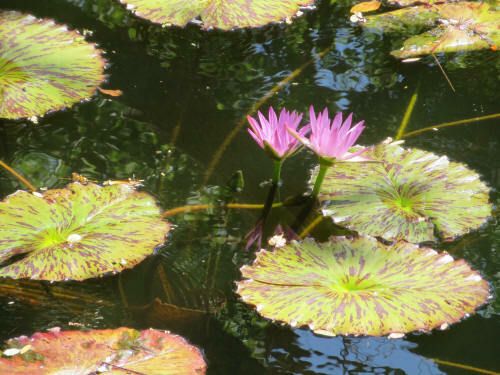 No sooner had she taken the wheel and I nodded off – we ground to a complete stop. We sat dead still for ten minutes then it was creep and crawl for ten miles. It took a full hour to cover those ten miles. Yikes! As it turned out, there was no evident reason for the delay. We didn’t see anything other than a few construction trucks. They might have been setting up some construction signs - one truck was loaded with lumber. We were delayed a whole hour and there was no apparent reason for the hold-up! Once we started moving again I was totally refreshed. Carol pulled over; we swapped seats and carried on. Drive, drive, drive, stop for the dogs, get a coffee, drive some more. We stopped at a rest area at Preble, New York to give the dogs their final stretch before we hit the Canadian border. They just love having snow to ‘do their business’ on . . . will they have any at home? There was hardly a line when we approached Canada Customs. We pulled up, answered about three questions and they waved us through. 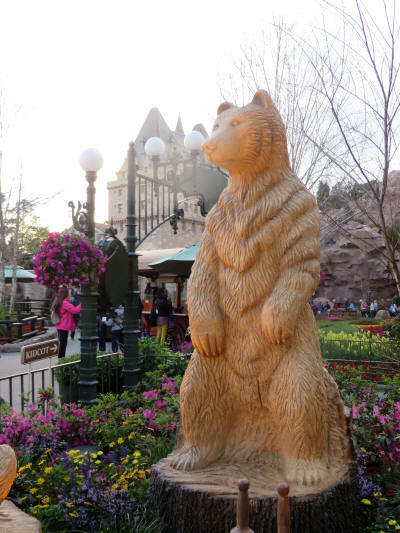 As much as we love vacationing at Walt Disney World, it always feels good to be back in Canada! We took a quick left turn and followed Highway 401 west for about 28 miles, then we were home. I had the car unpacked within a half-hour and Carol started putting it all away. It was a great vacation. We both had some trepidations about renting an RV, but it worked out extremely well. So well, in fact, that we’ve already reserved the same trailer for next year.